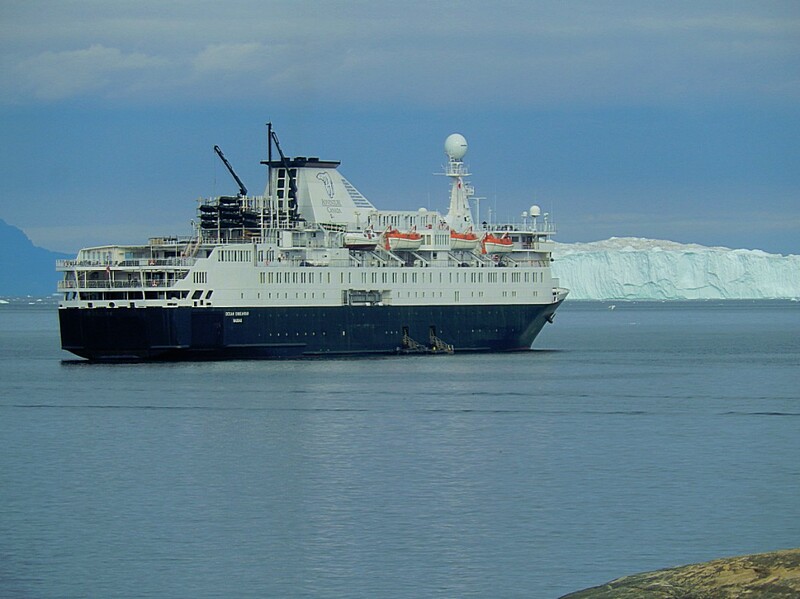 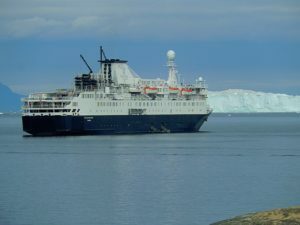 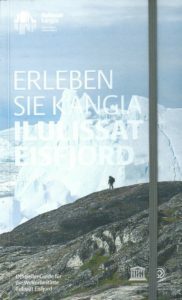 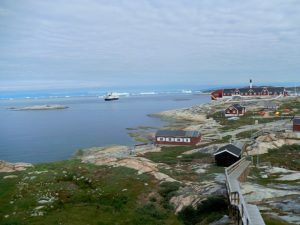 Early in the morning after a very good breakfast with lots of sea food at the Arctic Hotel, The Wandelgek took the hotel’s transport van to the World of Greenland Office from where he started his hike. 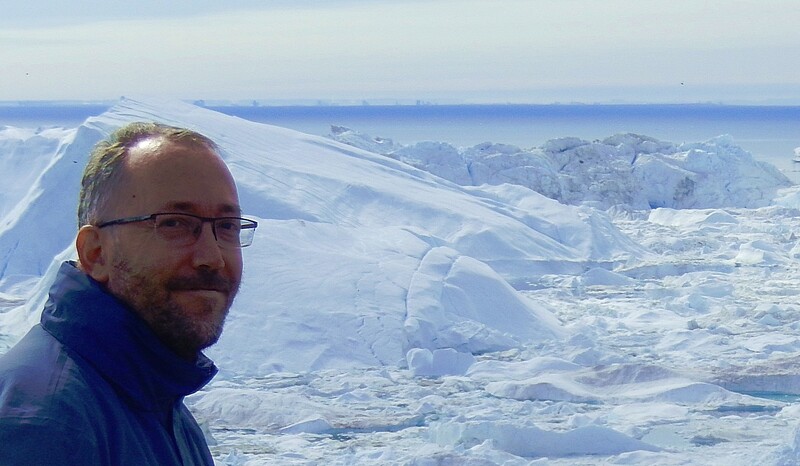 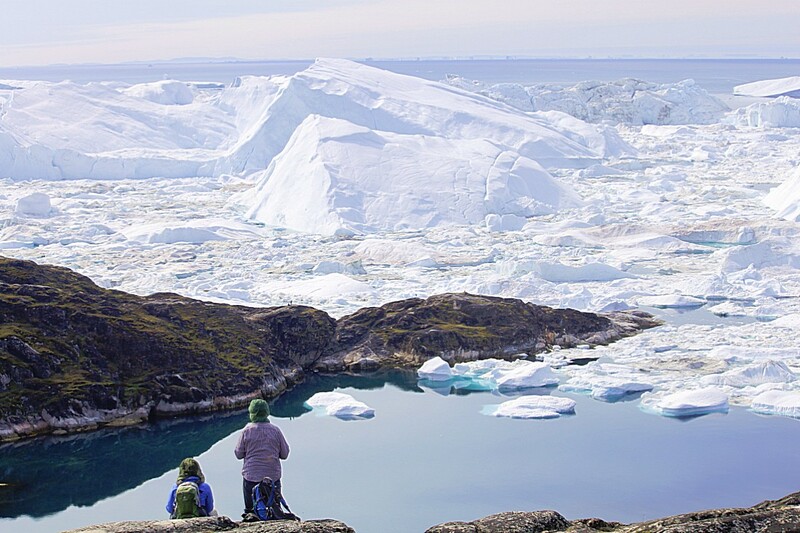 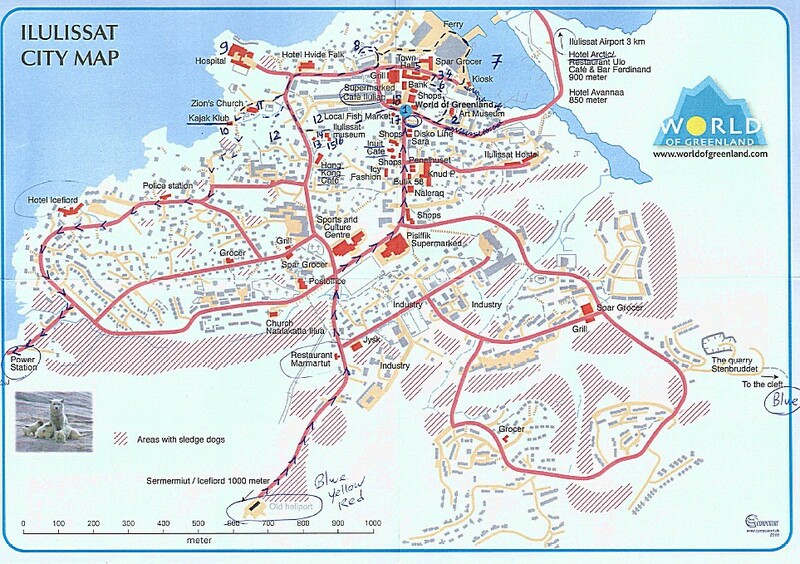 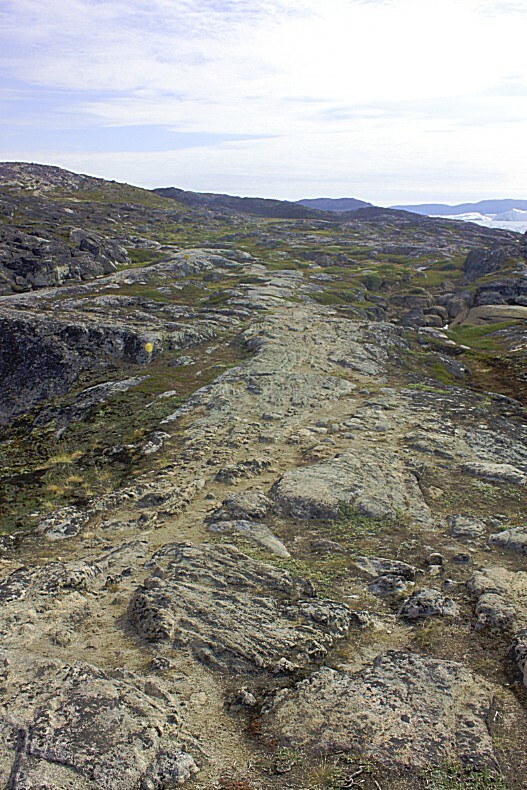 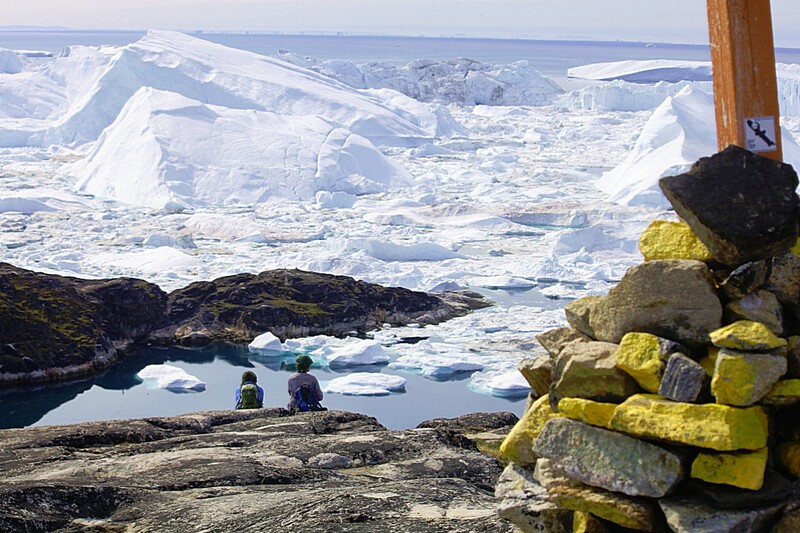 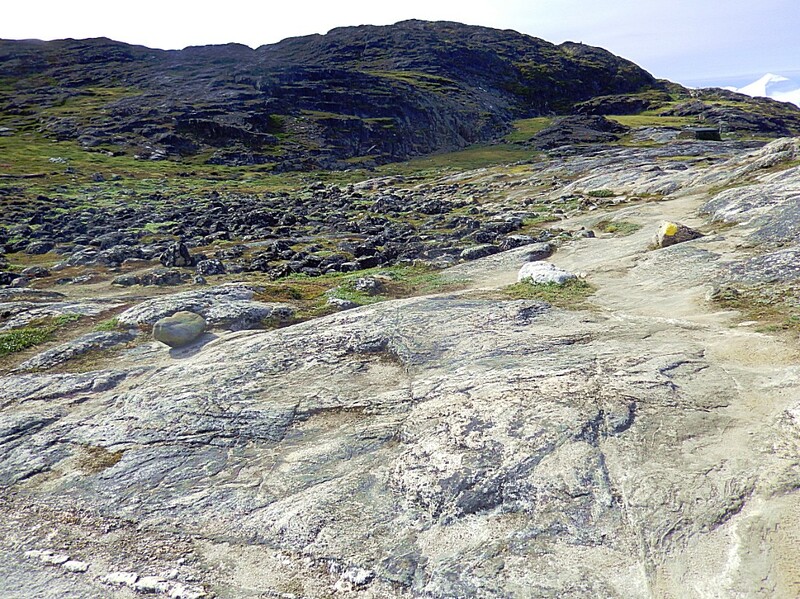 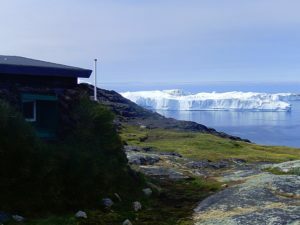 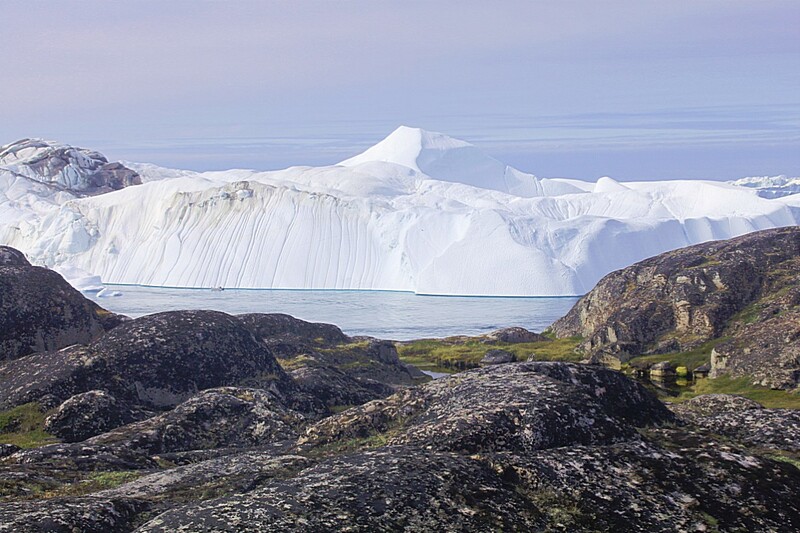 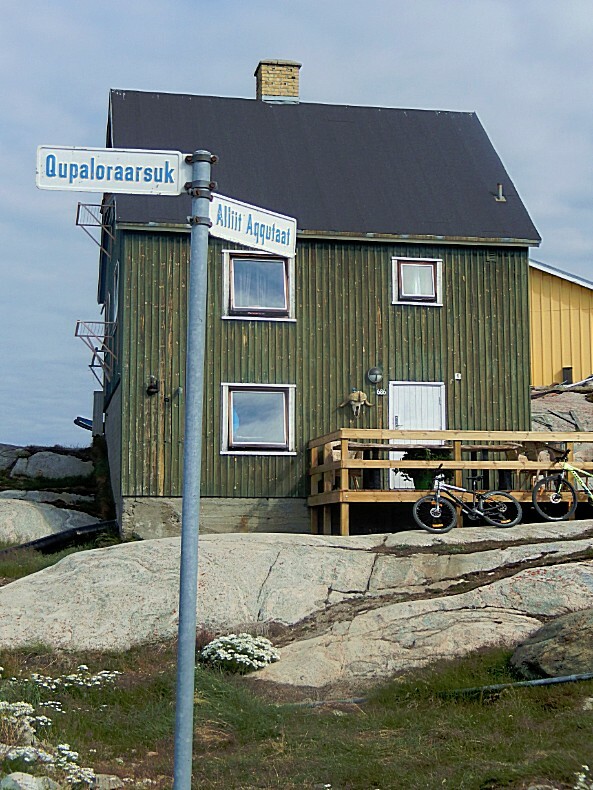 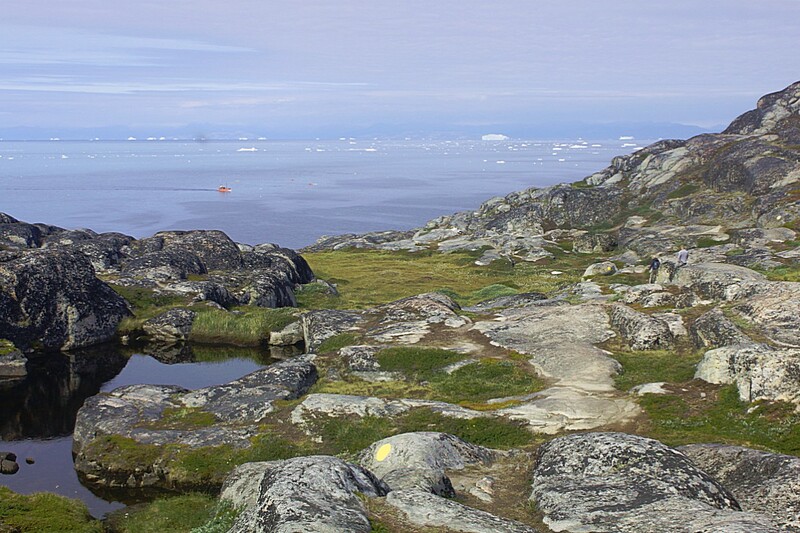 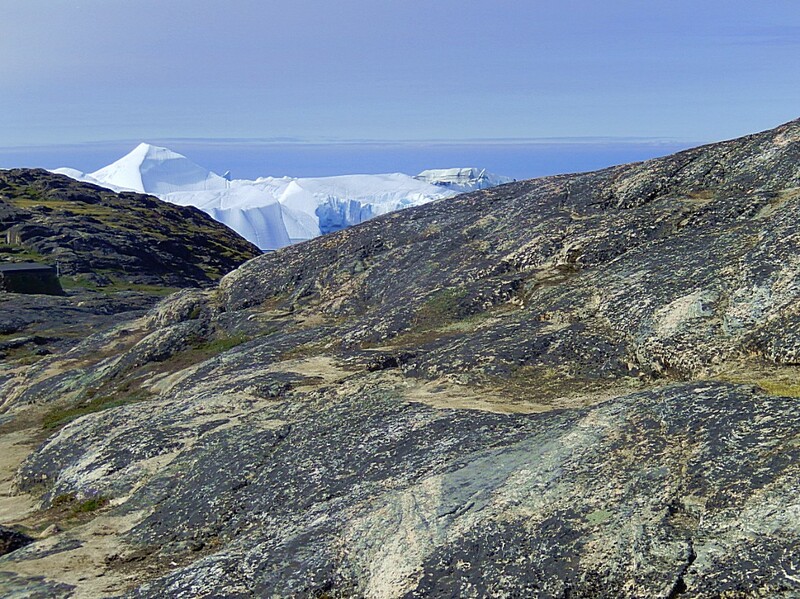 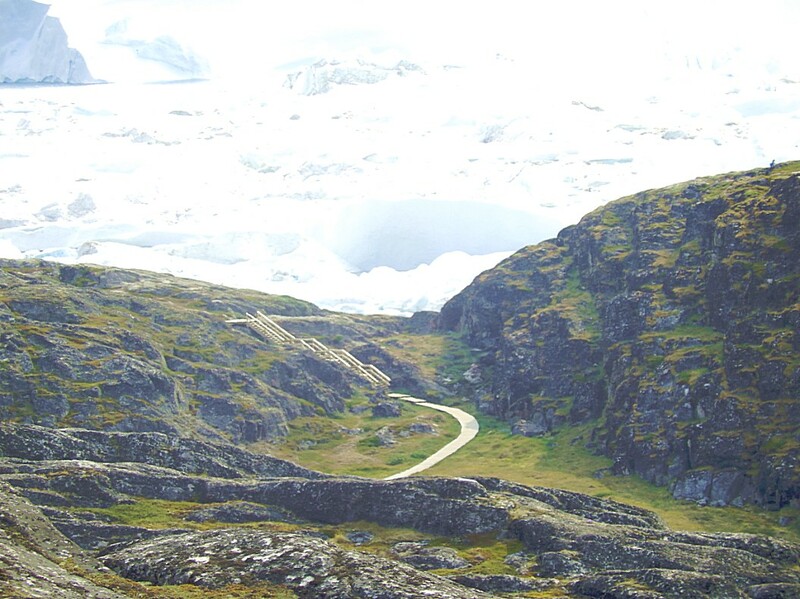 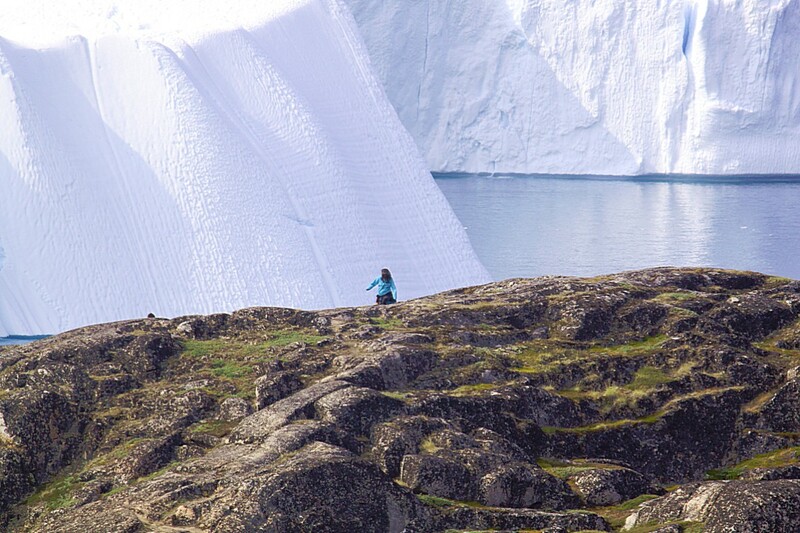 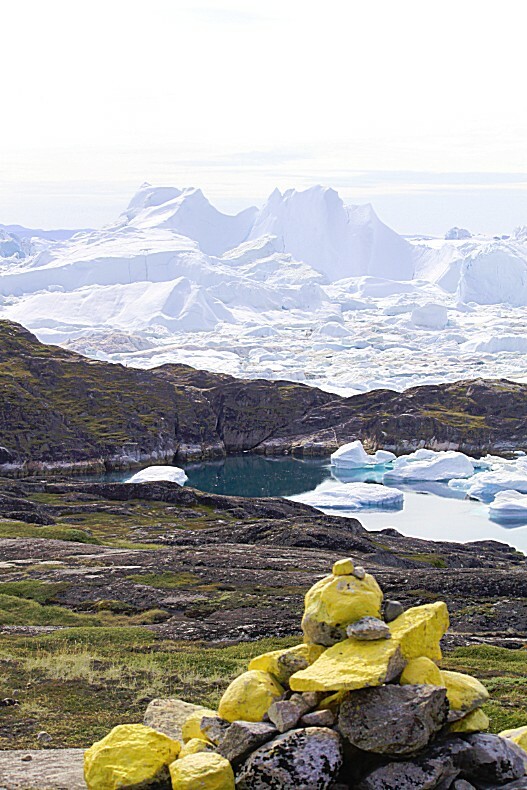 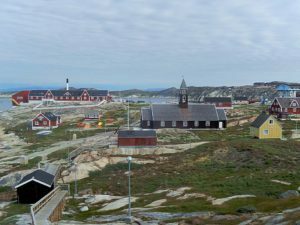 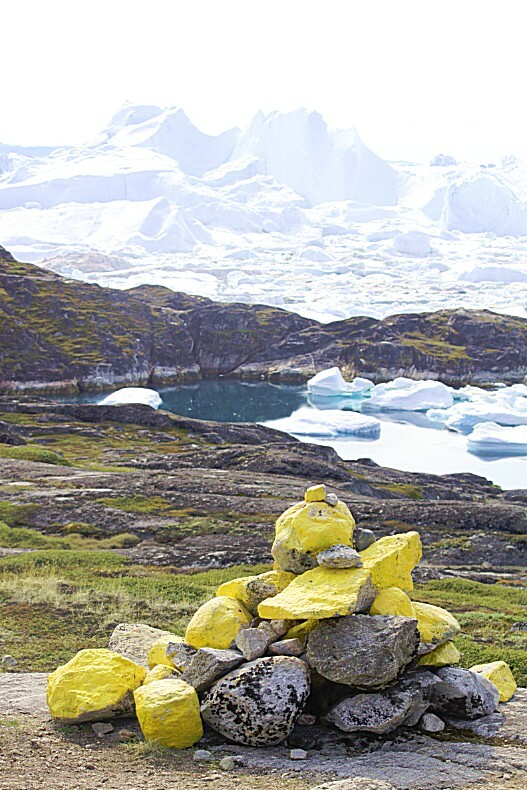 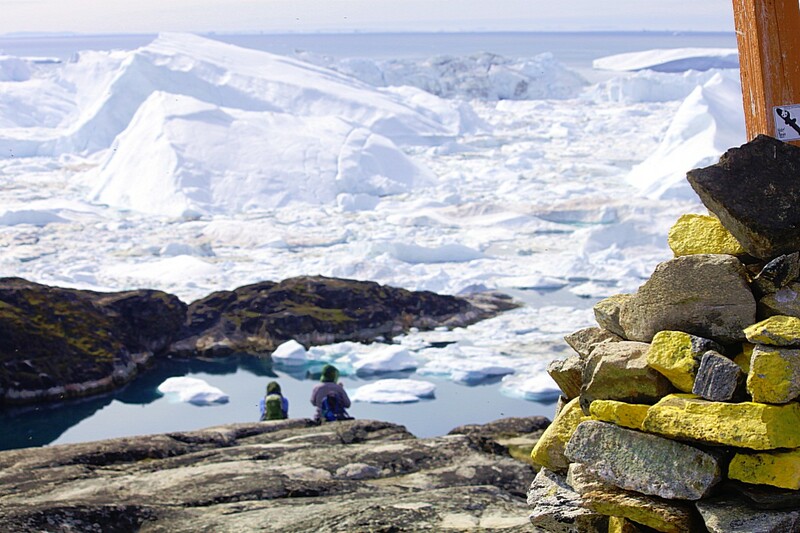 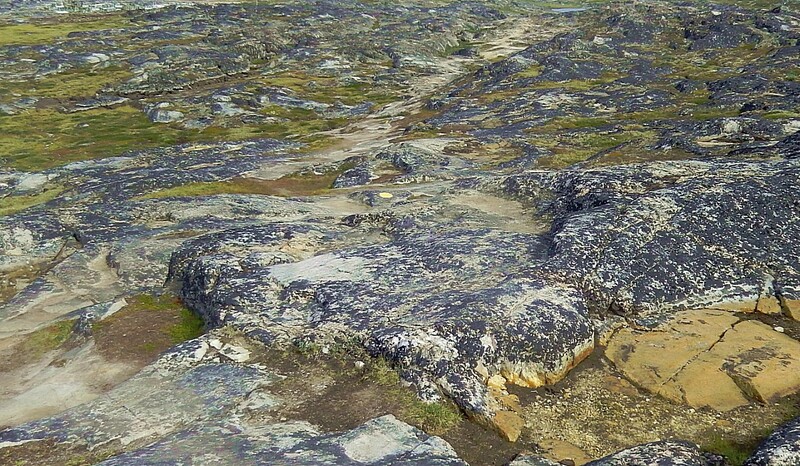 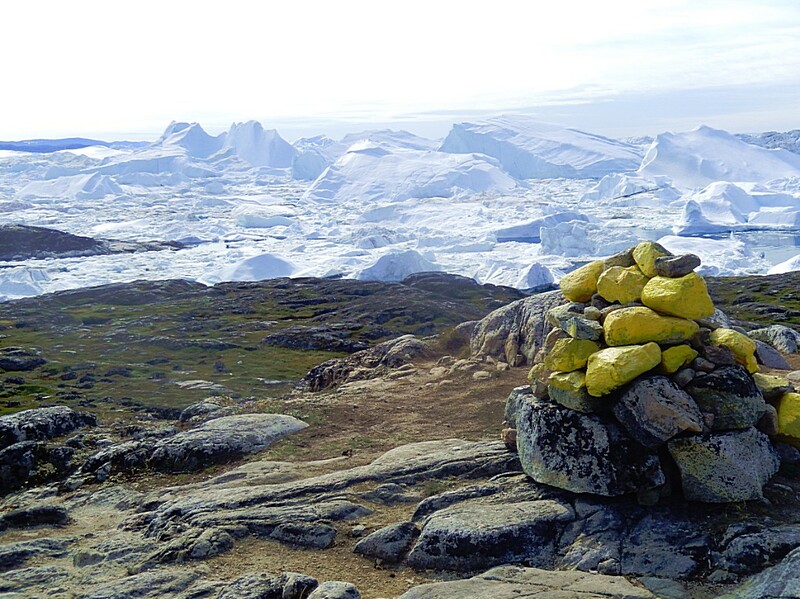 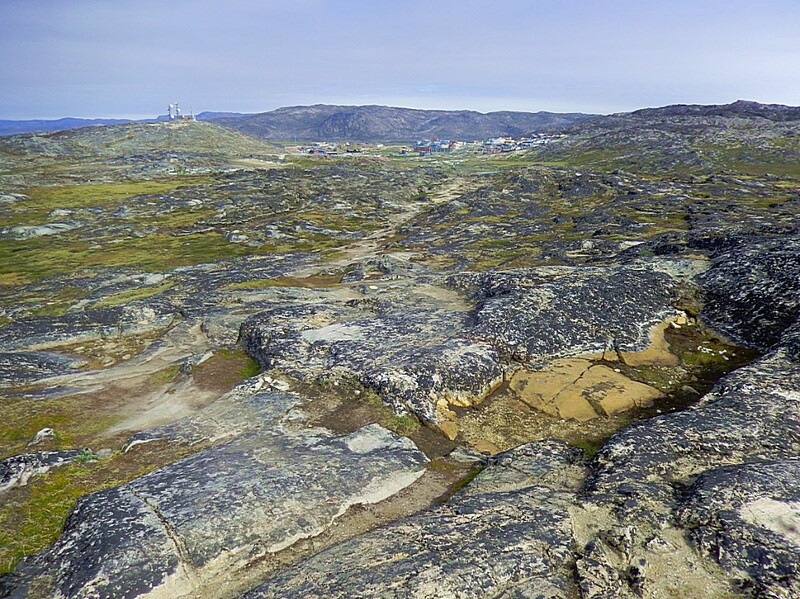 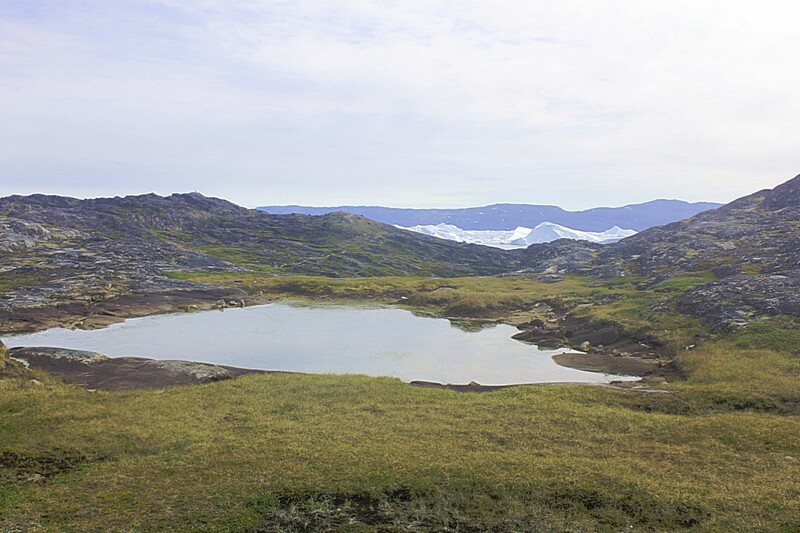 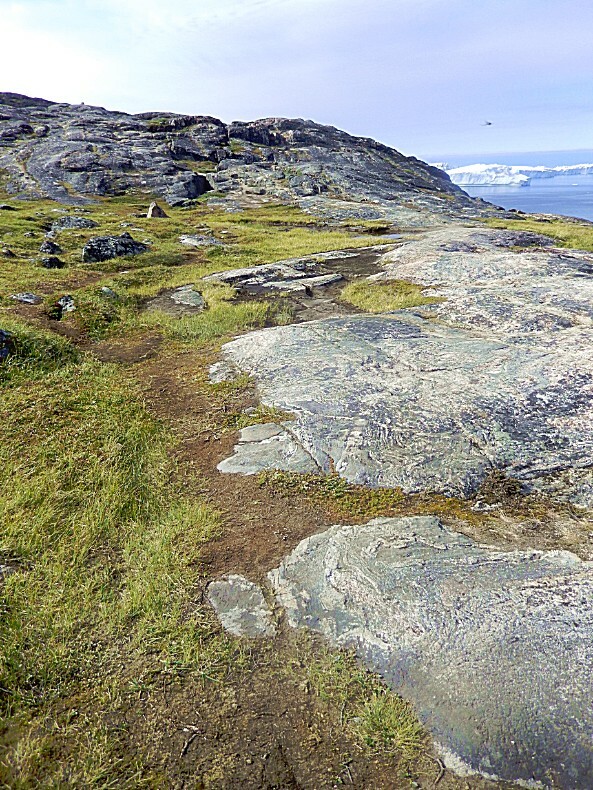 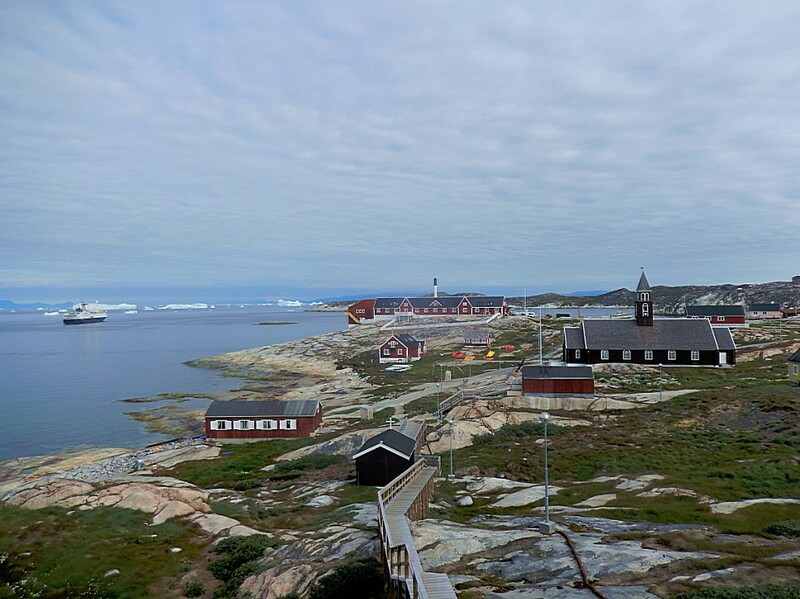 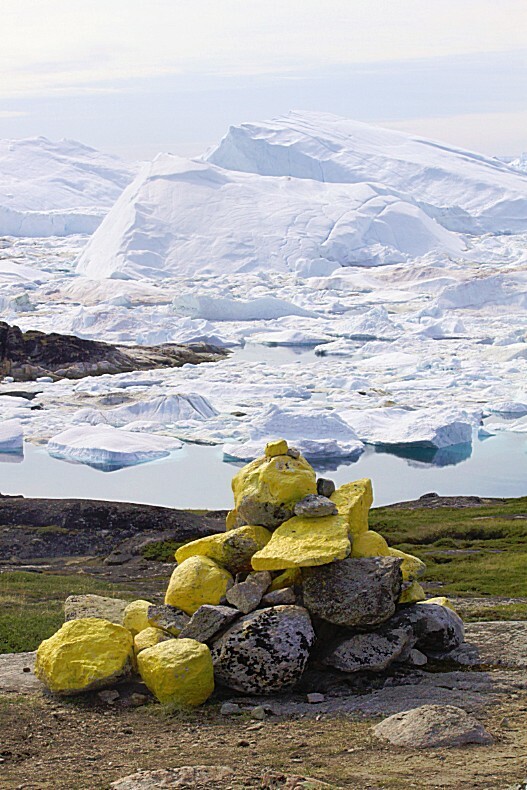 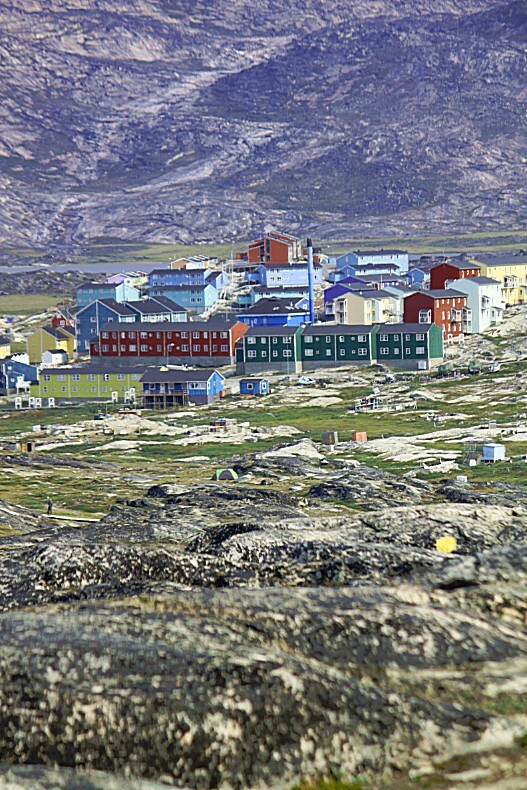 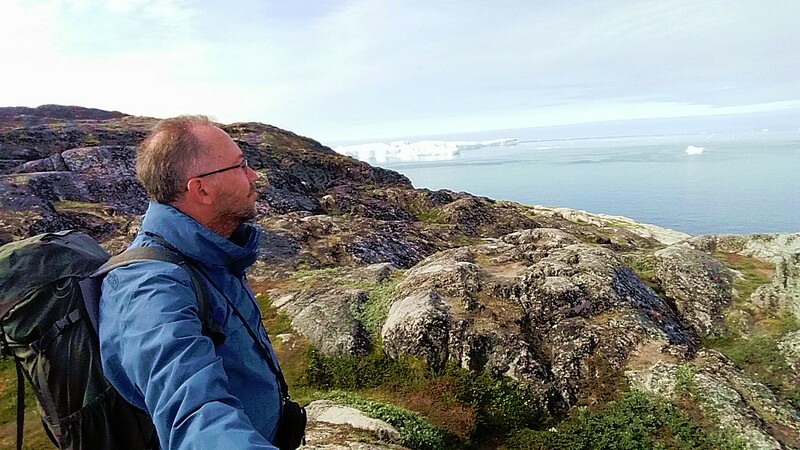 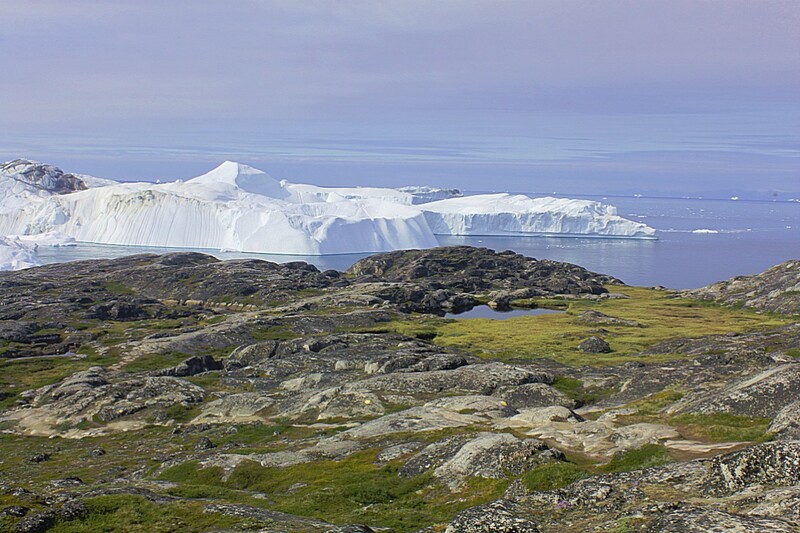 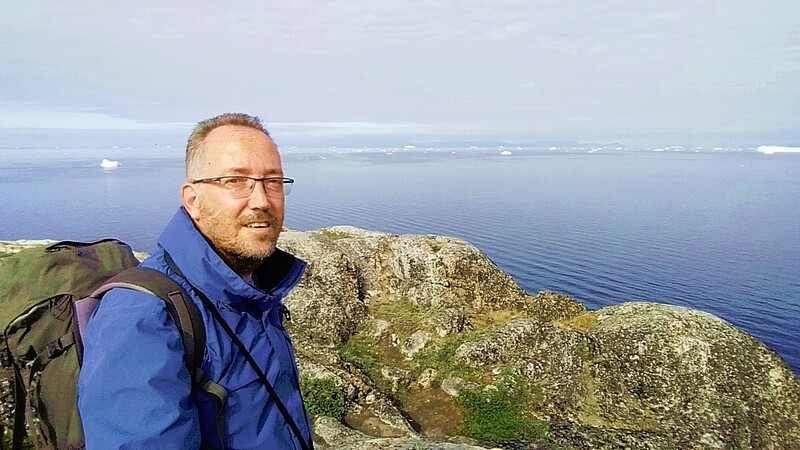 The first part of the hike was the route through Ilulissat toards the Elvaerket (= Electricity Plant) where the official start of the Yellow trail was. 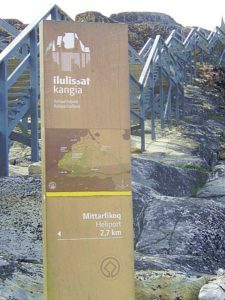 For the first part of the walk I decided to walk along the coast as much as possible. 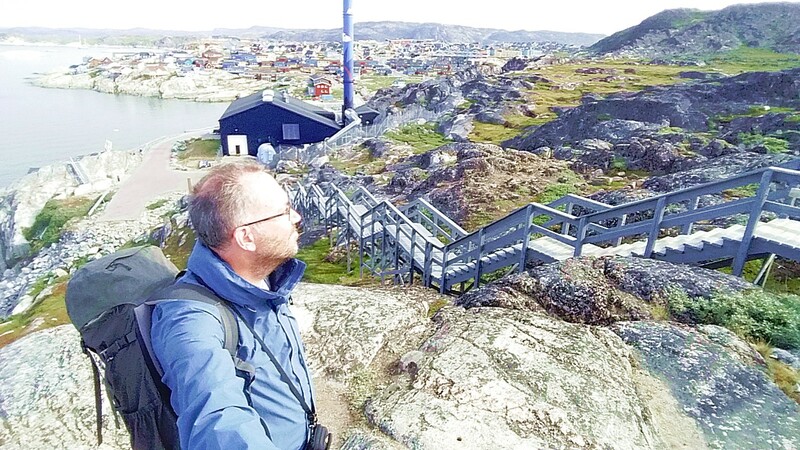 I rewalked my earlier route from the World of Greenland Office towards the Zions Chuirch and then went south and immediately upwards via wooden stairstowards the road Qupaloraarsuk and via Jørgen Sverdrupsvej and Minnerup Aqq. 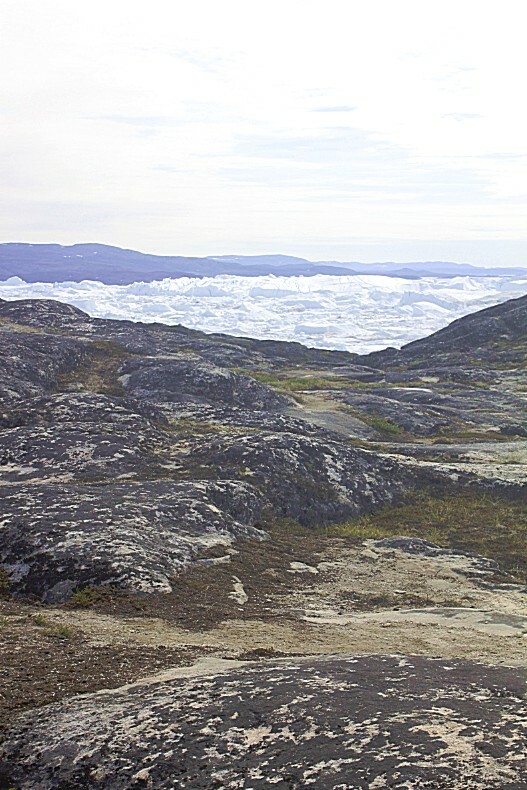 towards the Elvaerket (Power station). 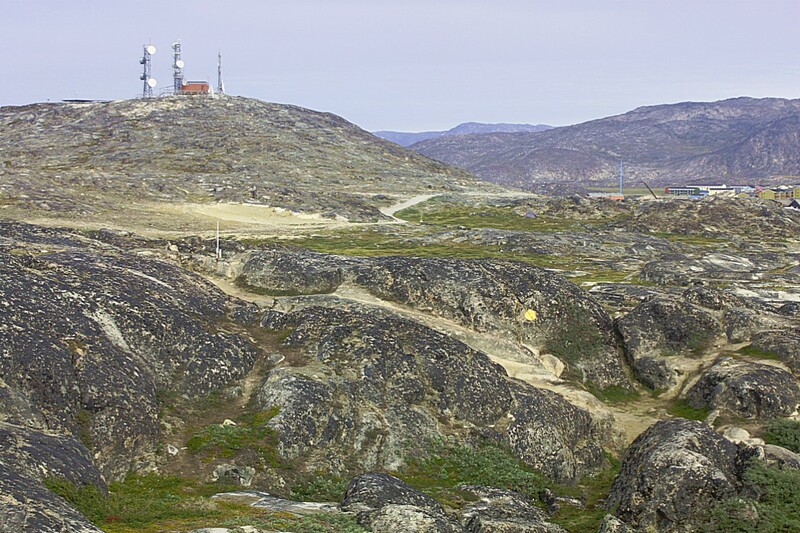 The Yellow Trail is a 2,7 kilometres/1,5 – 2 hrs walk from the Elvaerket to the GL Heliport. 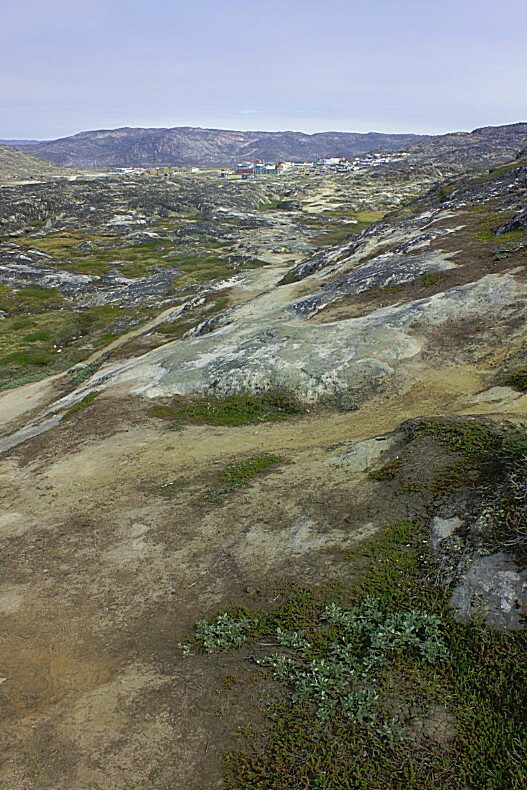 From the Heliport 2 (or 3) other trails start, but more of that later. 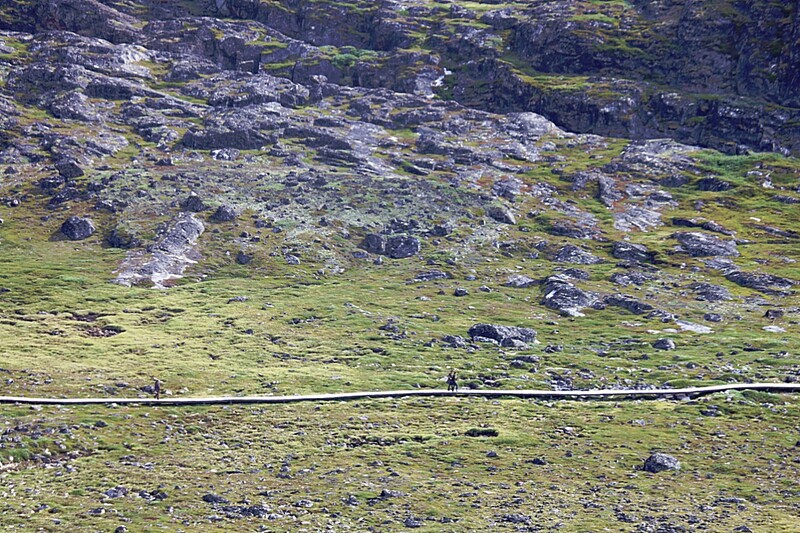 Then I saw on the right a little hut and the trail was going straight to it. 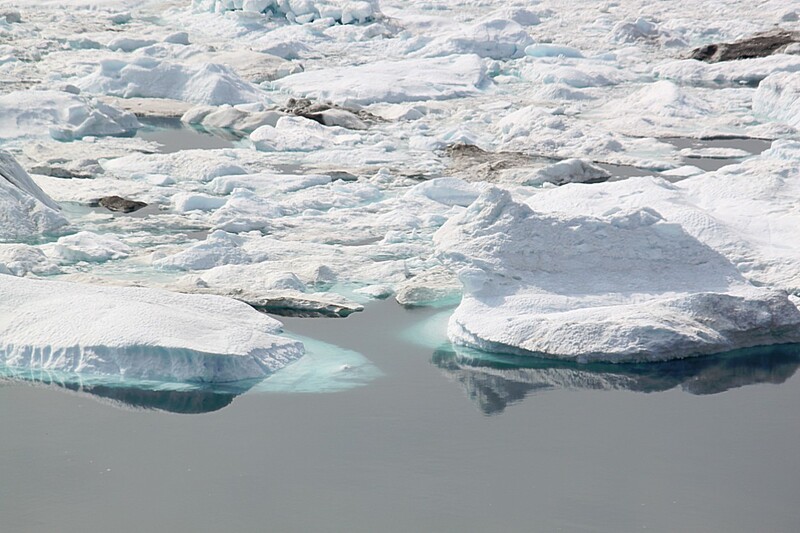 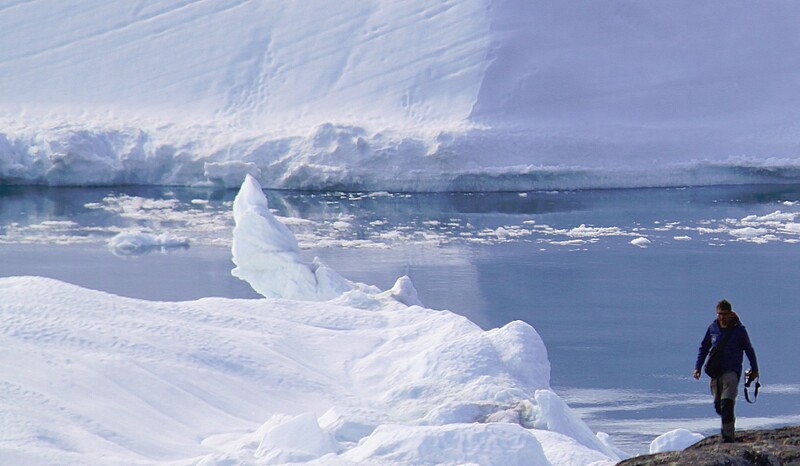 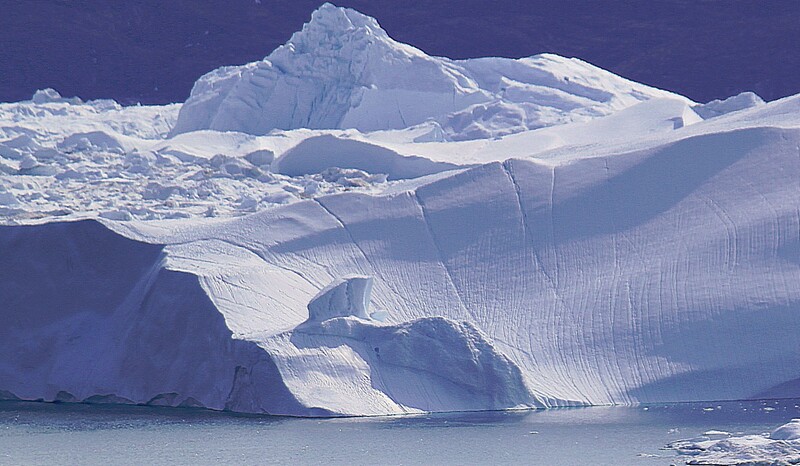 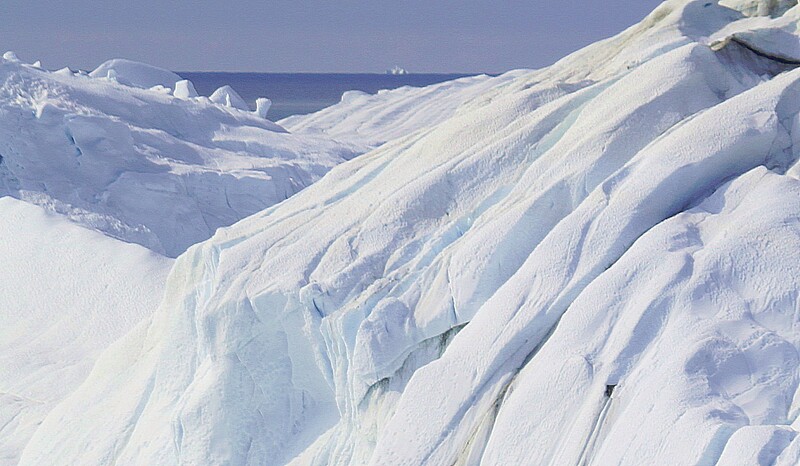 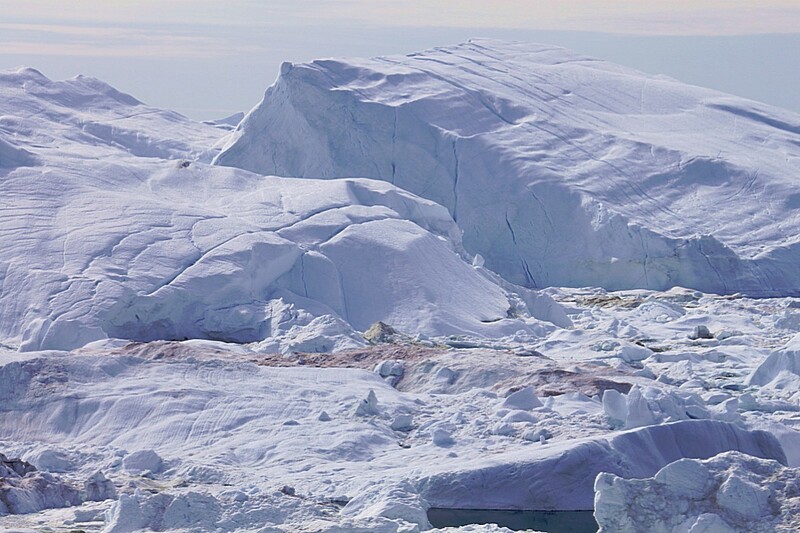 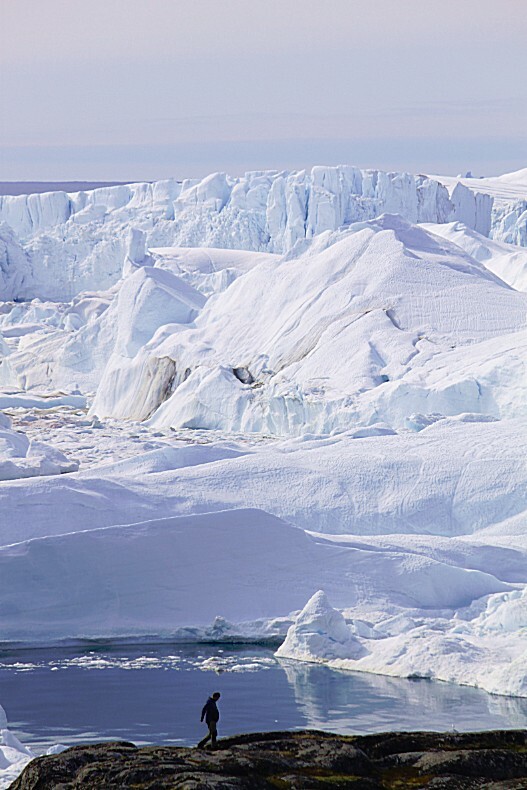 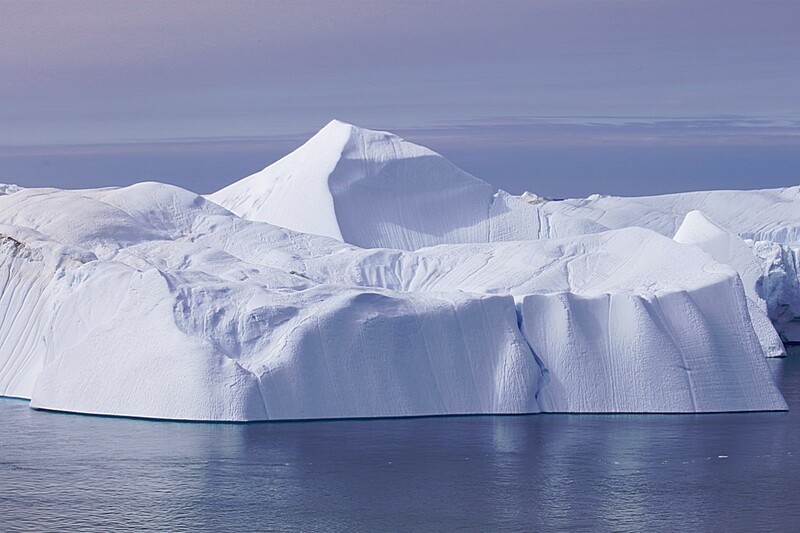 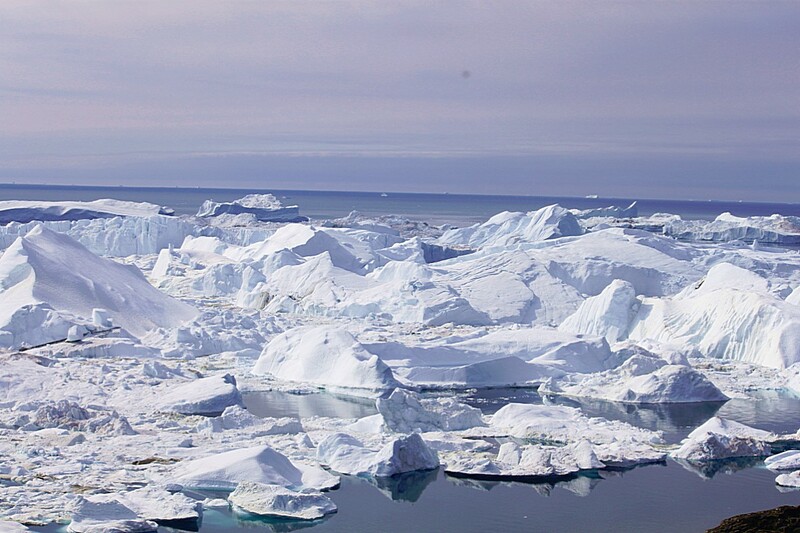 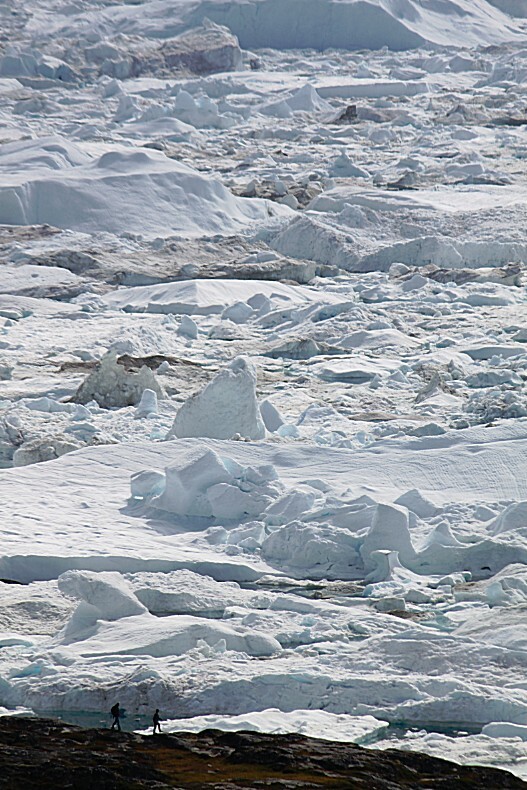 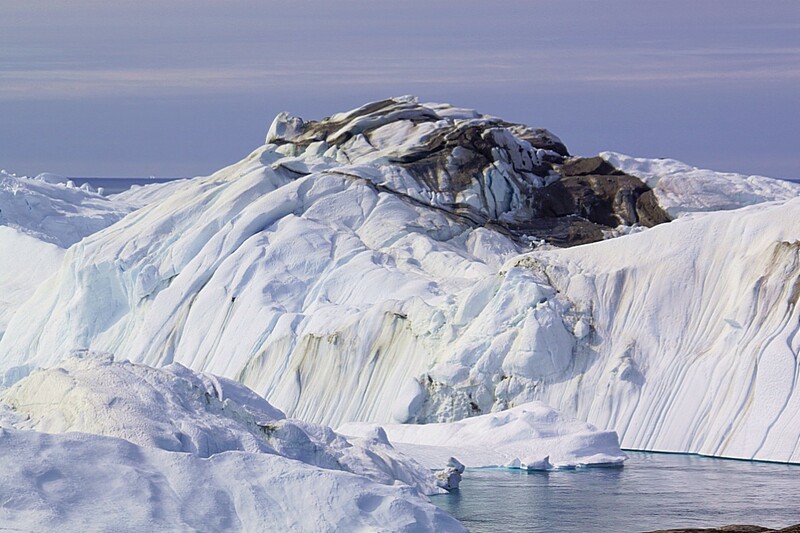 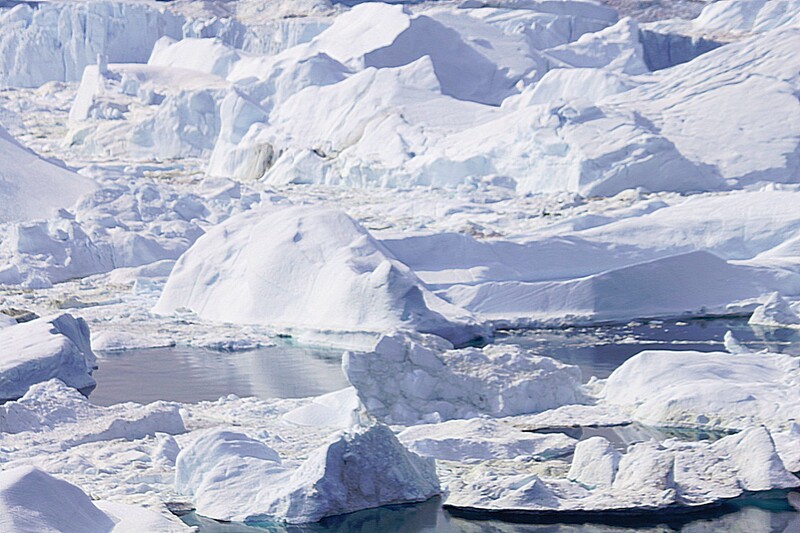 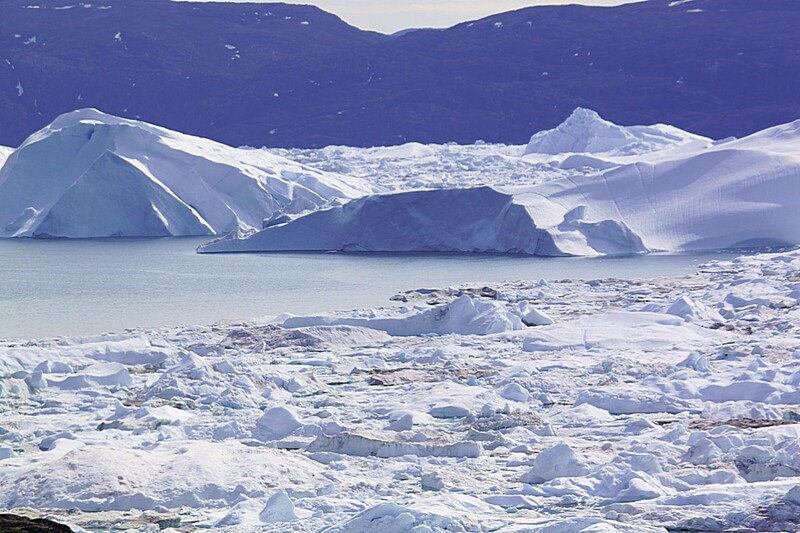 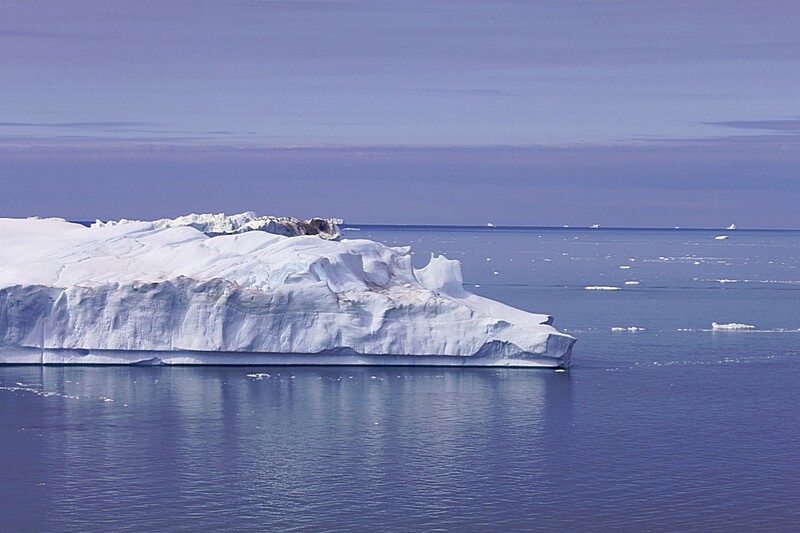 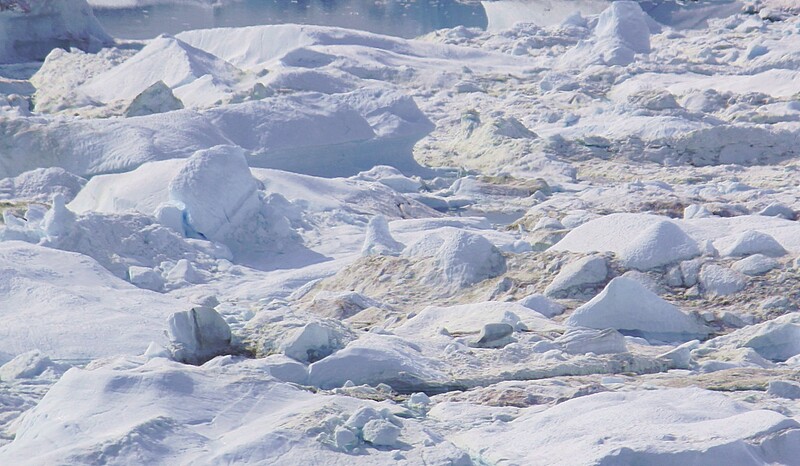 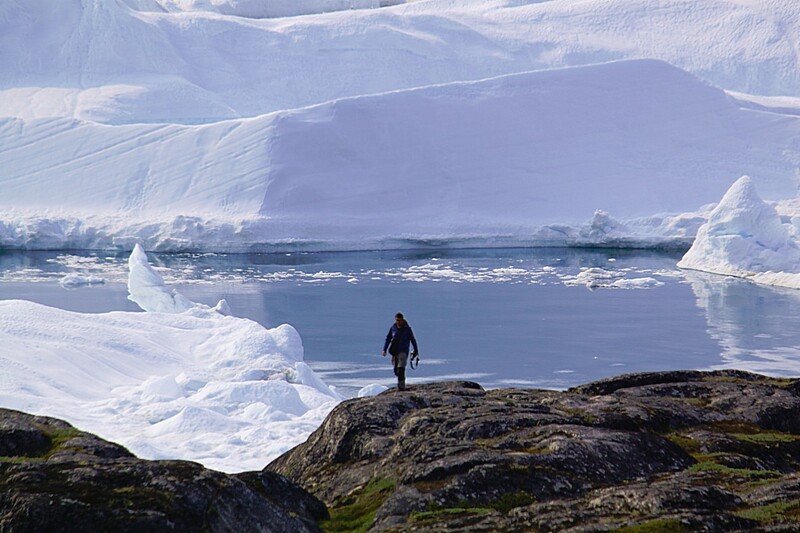 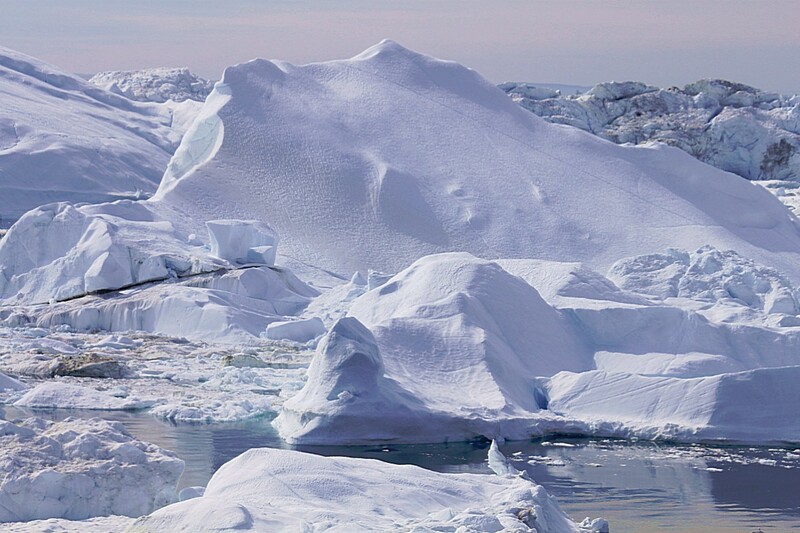 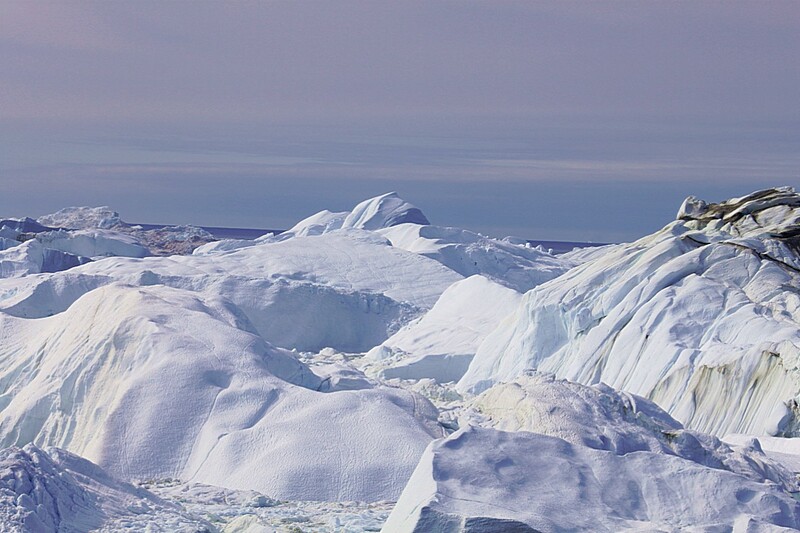 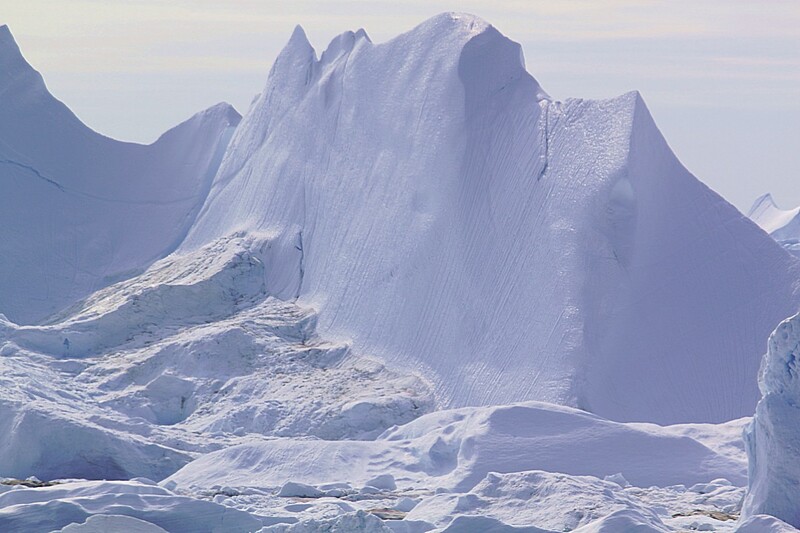 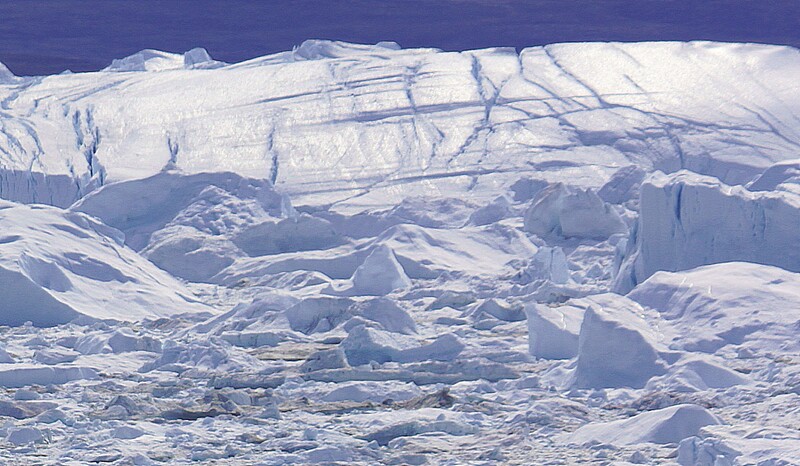 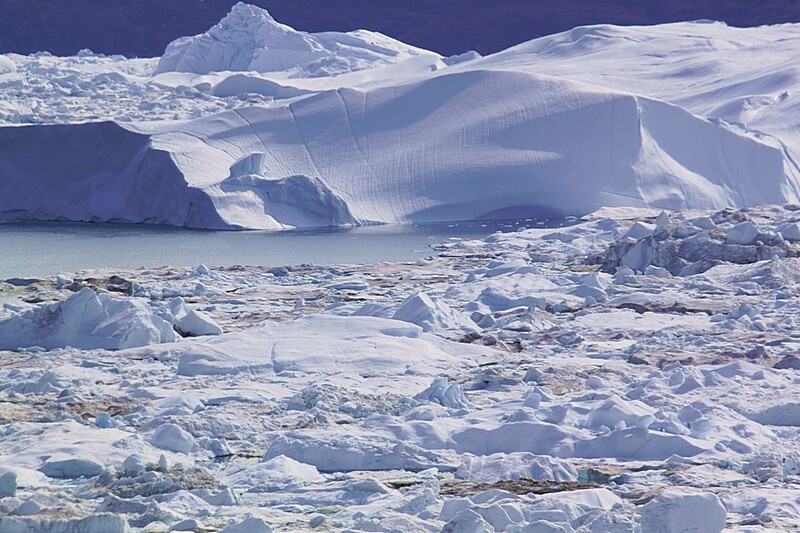 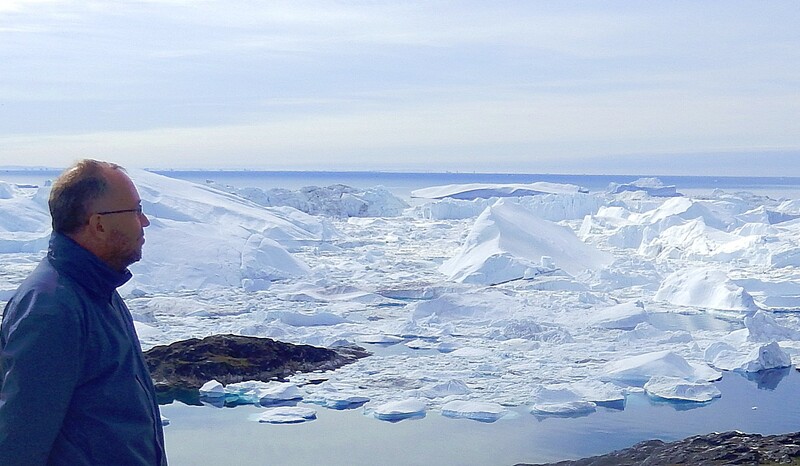 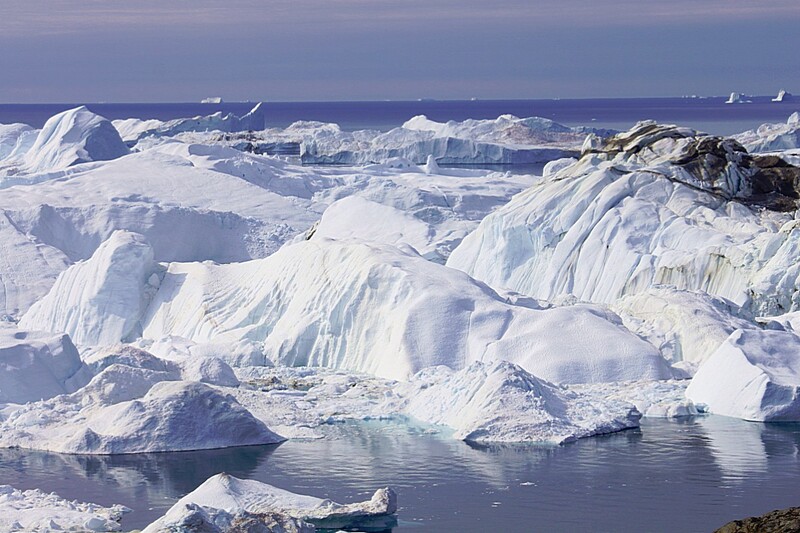 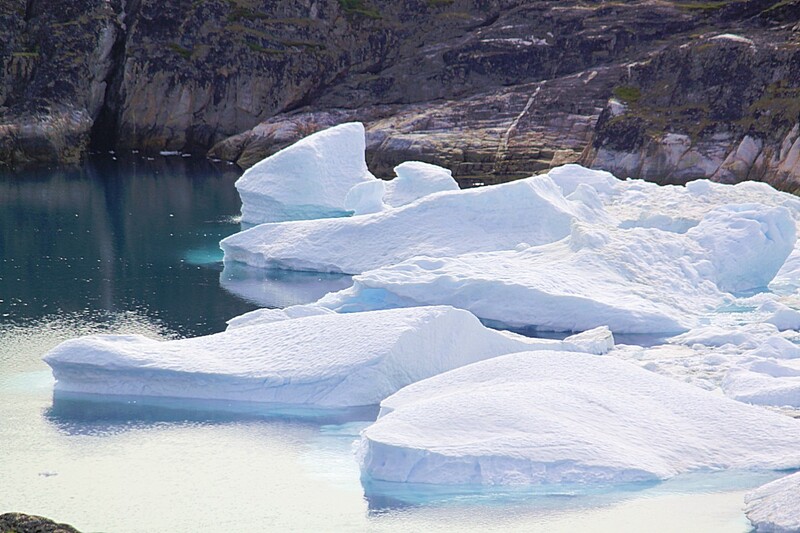 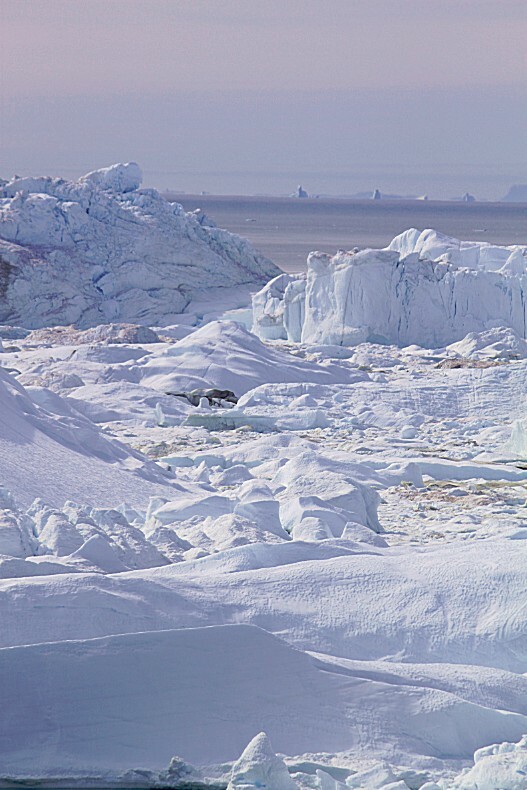 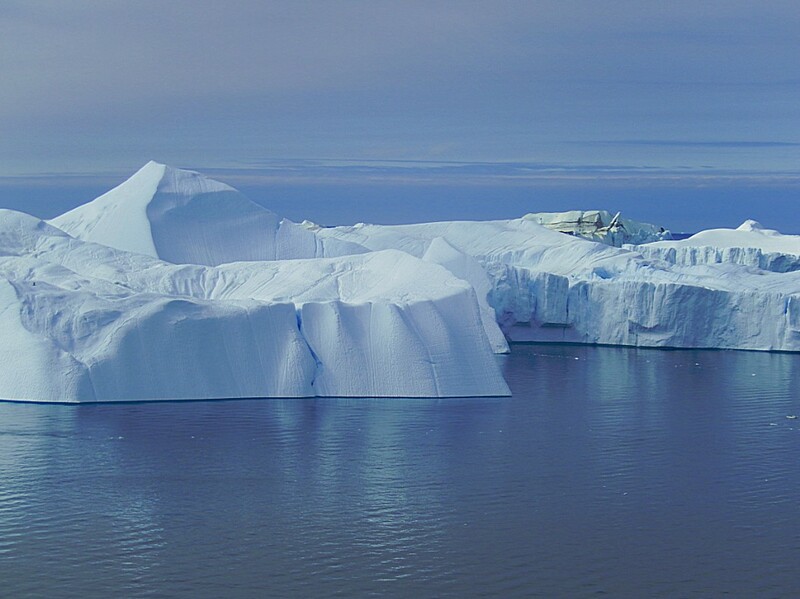 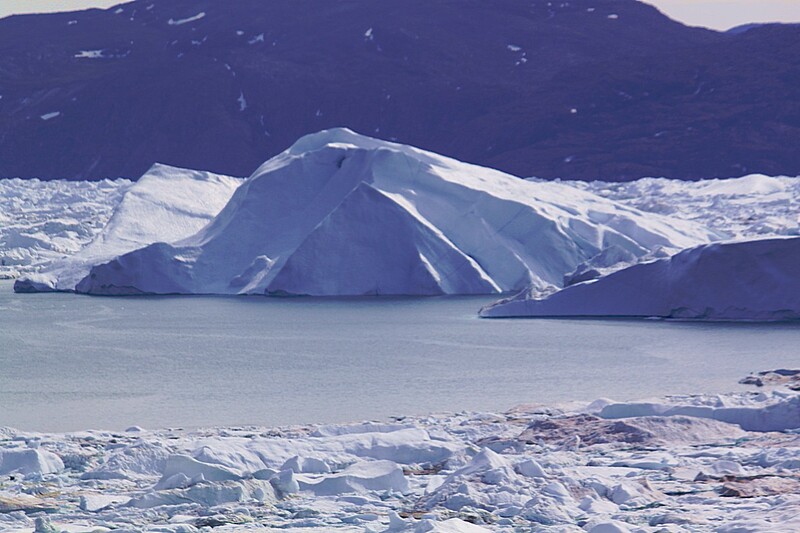 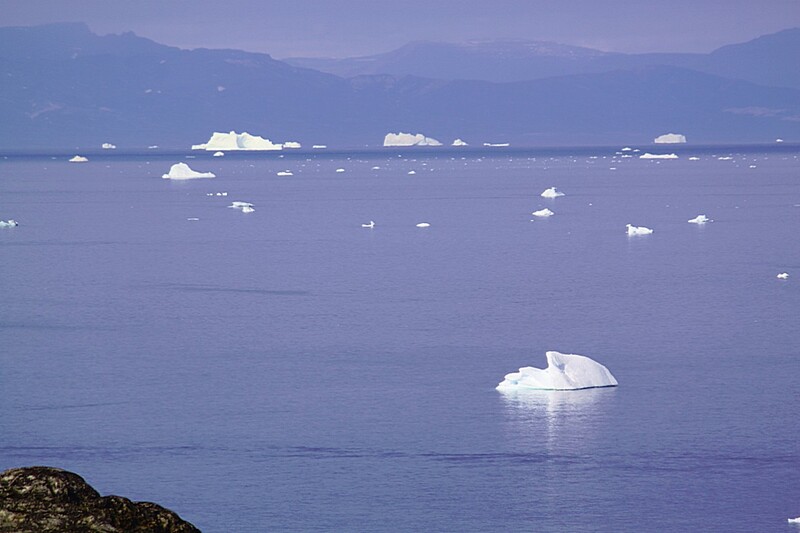 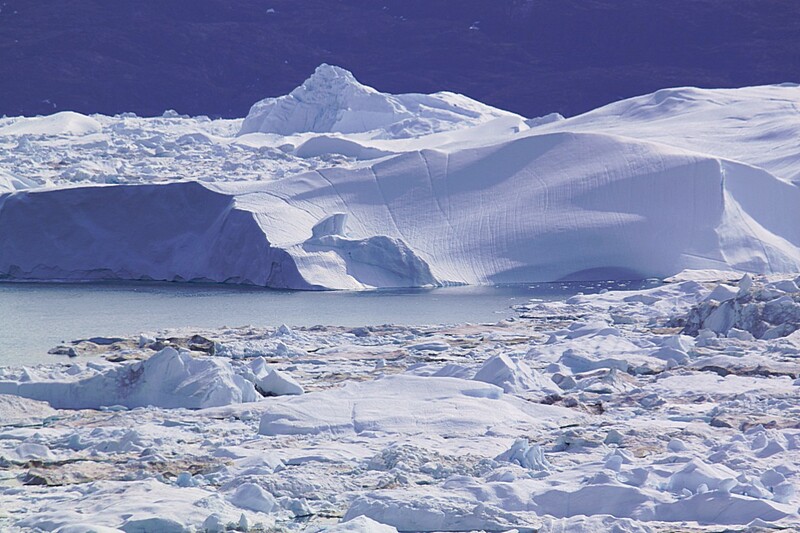 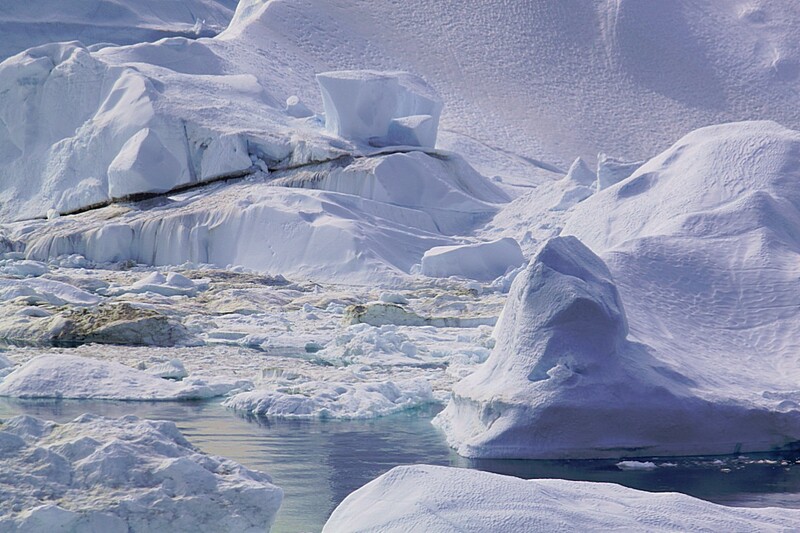 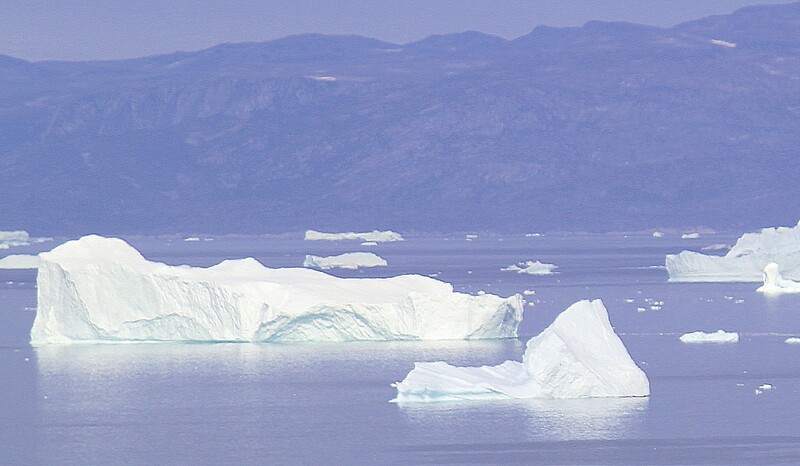 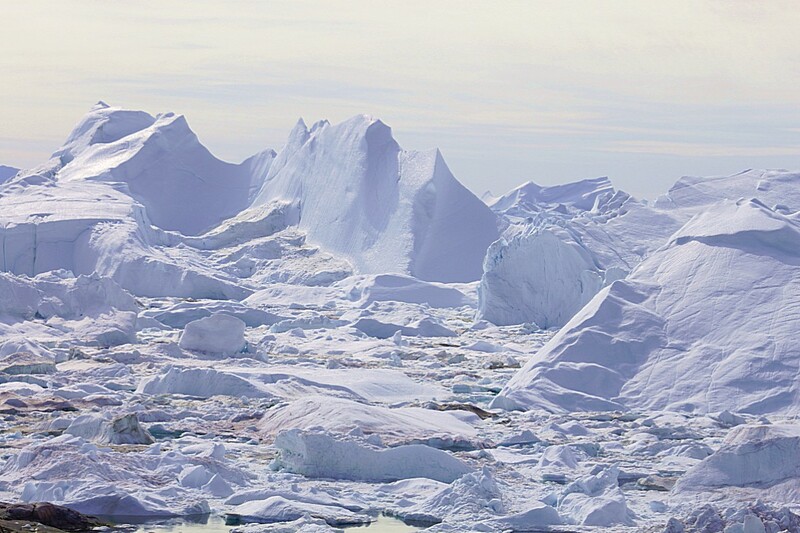 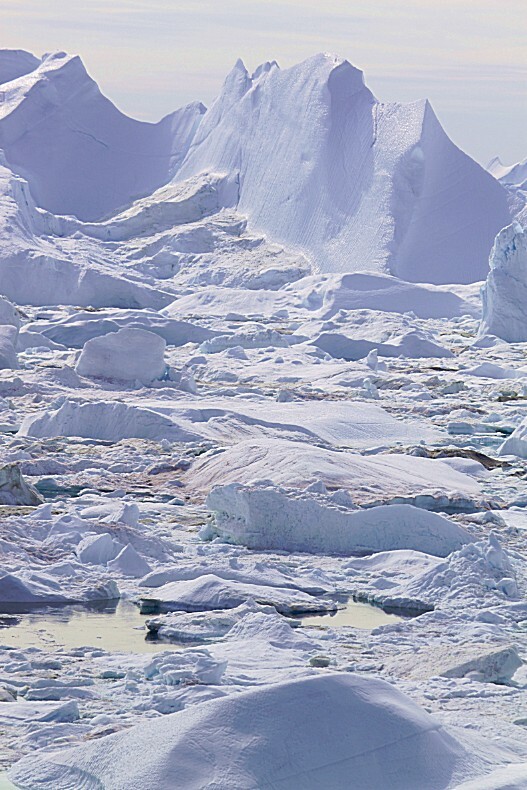 The Icefjord, which on first sight looks like a hostile environment, is actually an area which supports an abundance of Wildlife (whales, seals and fish) and so it could support humans living there too. 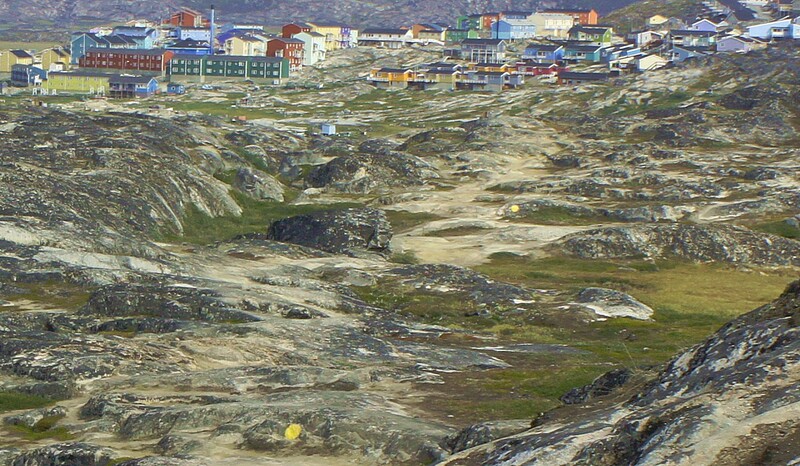 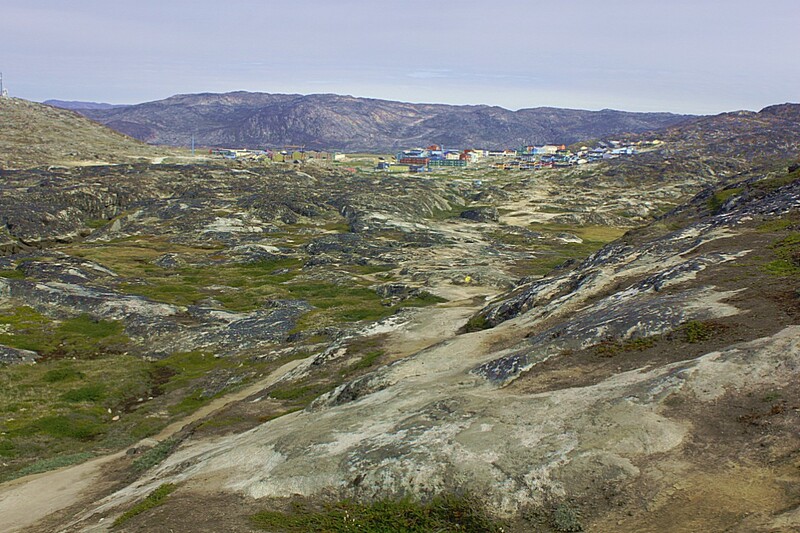 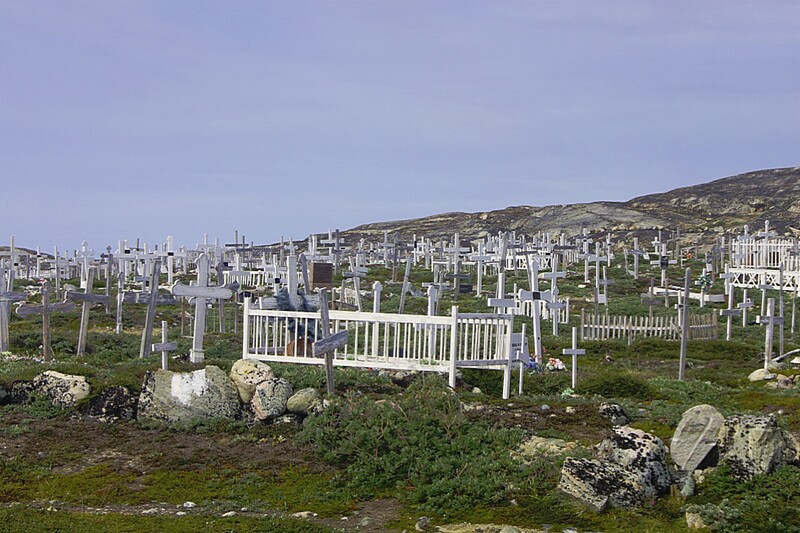 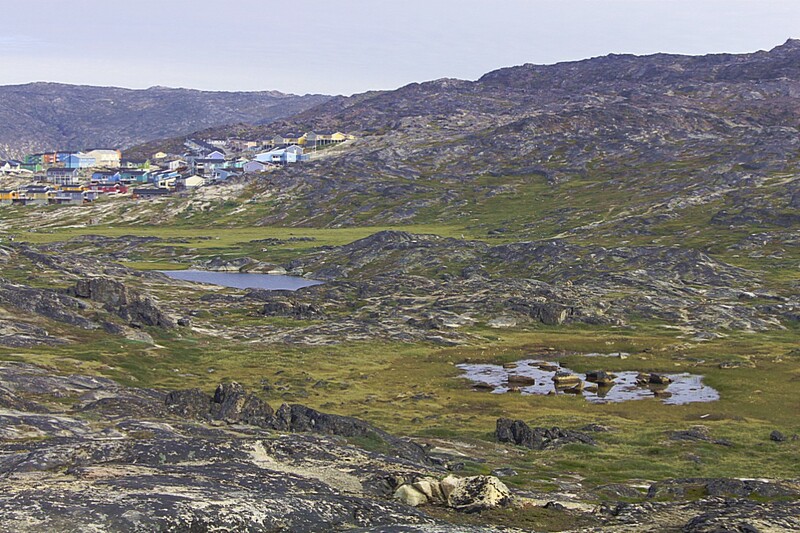 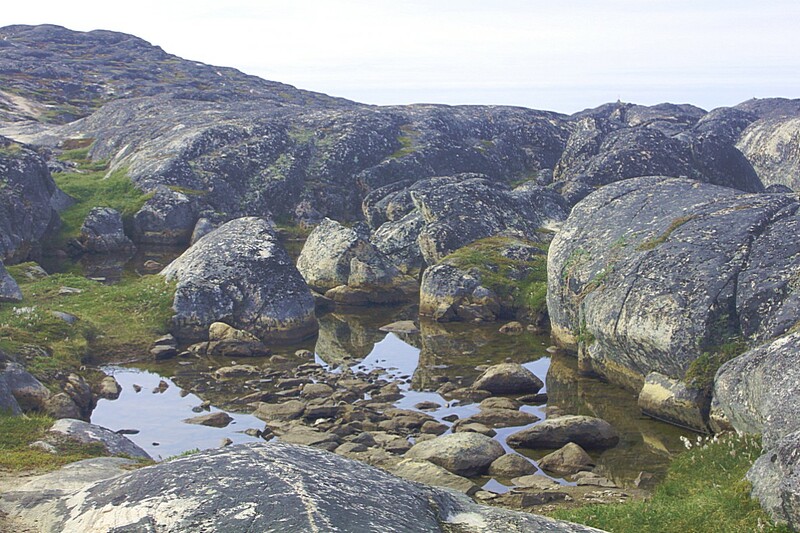 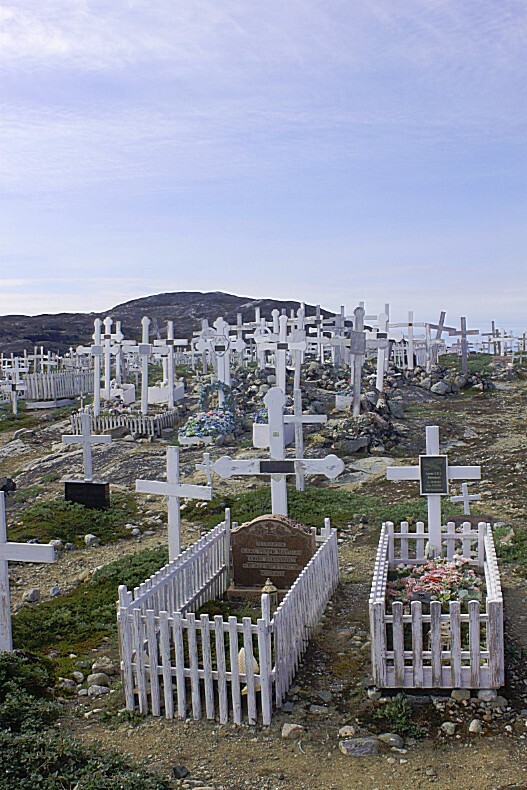 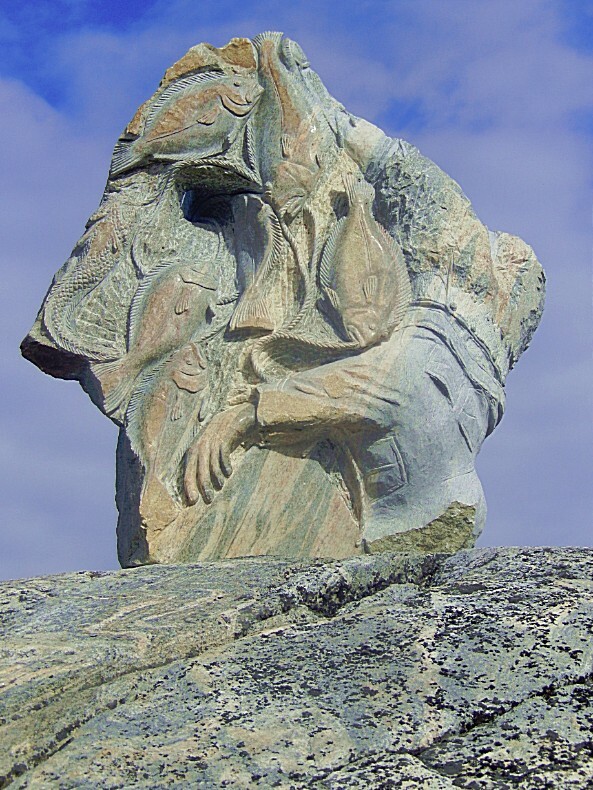 There was even a large community of Inuit living at a settlement named Sermermiut, directly located at the edge of the fjord. 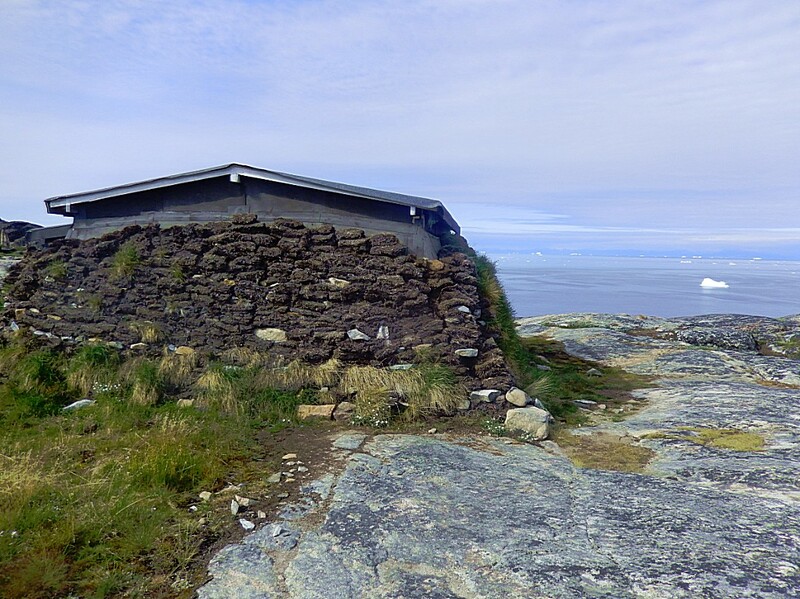 About these traditional huts I’ll write more in an upcoming blog. 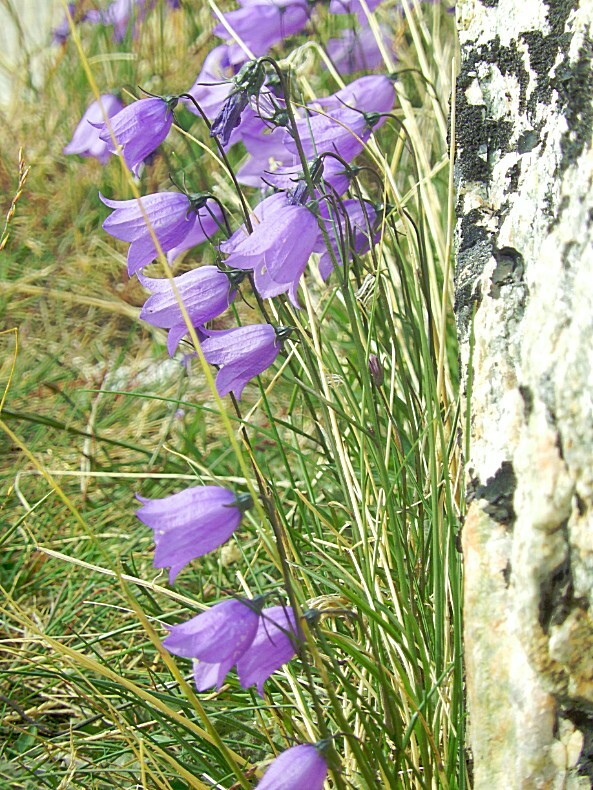 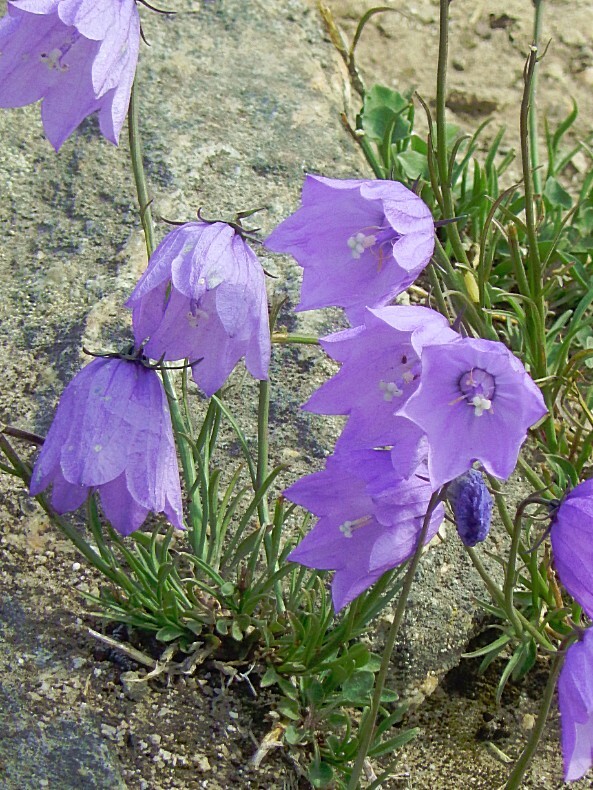 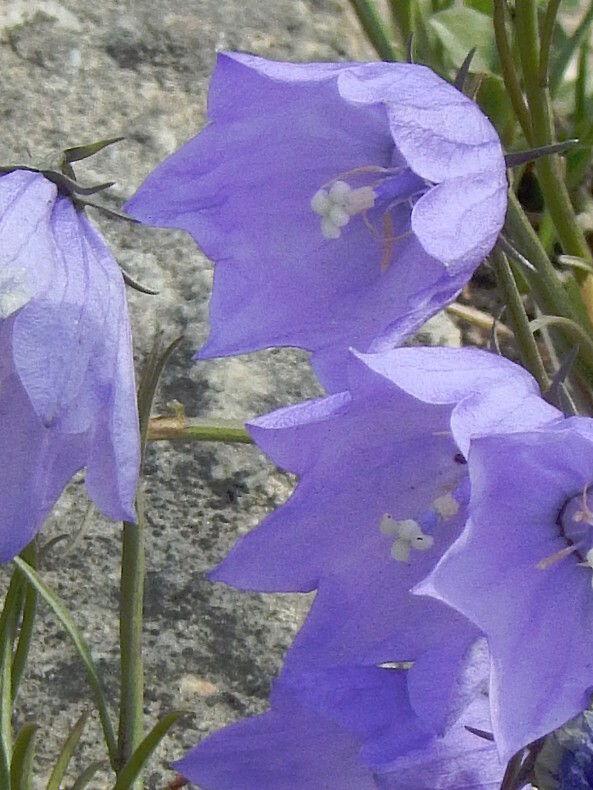 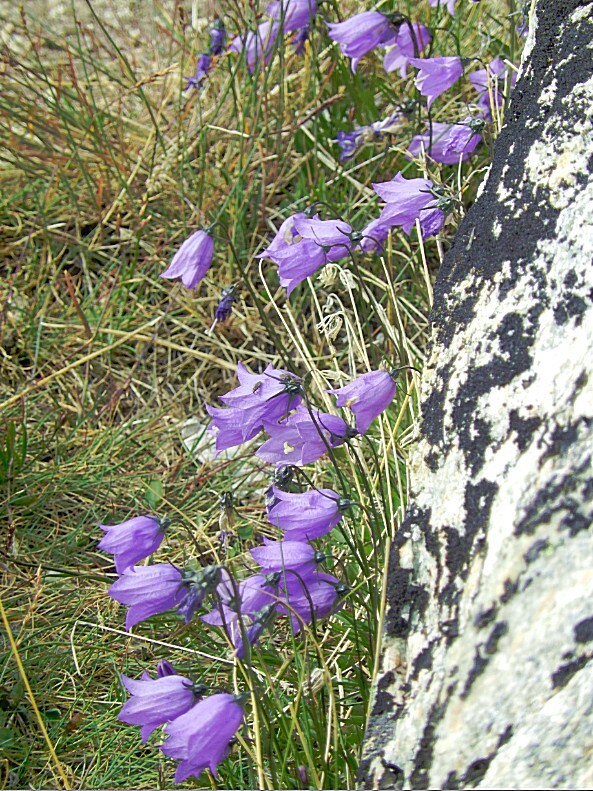 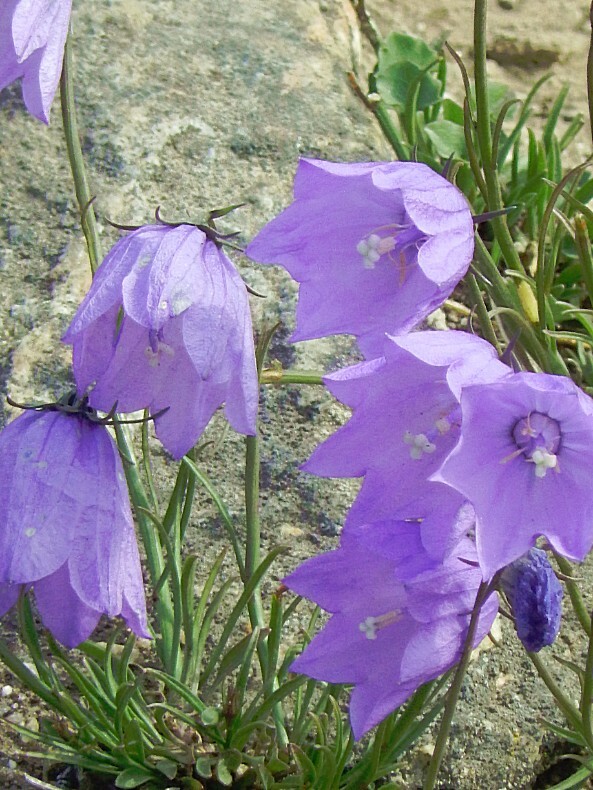 The beautiful Greenland Bluebell or Greenlandic Bellflower blooms in Juli and August and is between 5 and 10 centimetres in length. 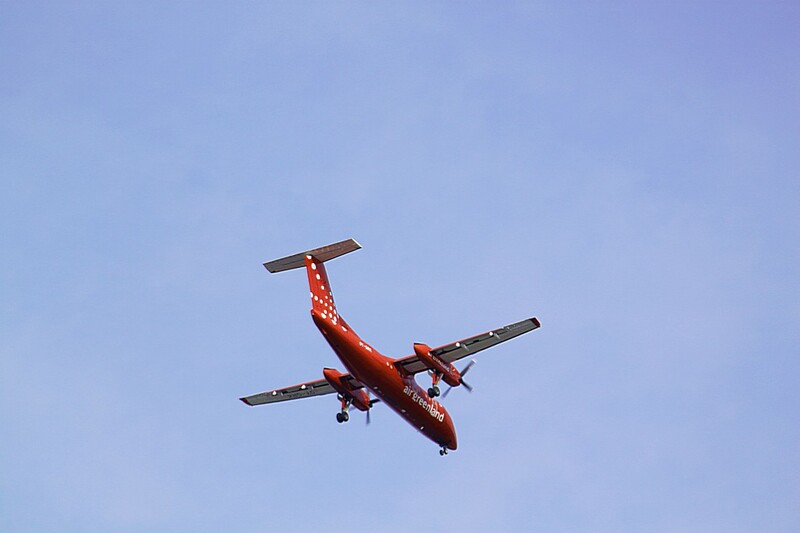 A DC Havilland propellor plane flew over the spot where I stood. 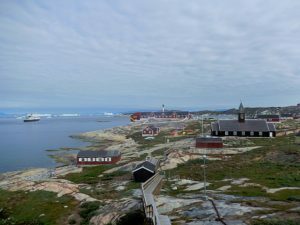 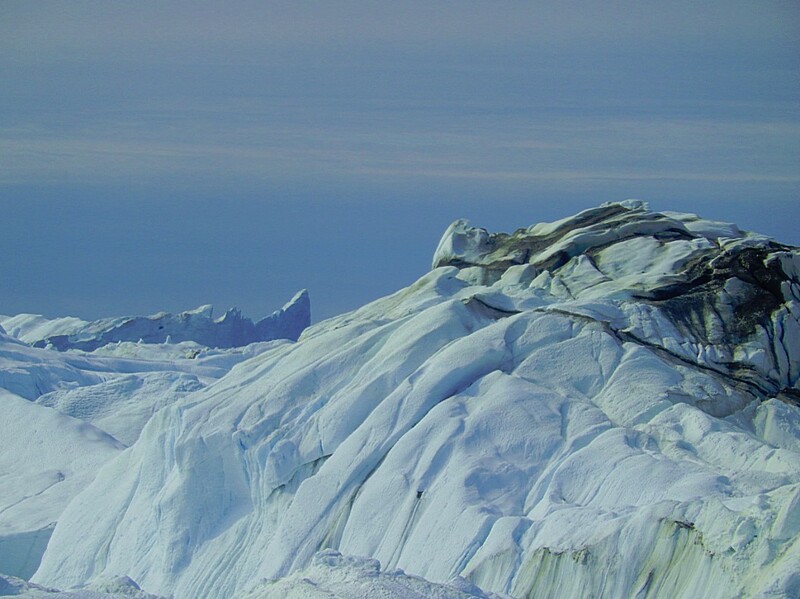 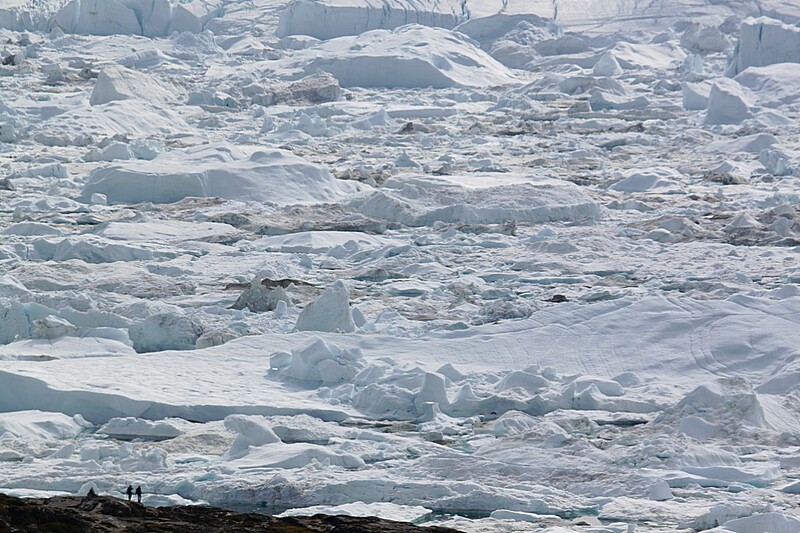 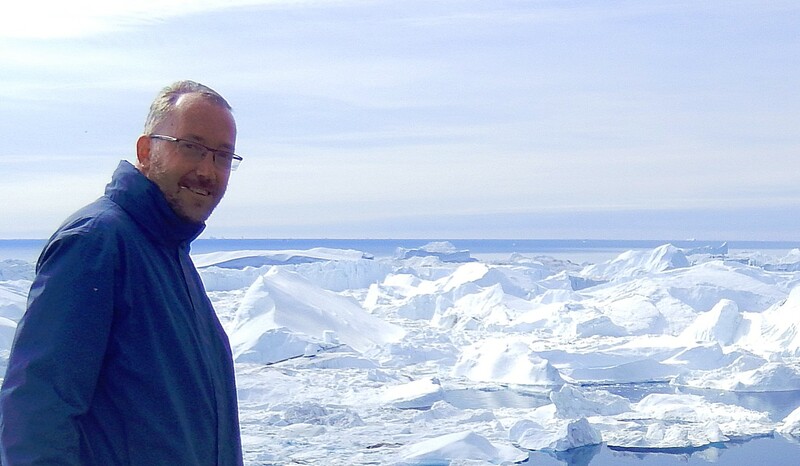 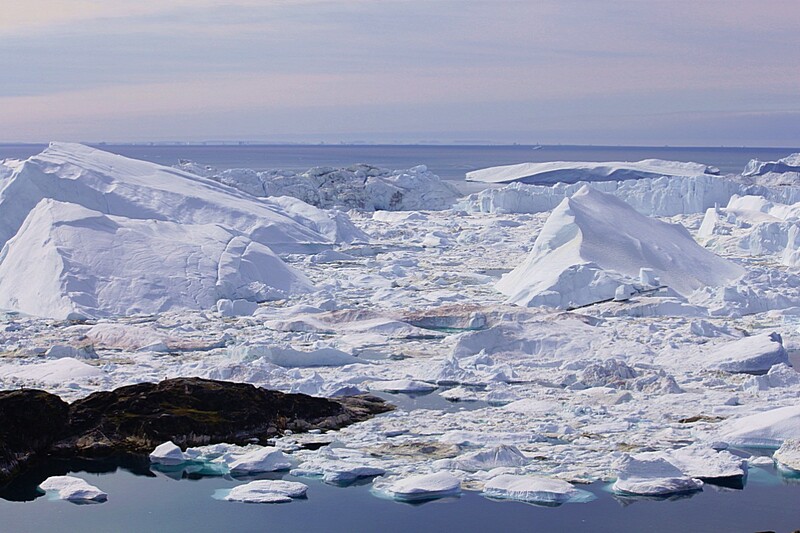 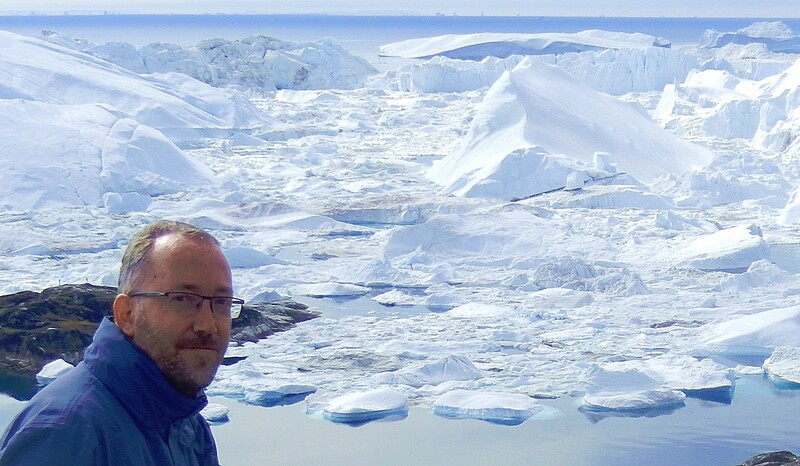 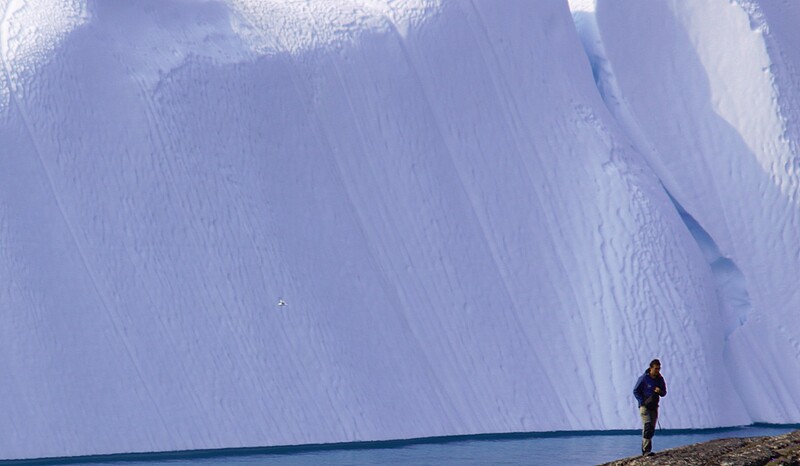 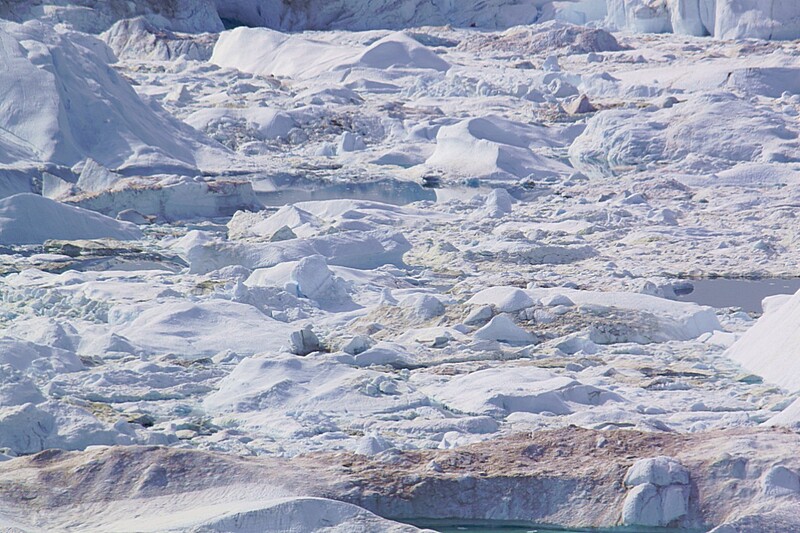 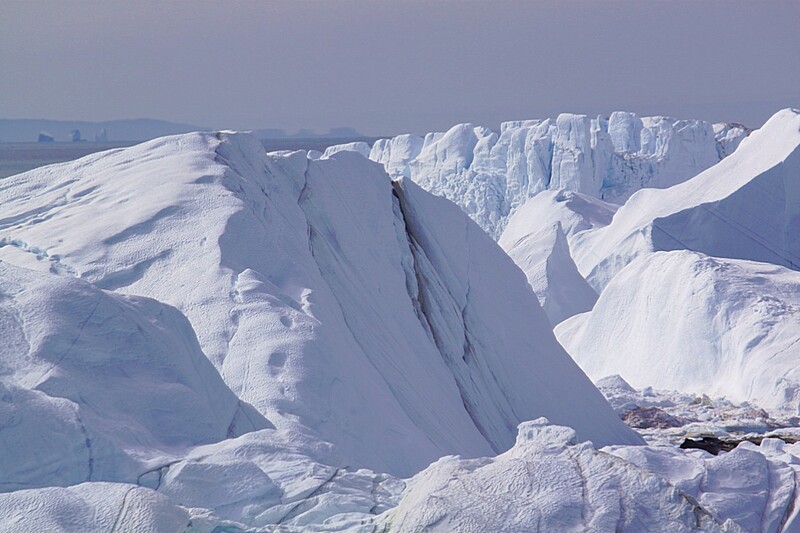 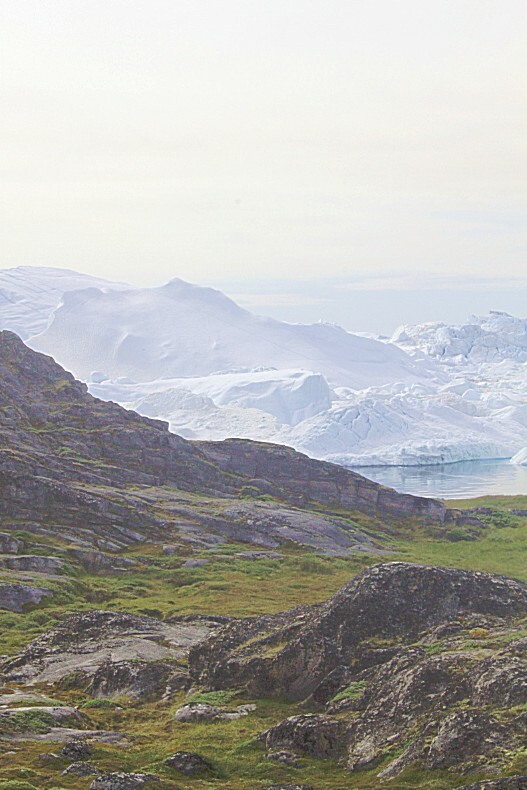 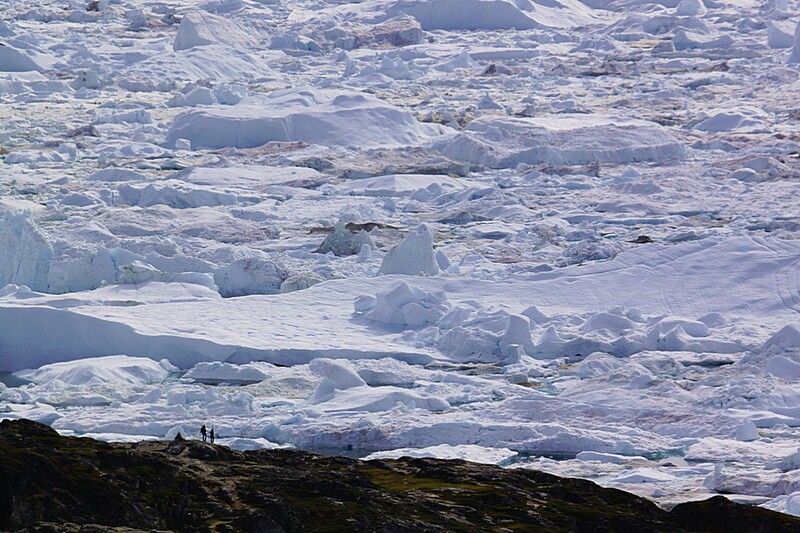 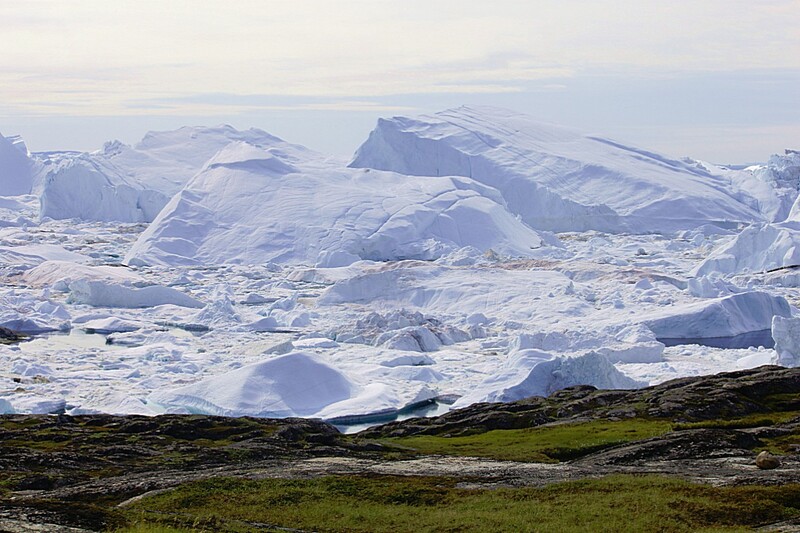 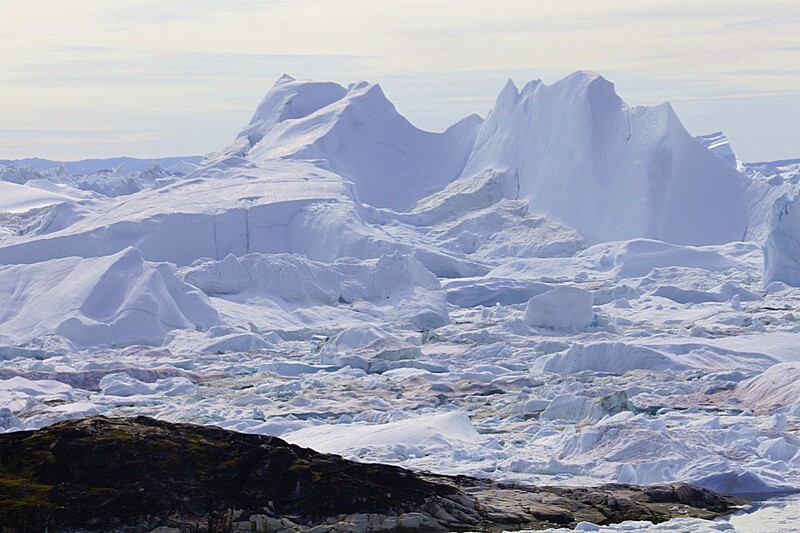 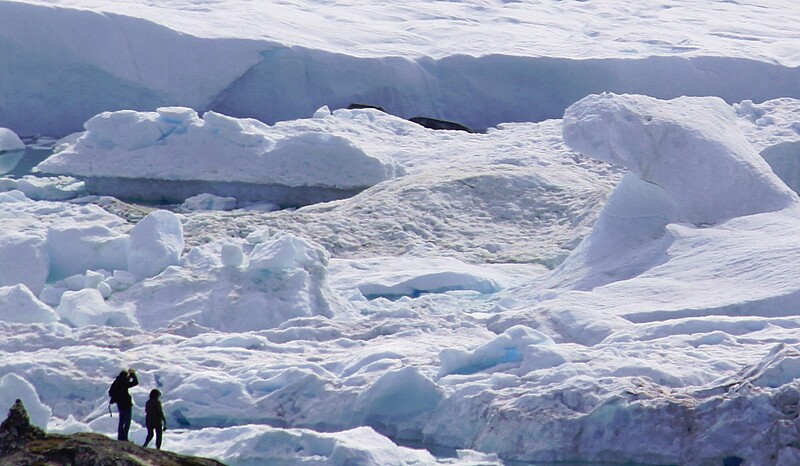 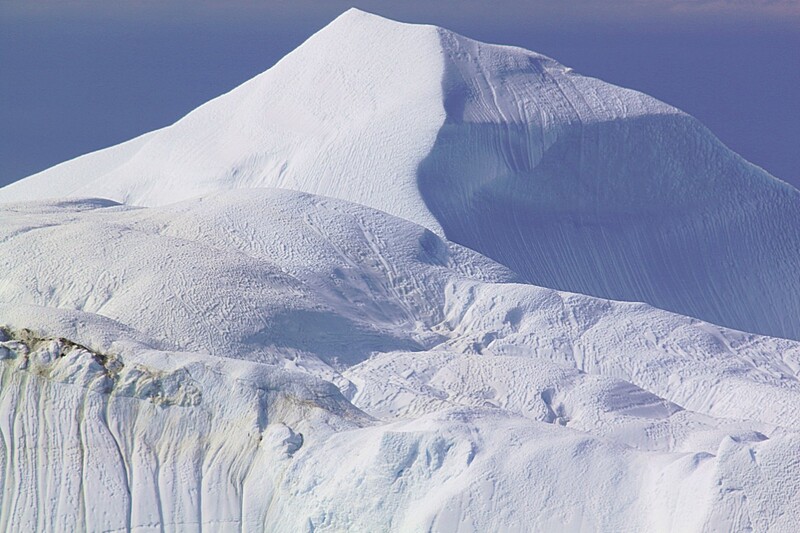 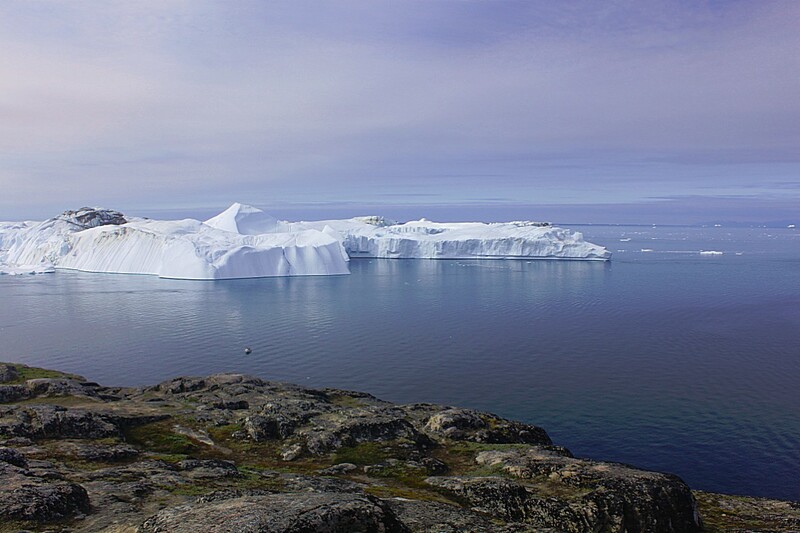 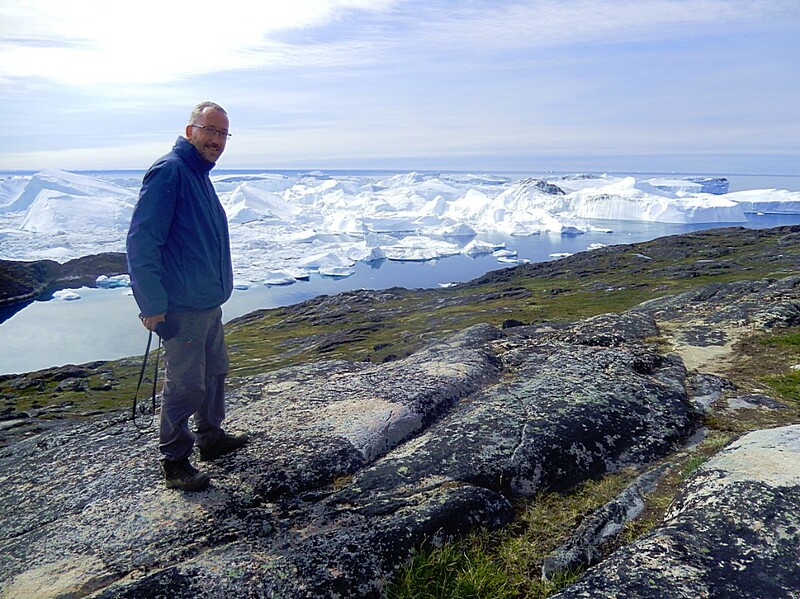 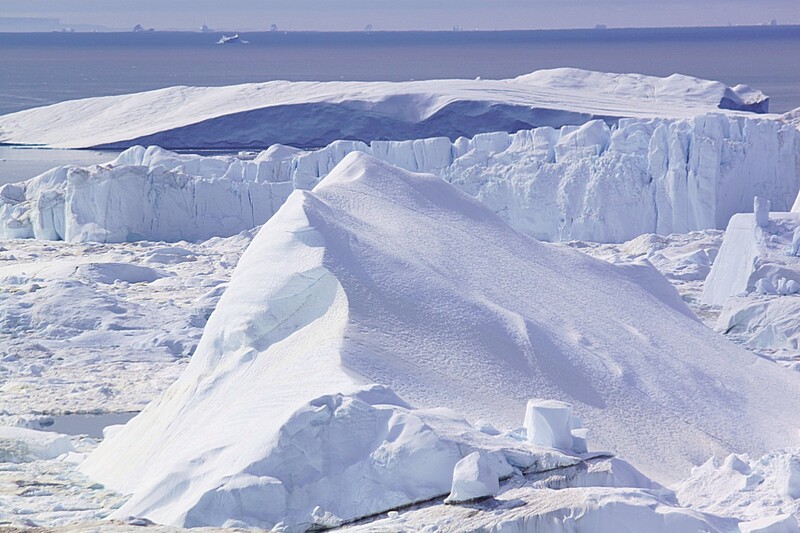 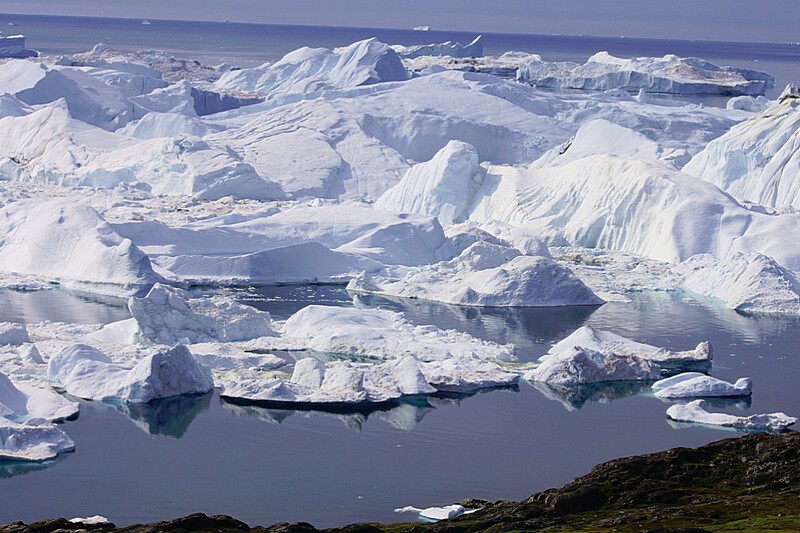 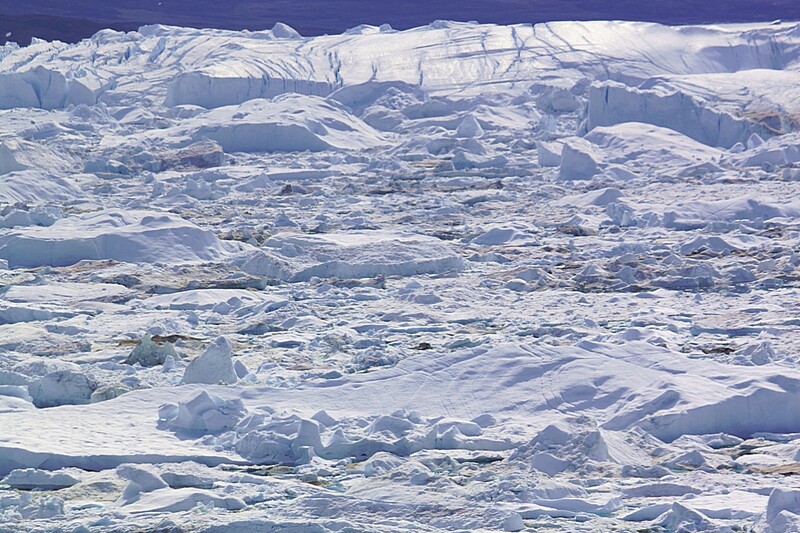 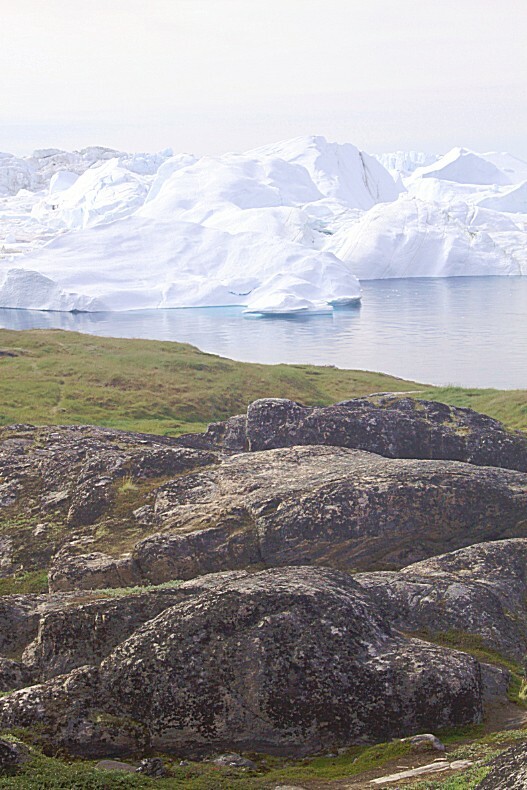 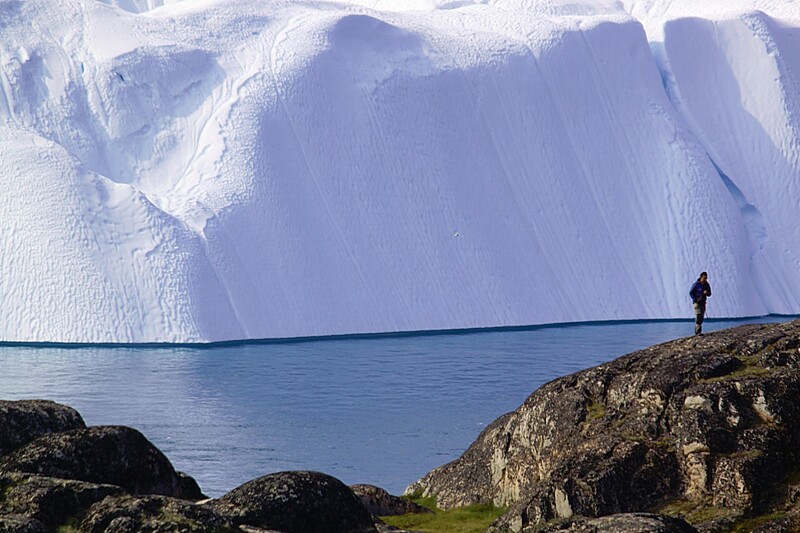 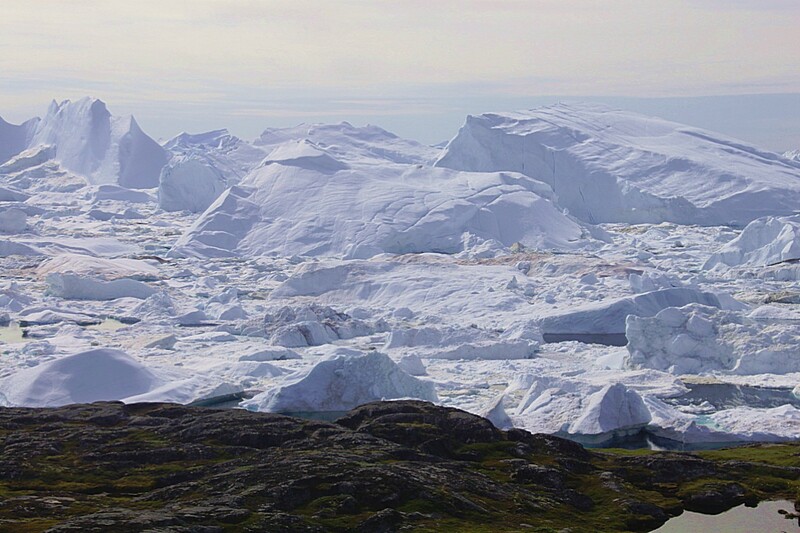 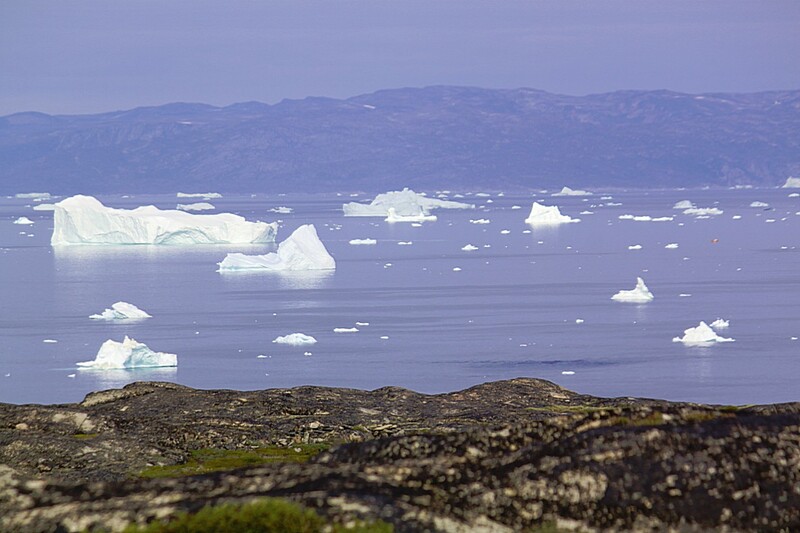 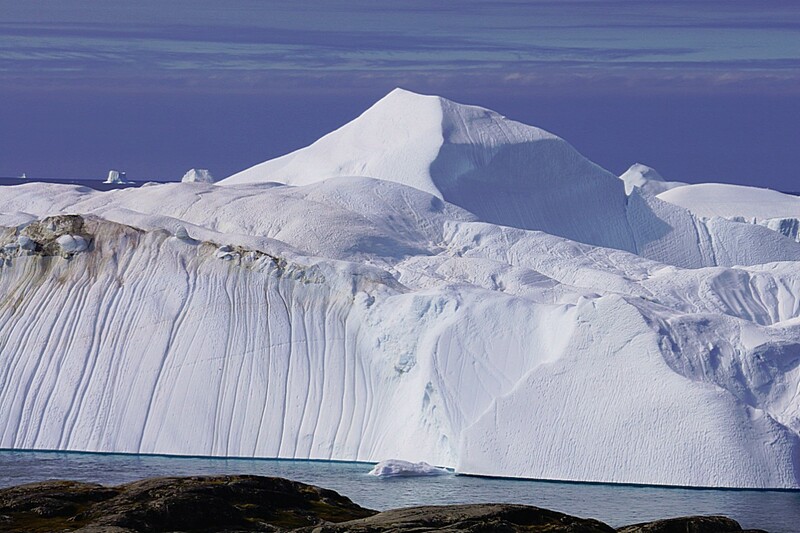 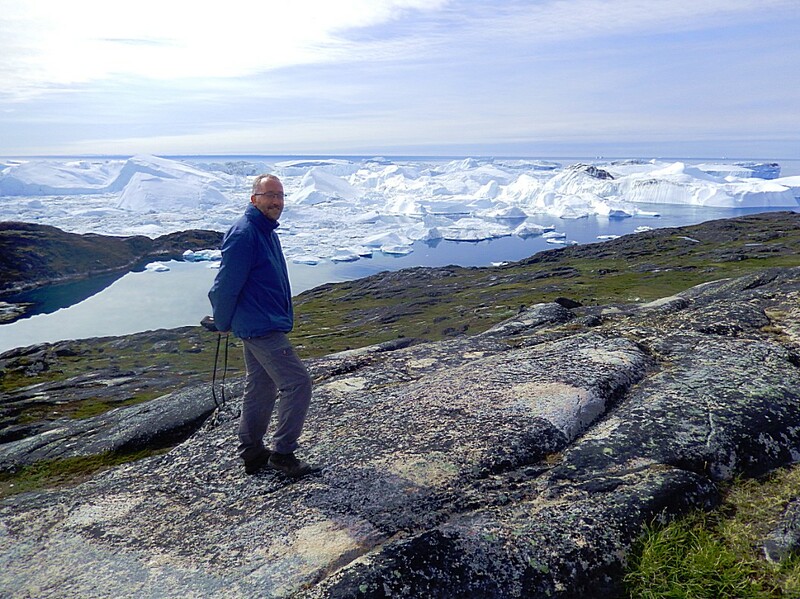 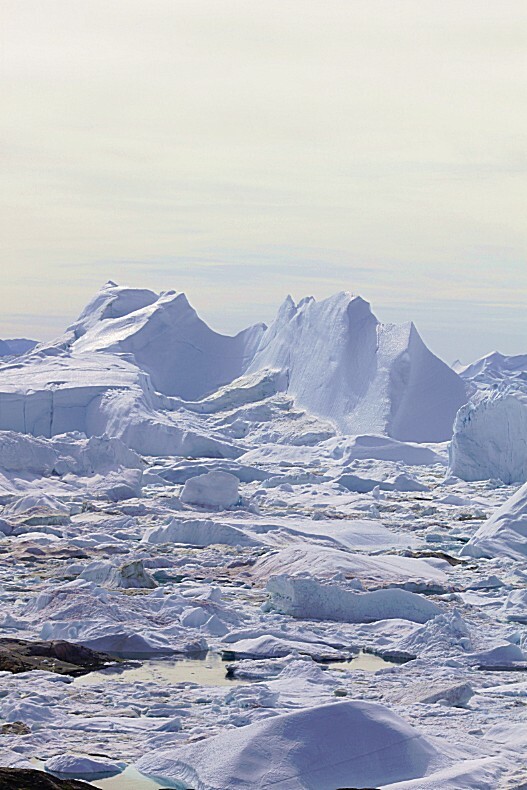 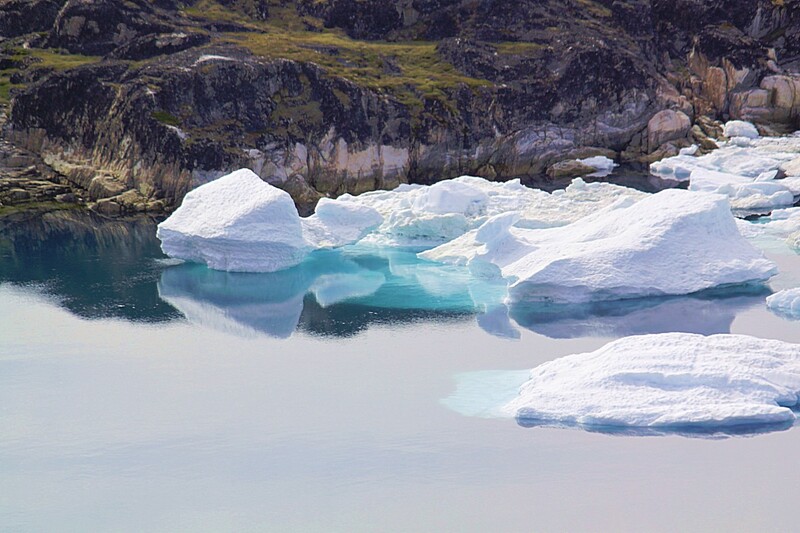 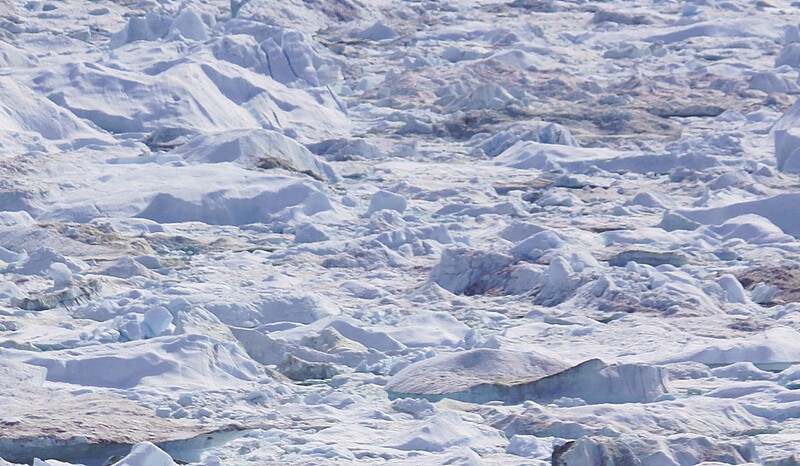 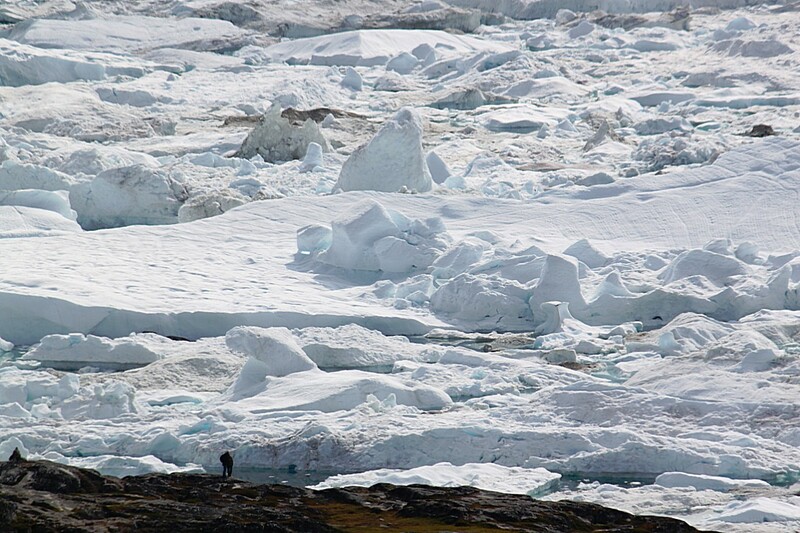 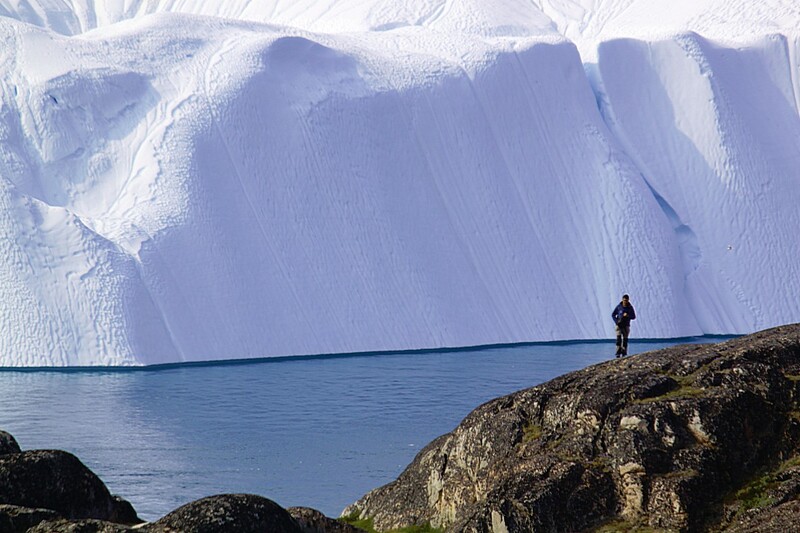 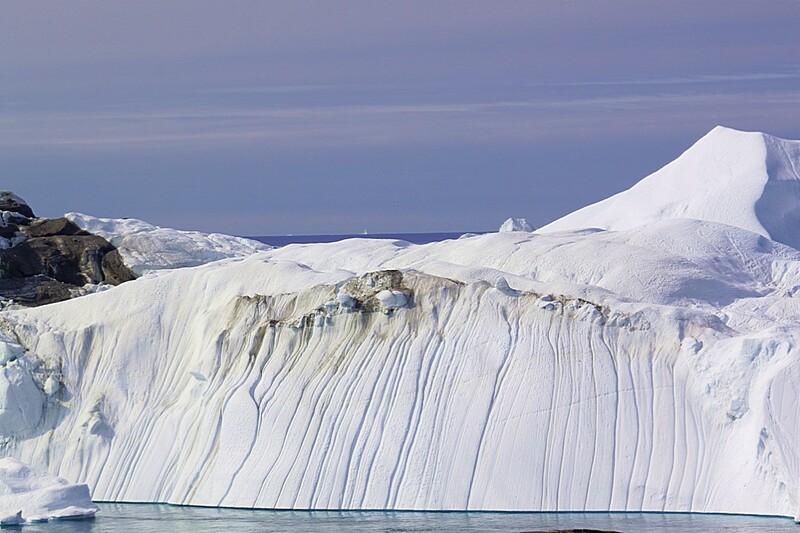 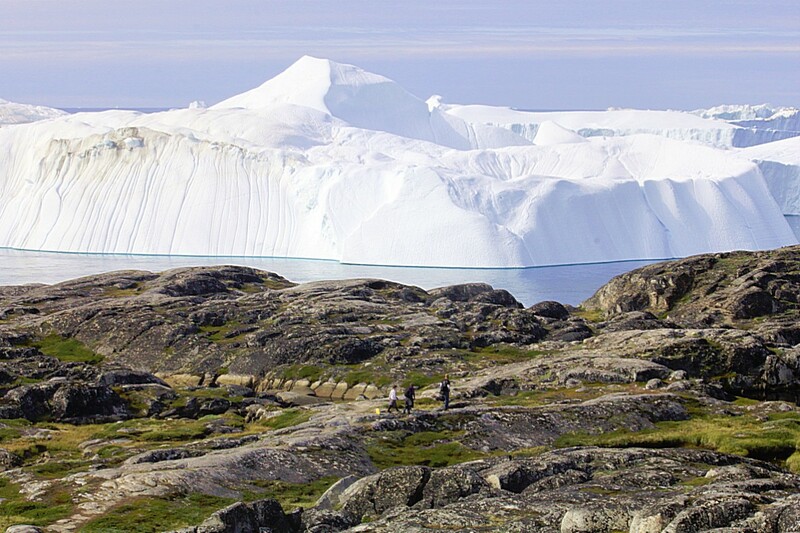 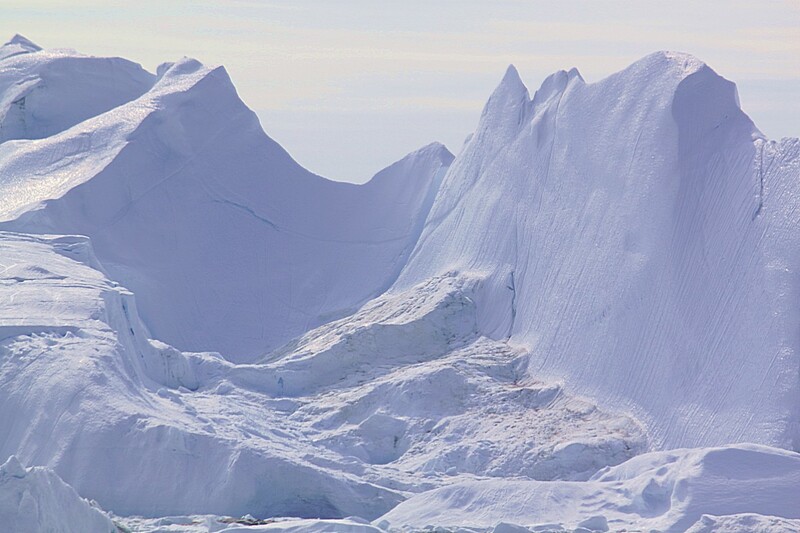 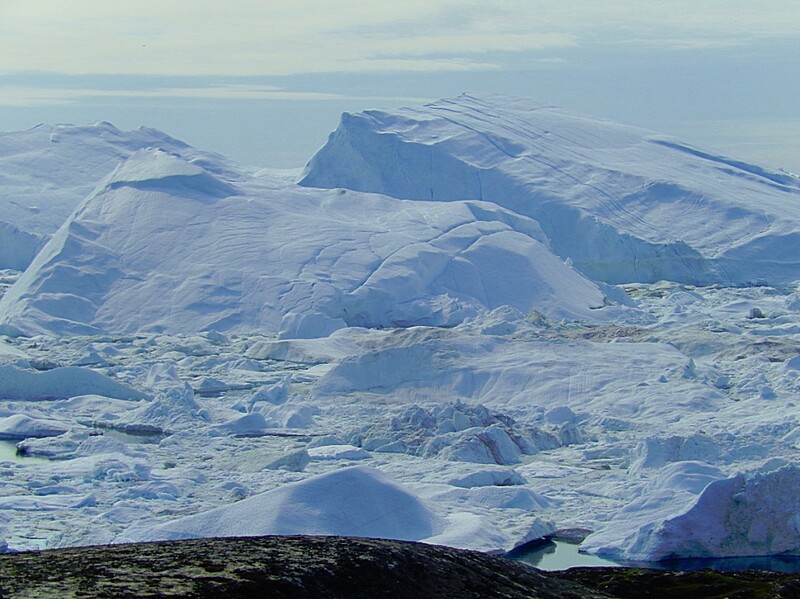 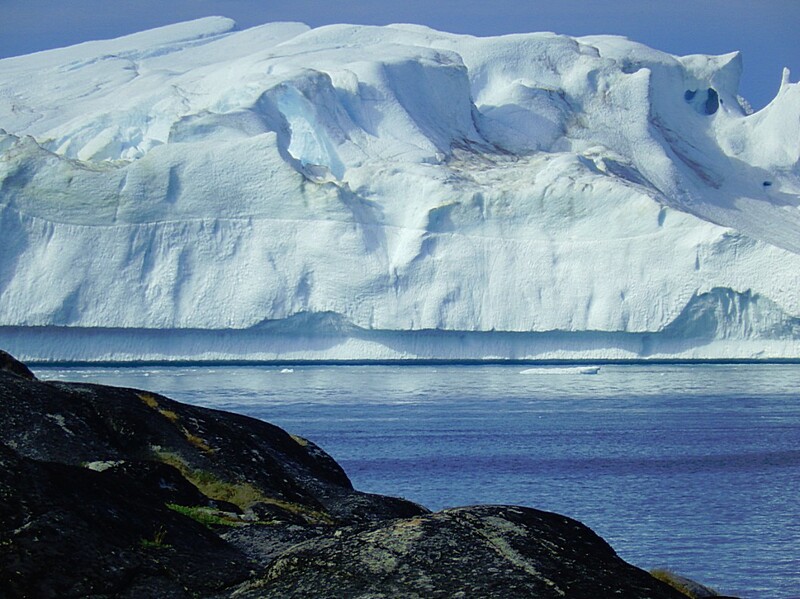 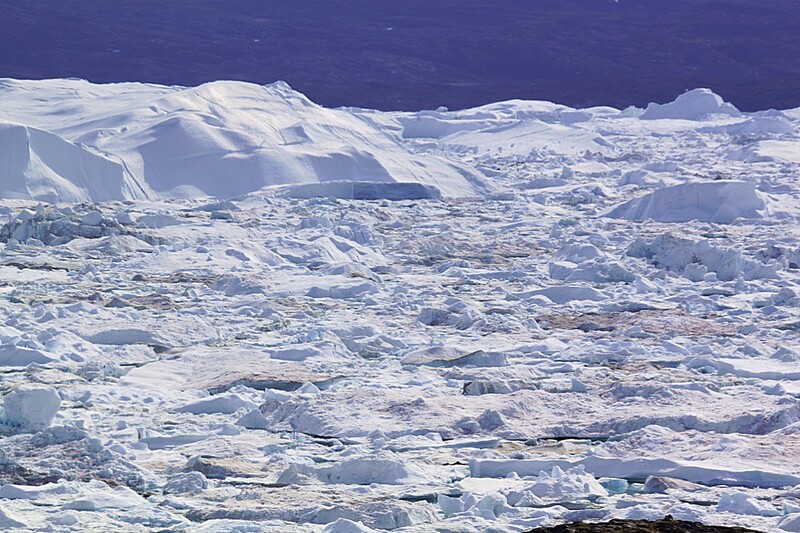 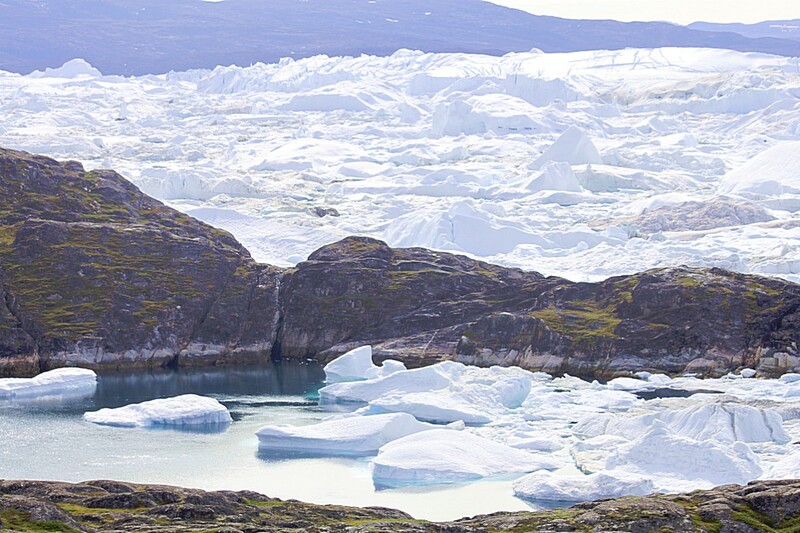 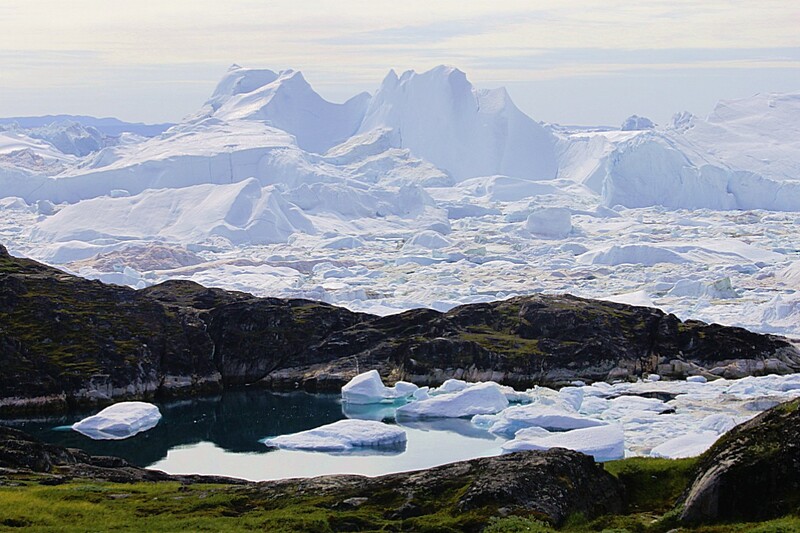 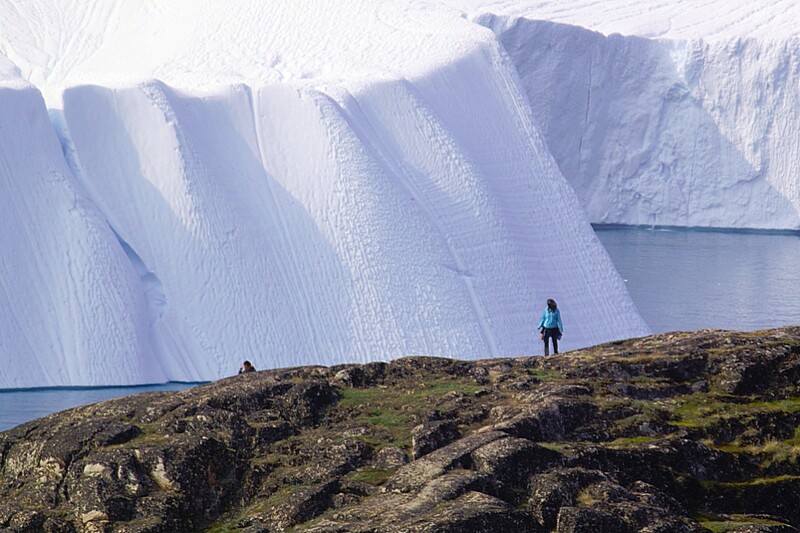 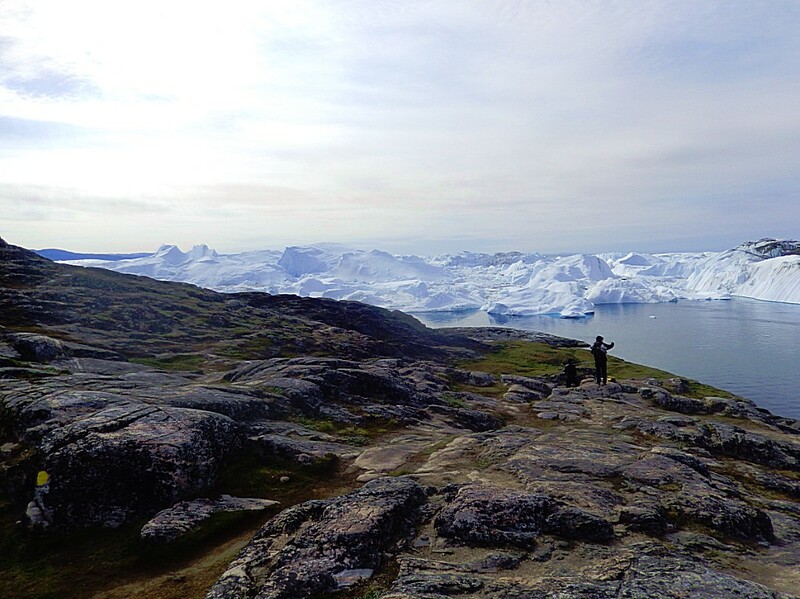 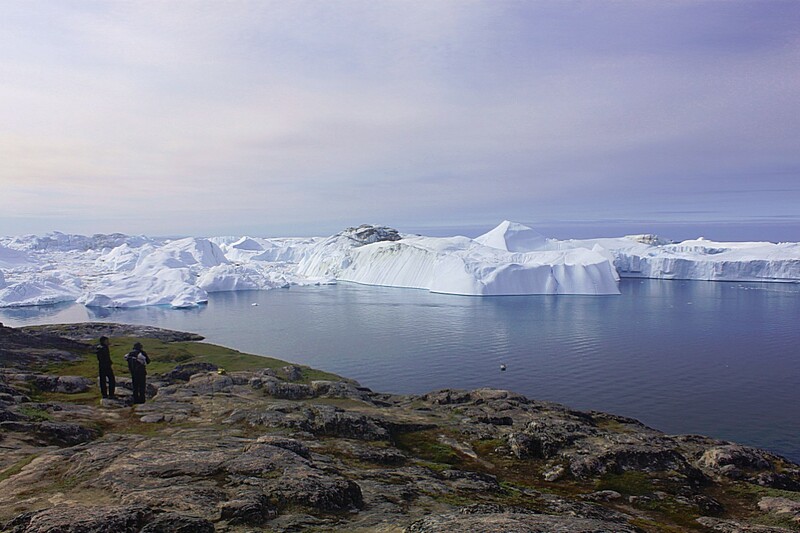 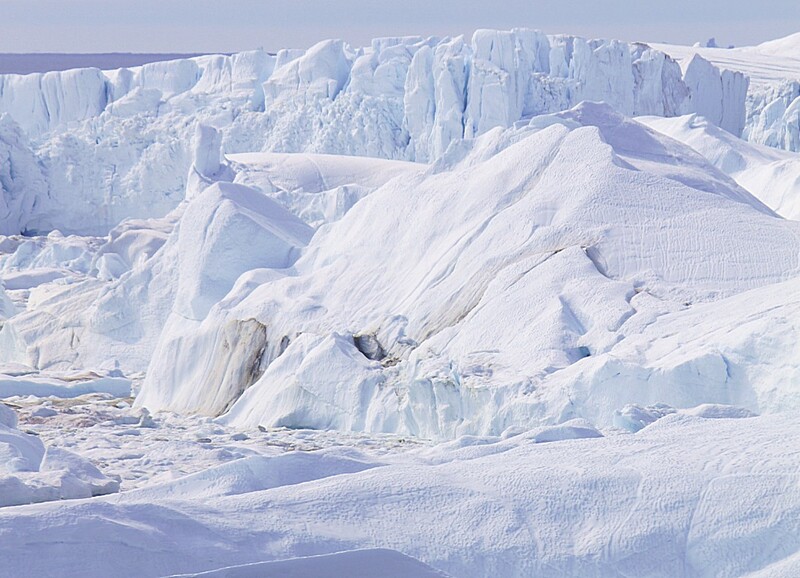 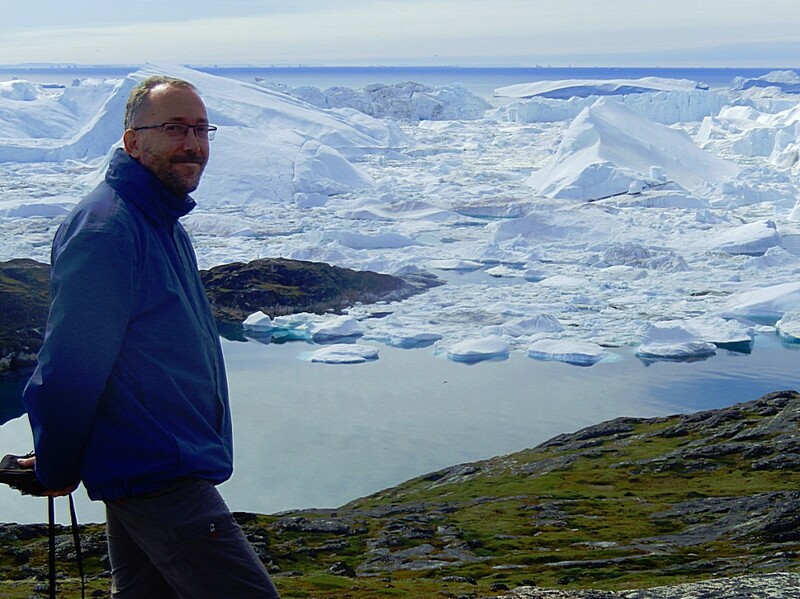 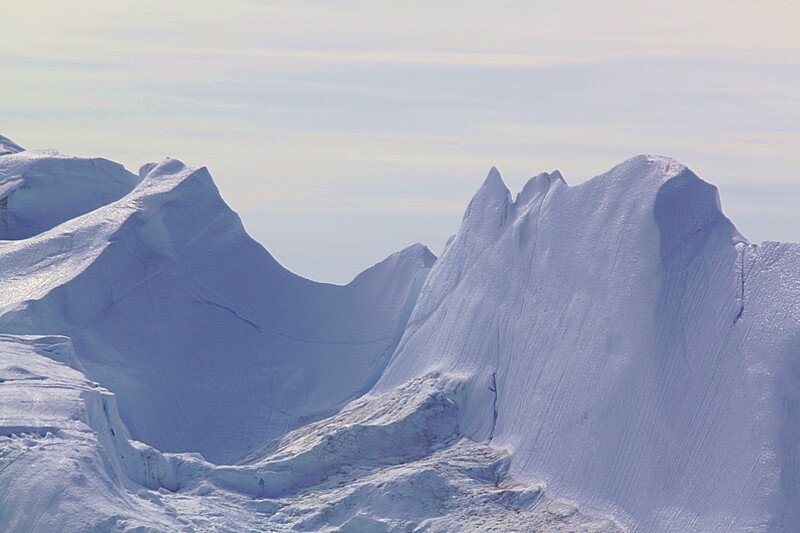 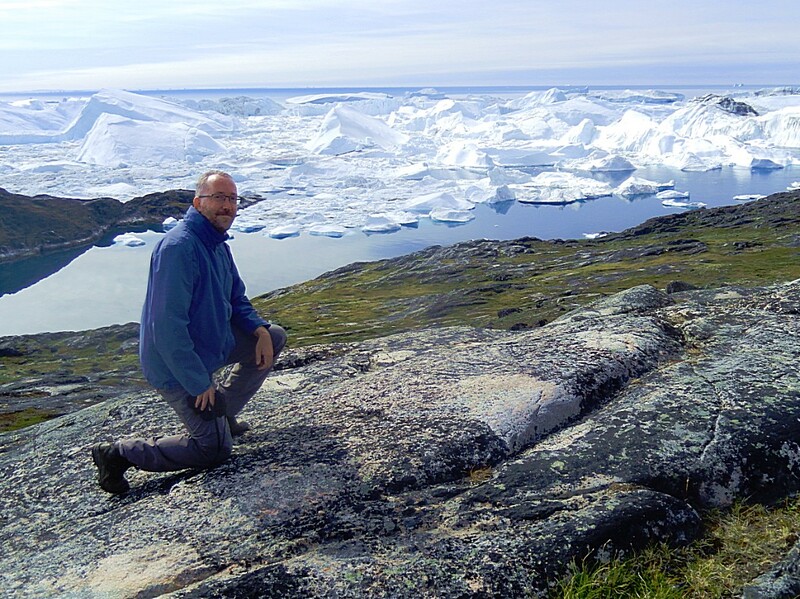 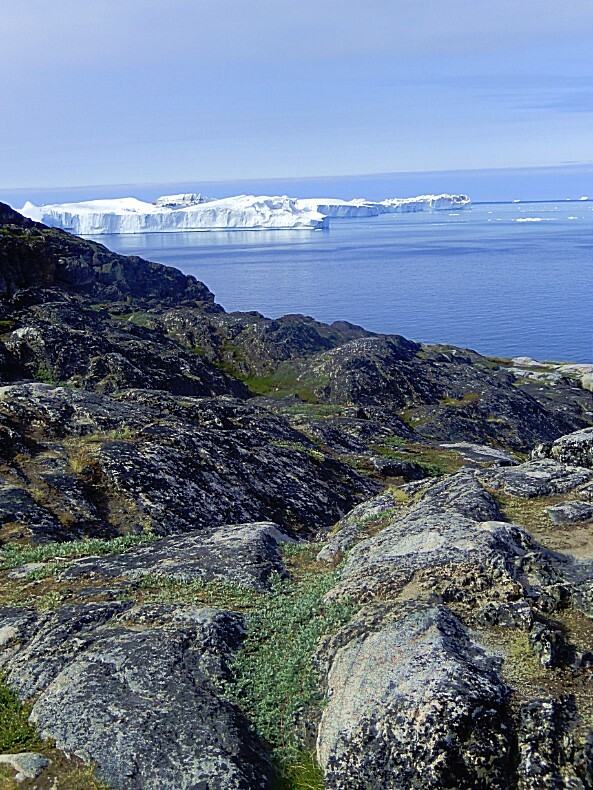 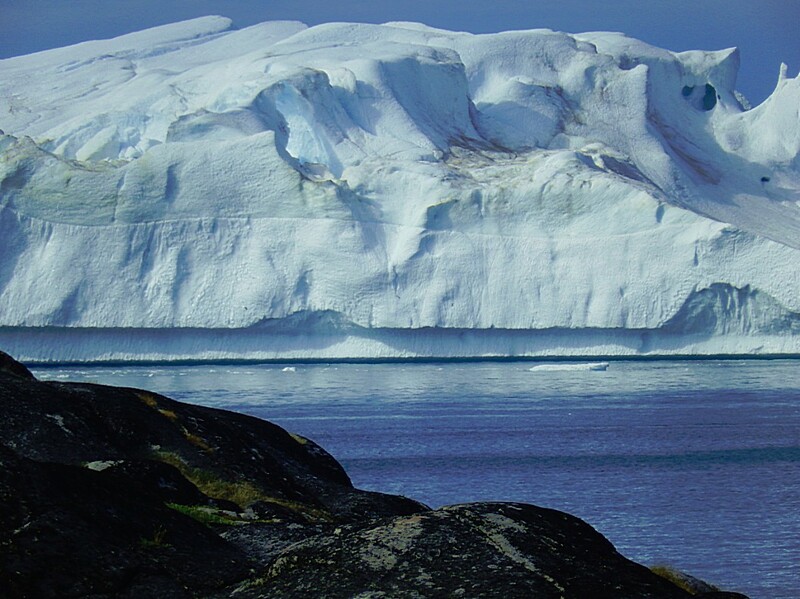 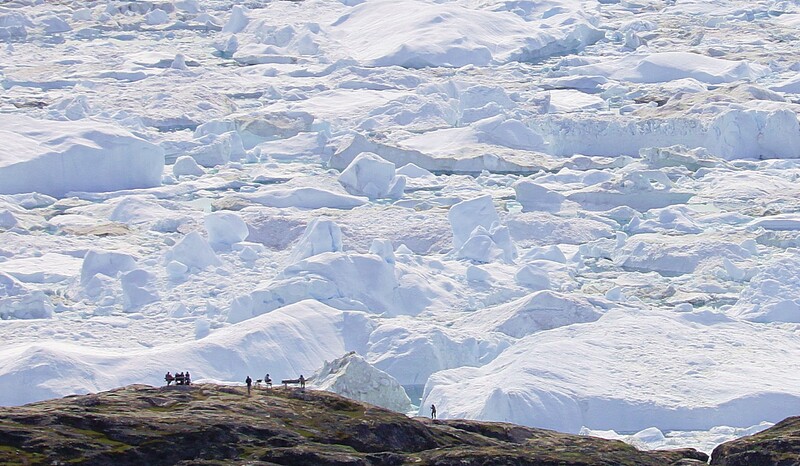 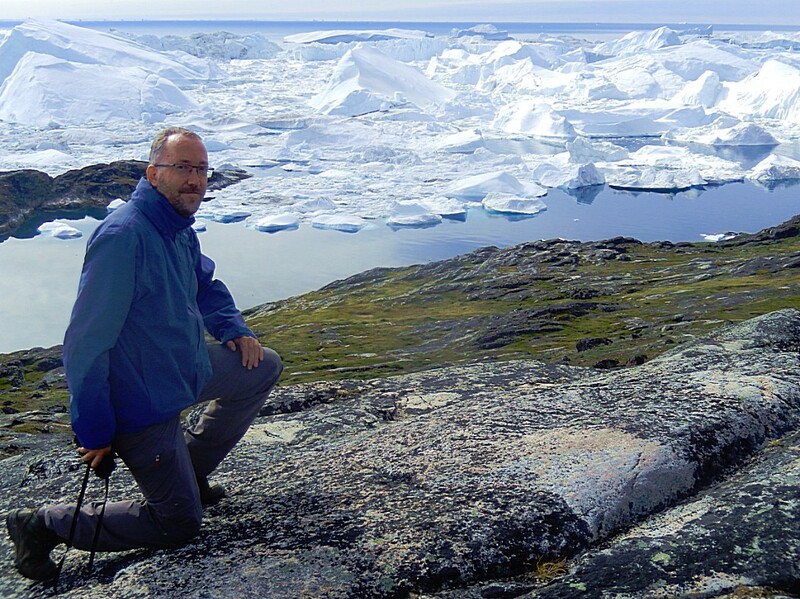 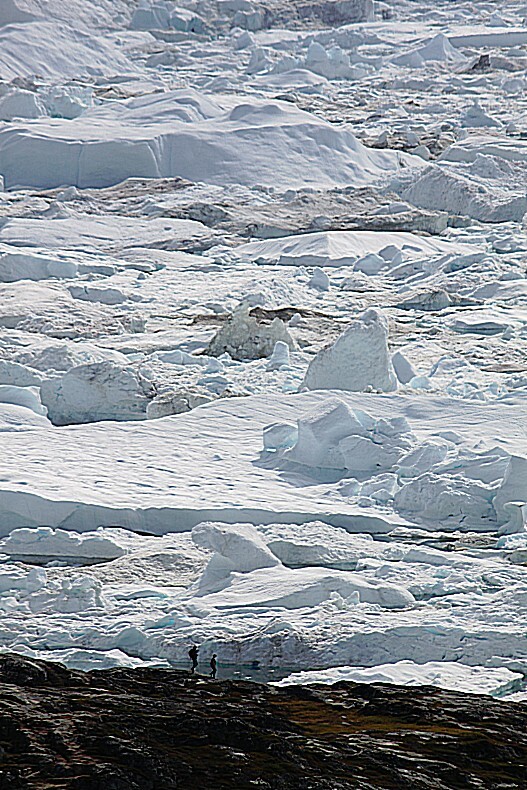 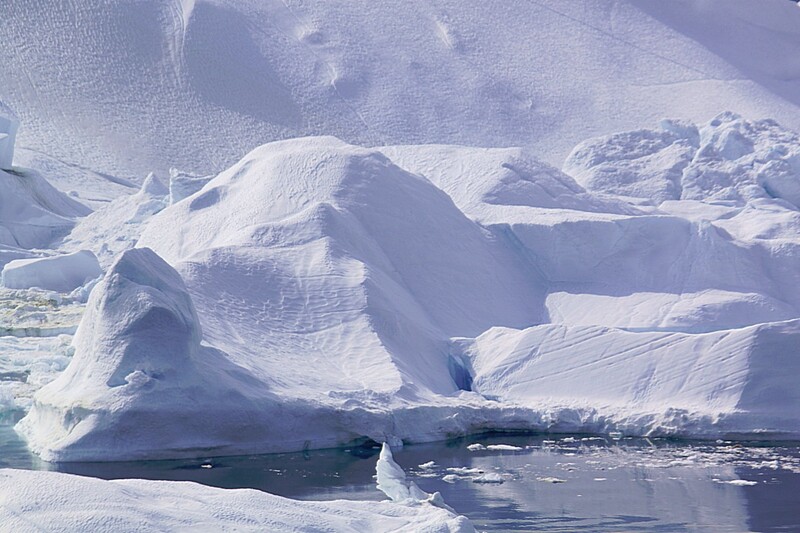 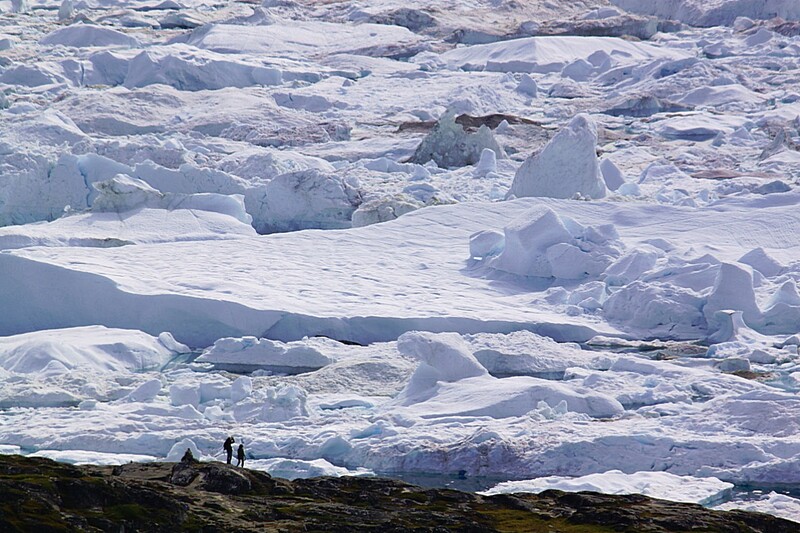 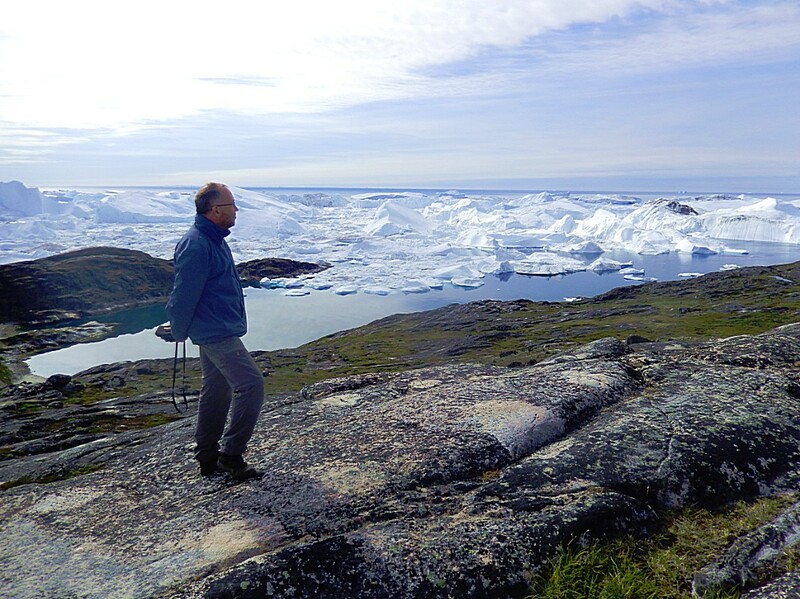 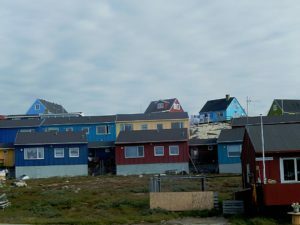 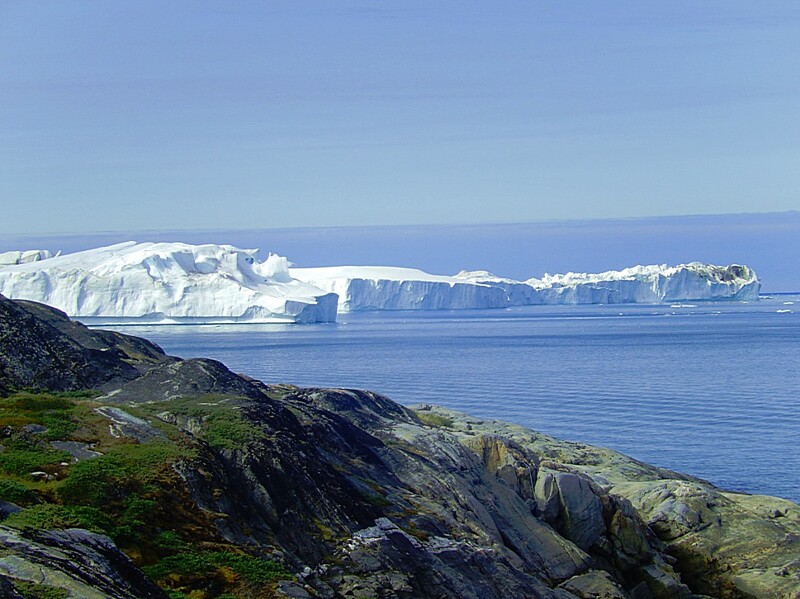 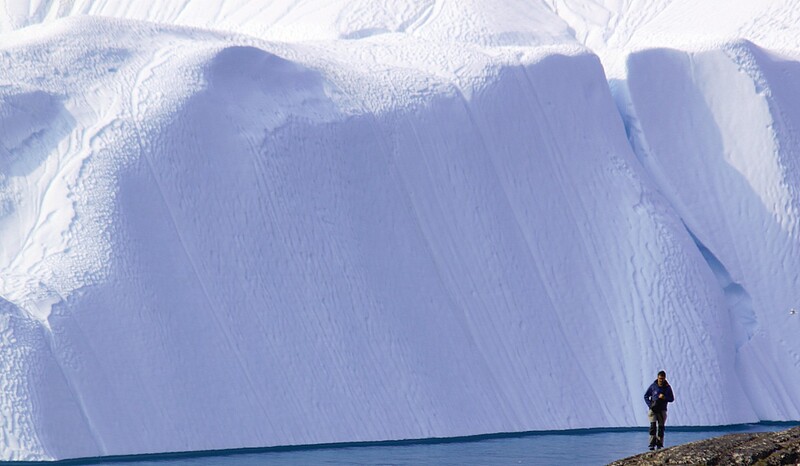 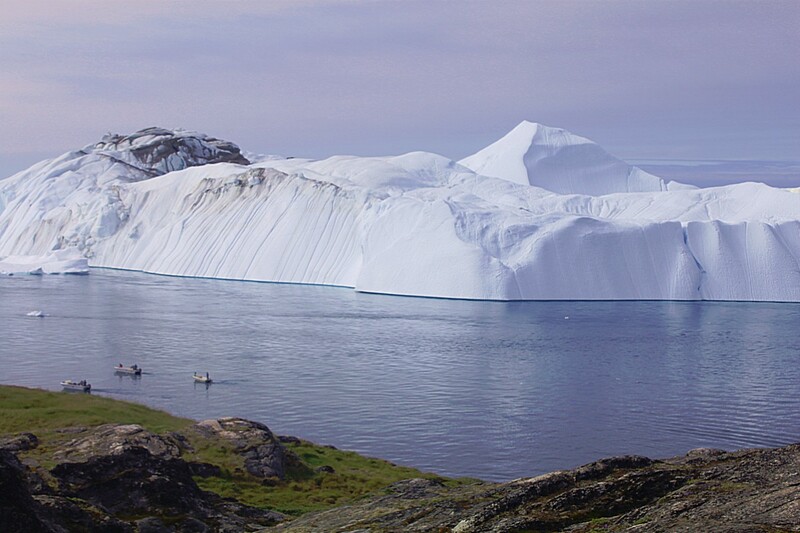 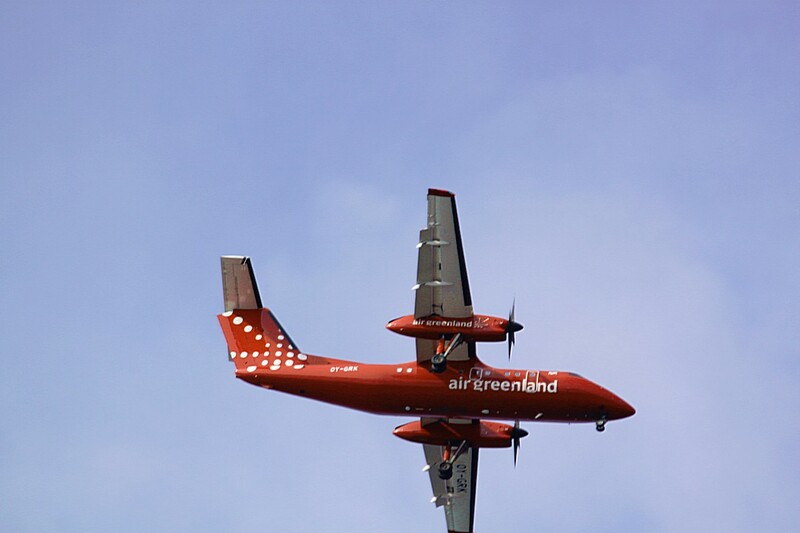 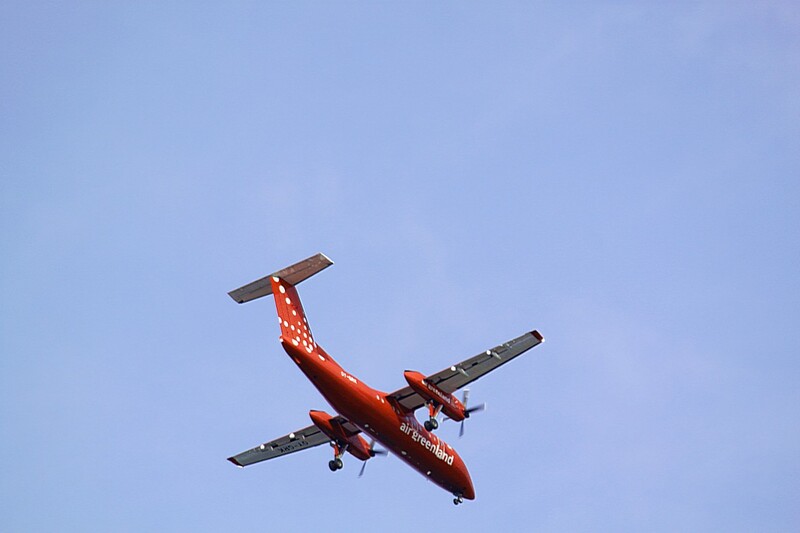 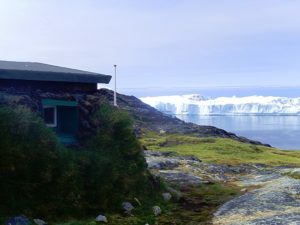 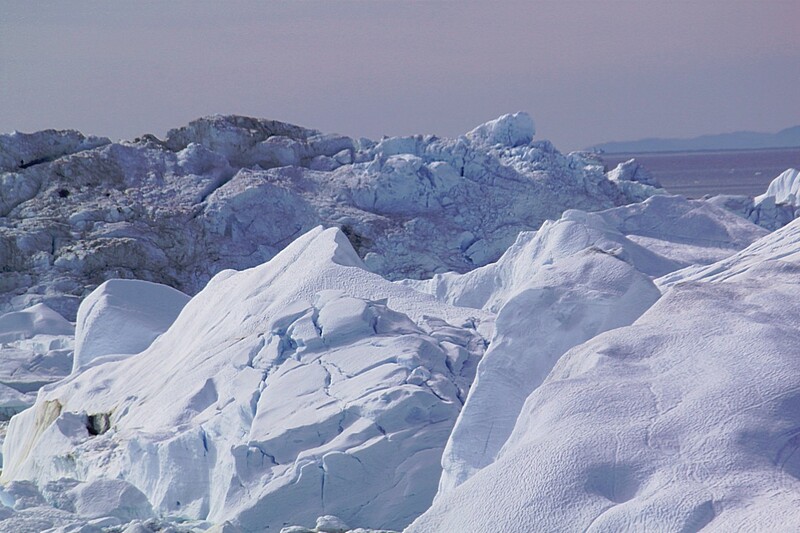 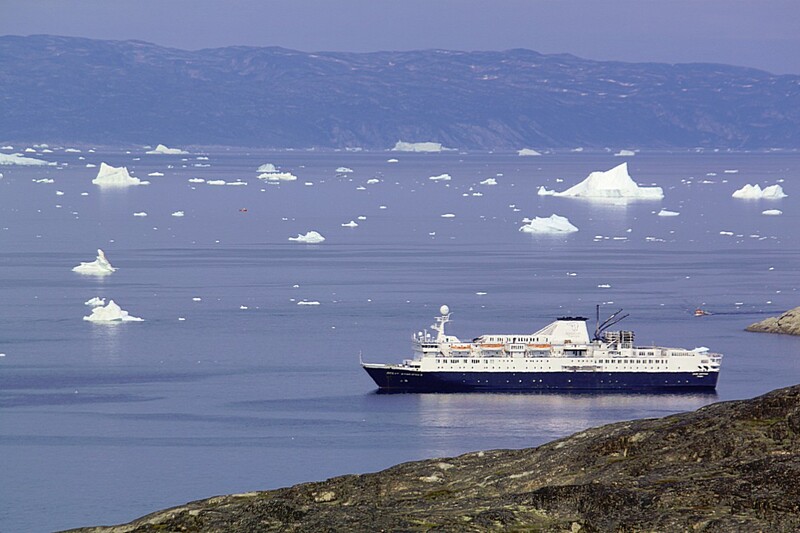 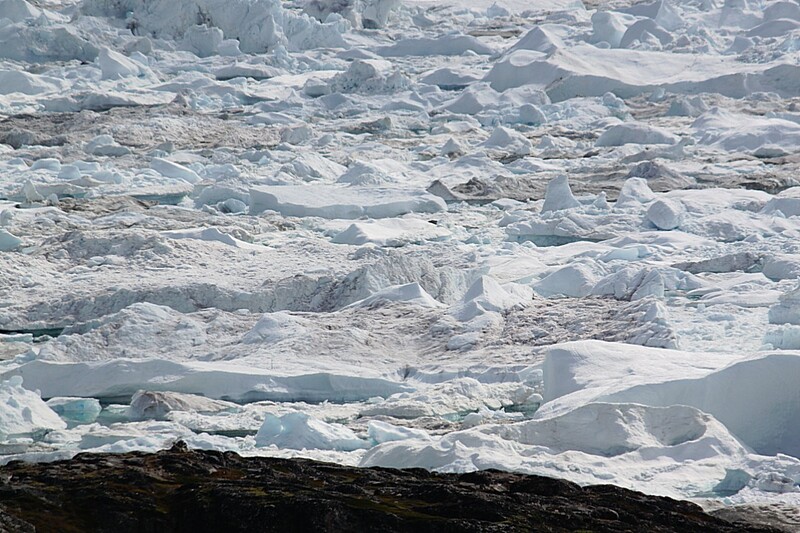 It was a similar plane as the one that had brought me here to Ilulissat…. 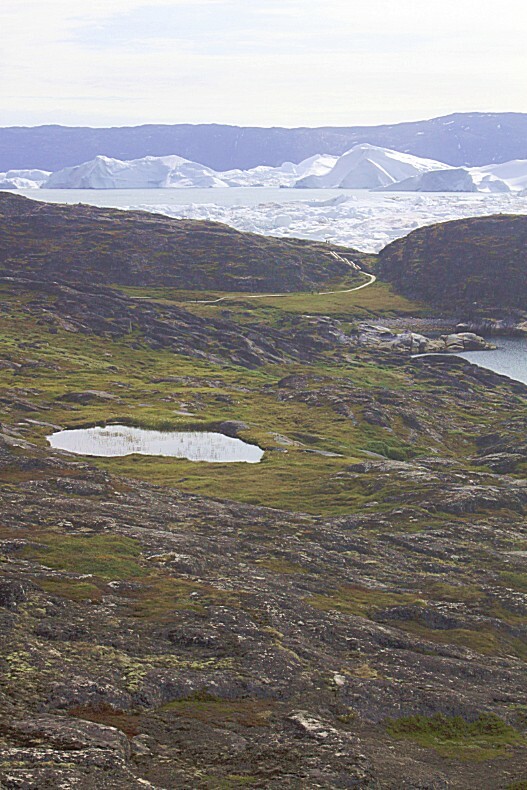 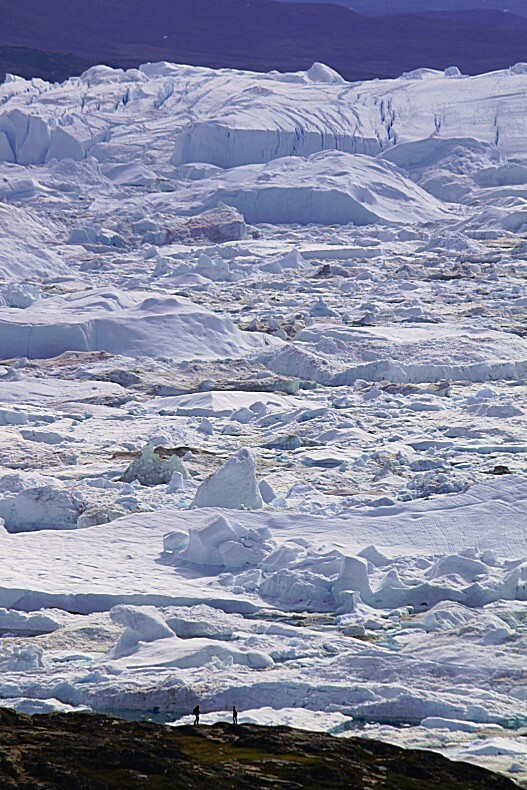 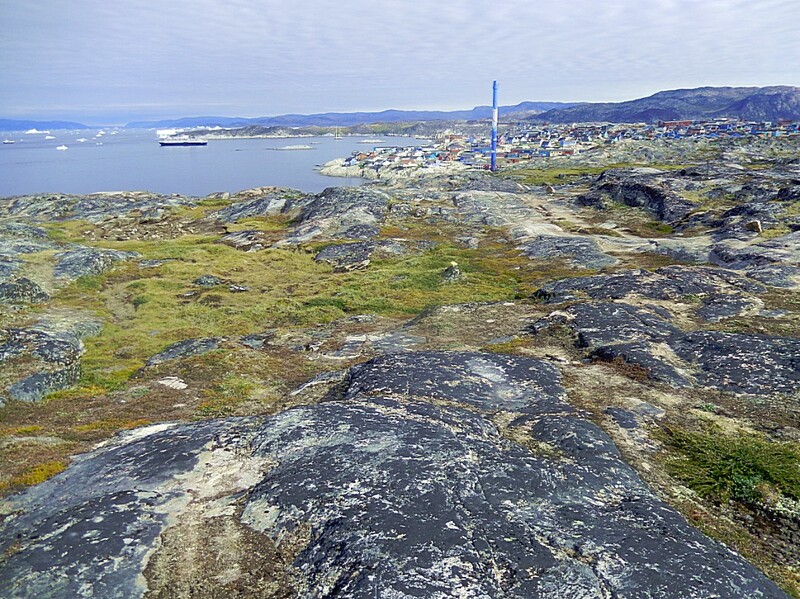 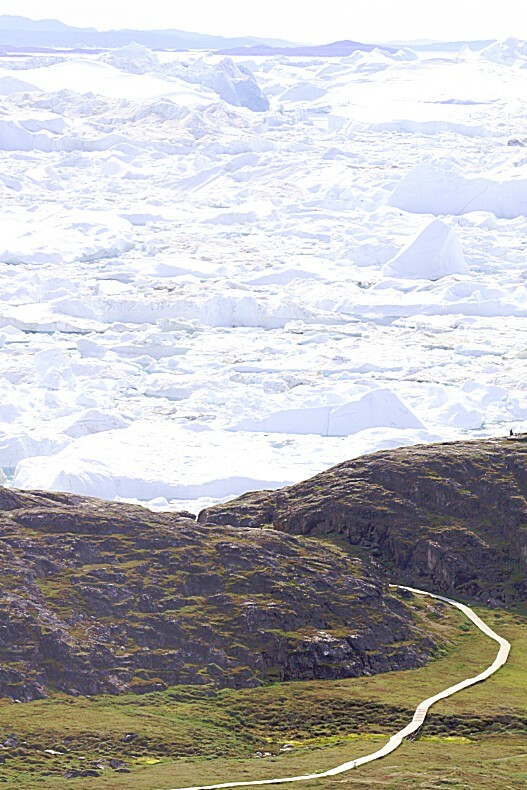 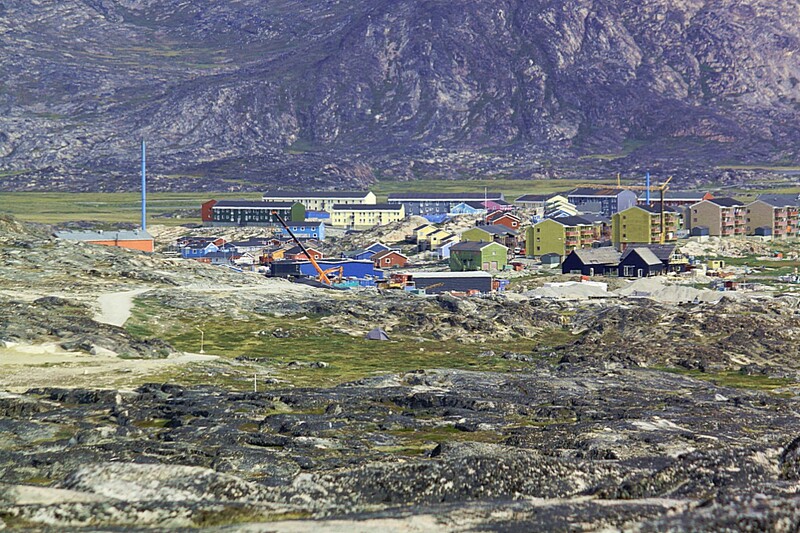 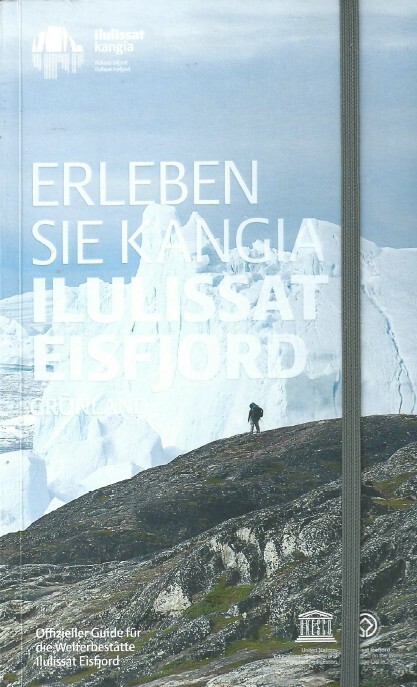 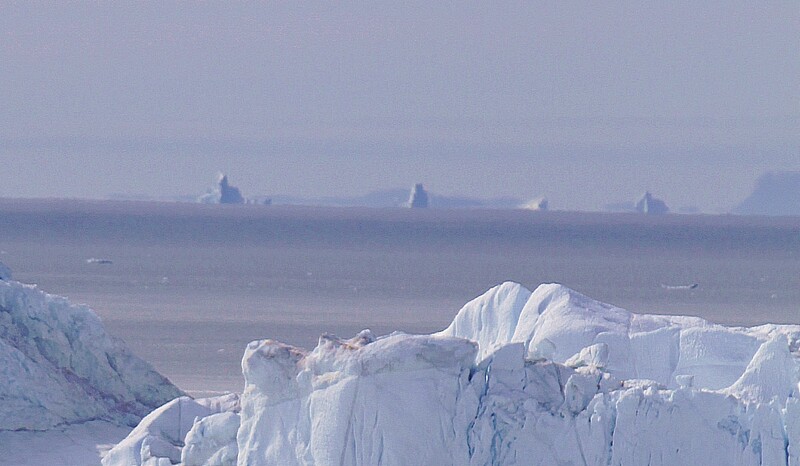 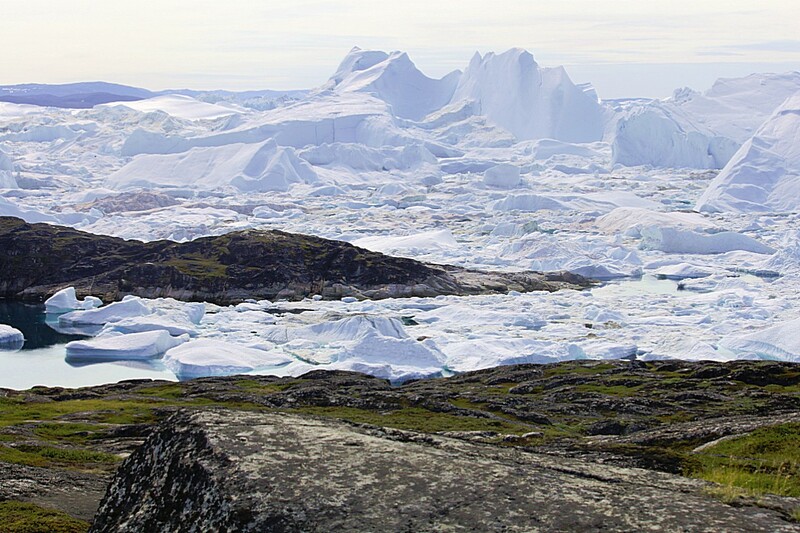 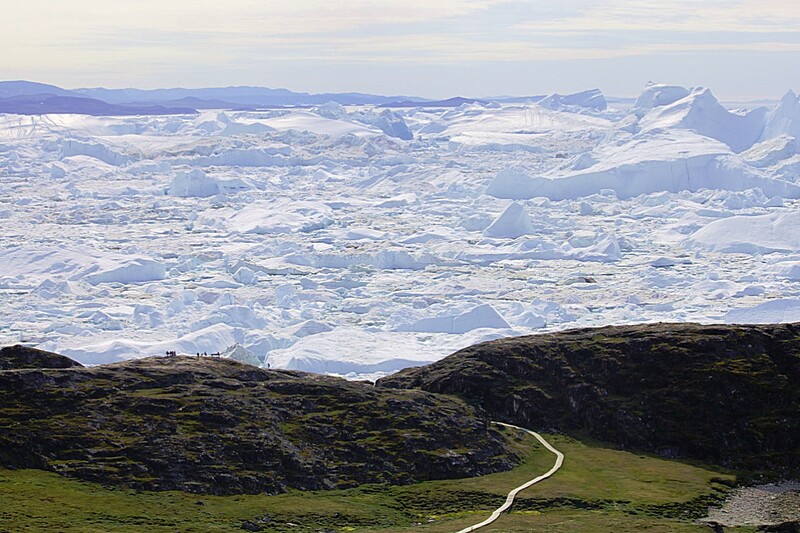 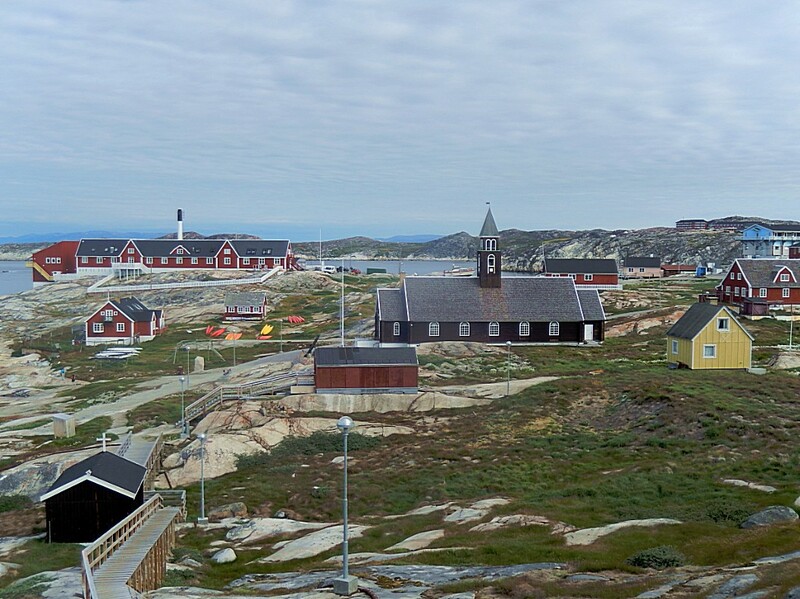 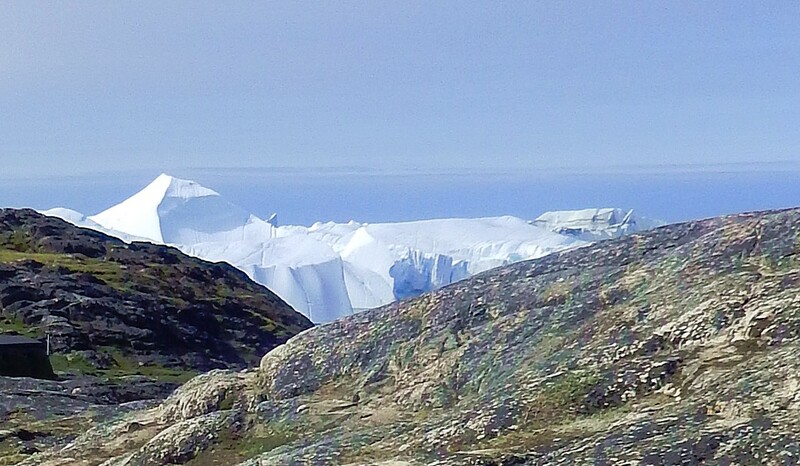 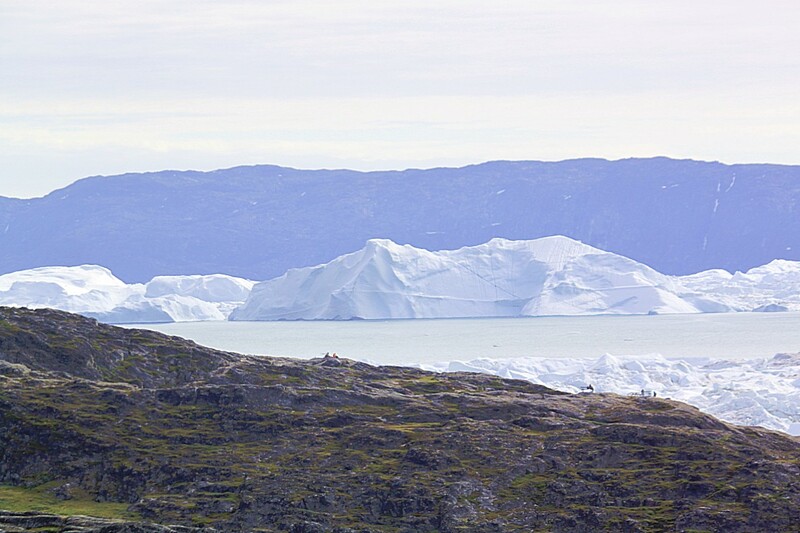 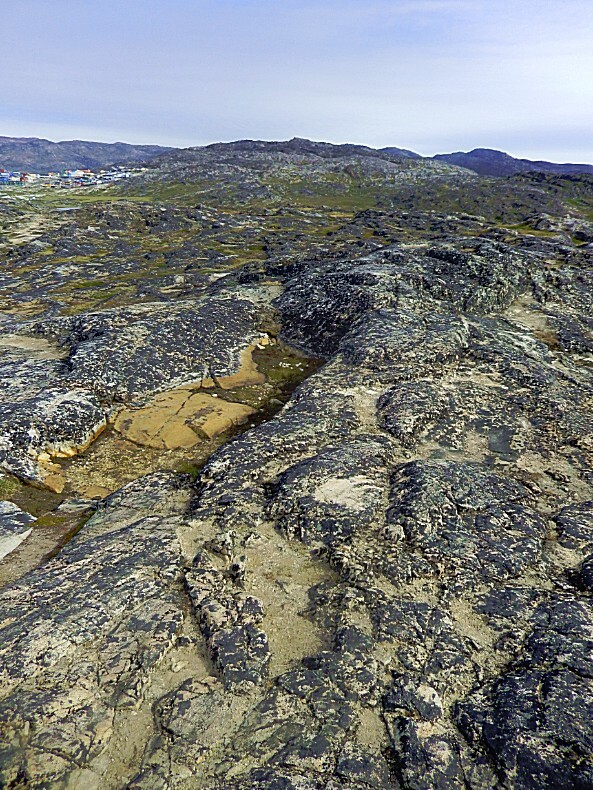 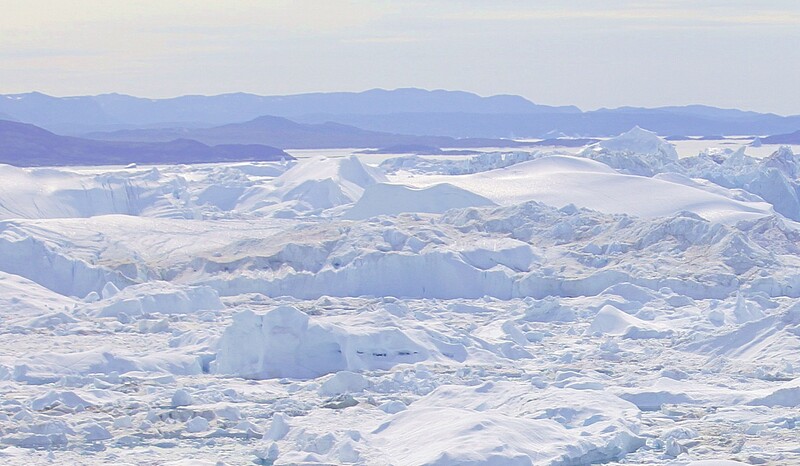 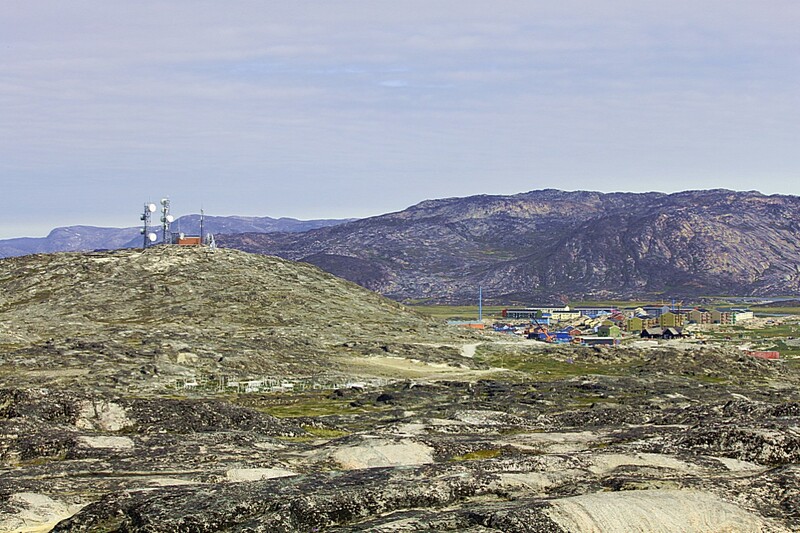 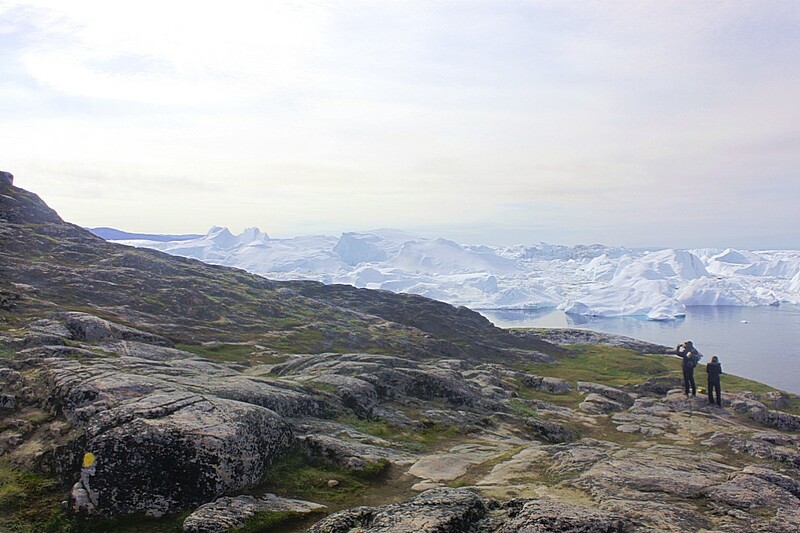 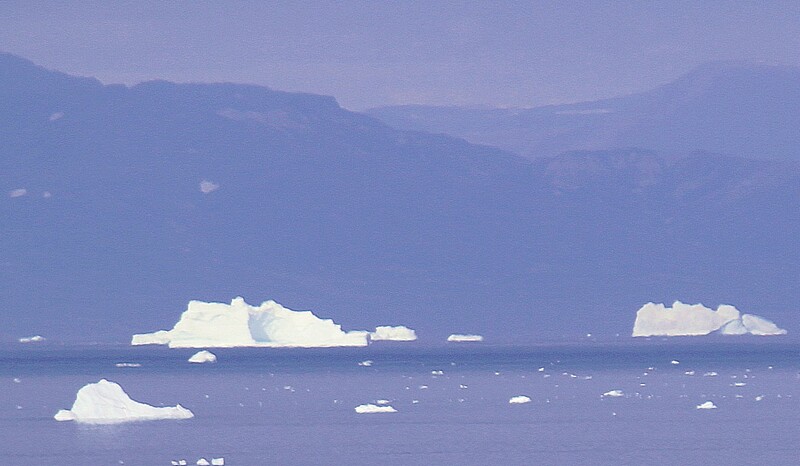 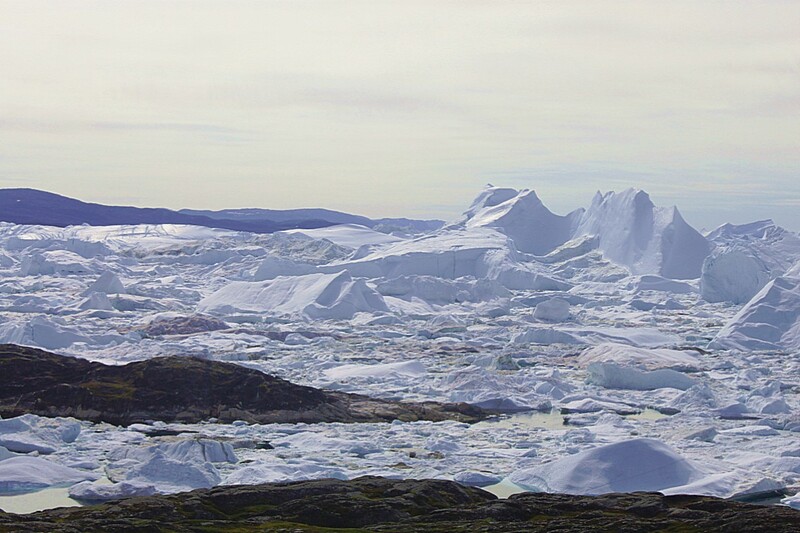 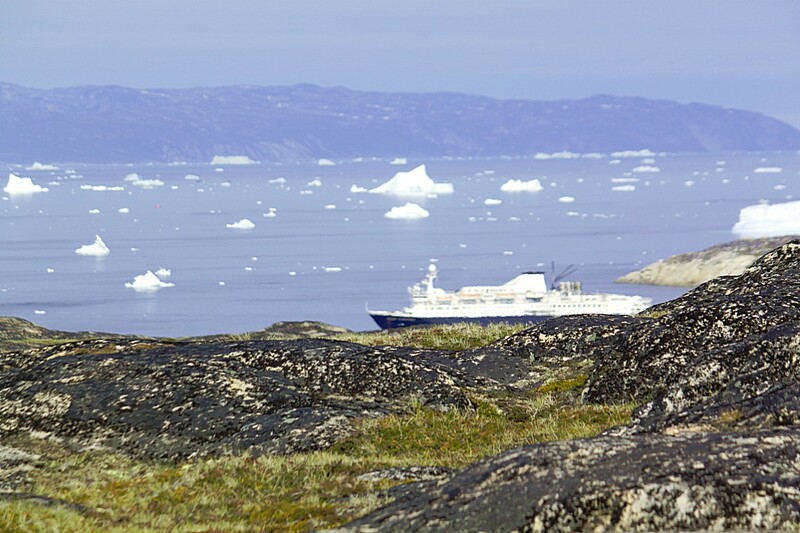 And then The Wandelgek walked back towards Ilulissat and the GL Heliport. 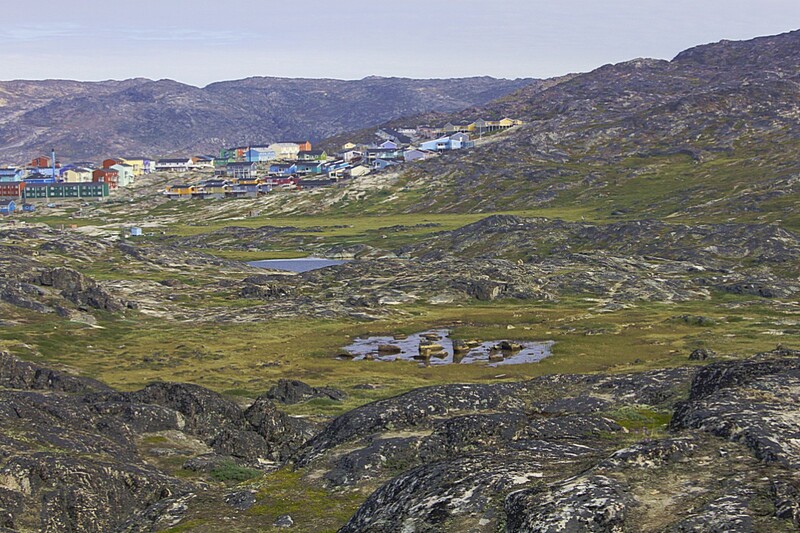 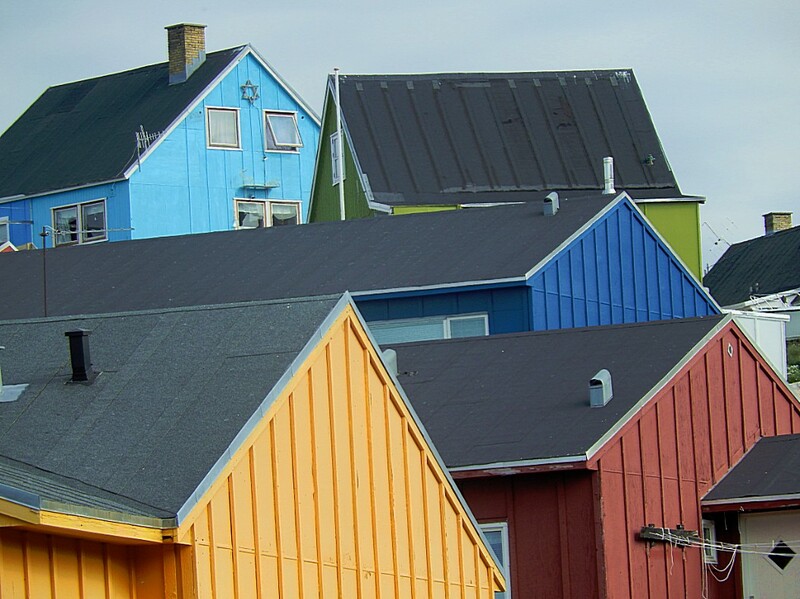 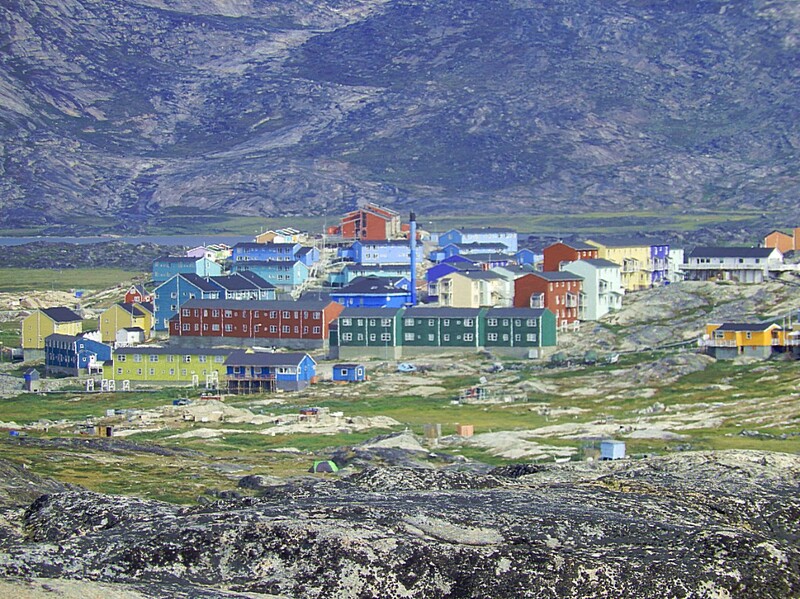 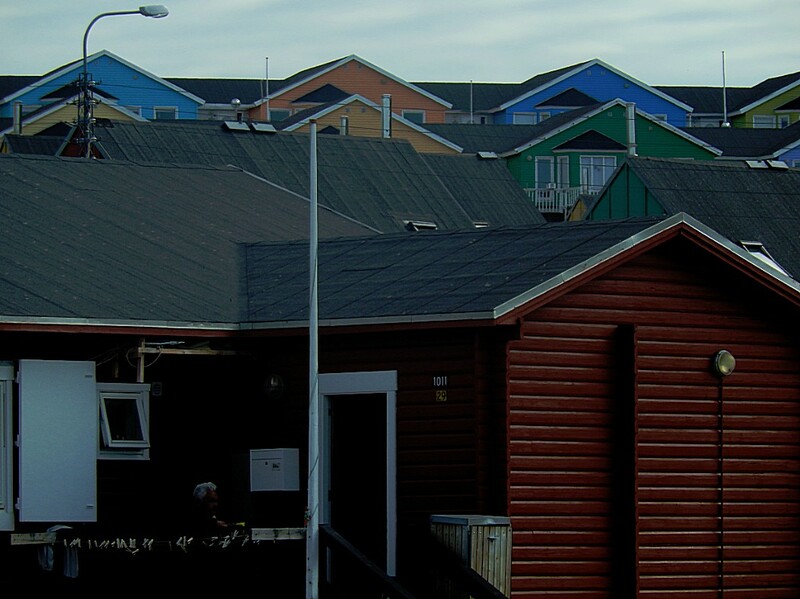 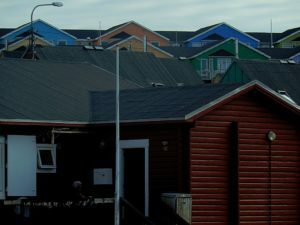 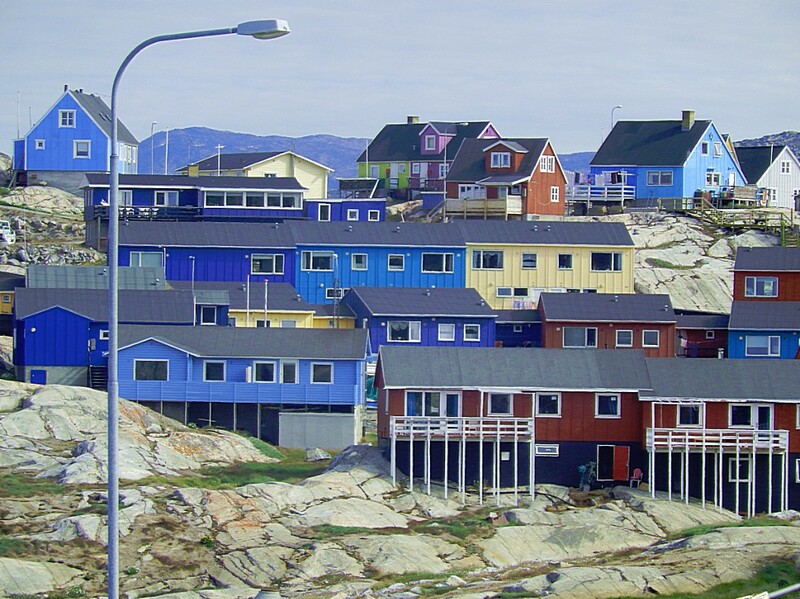 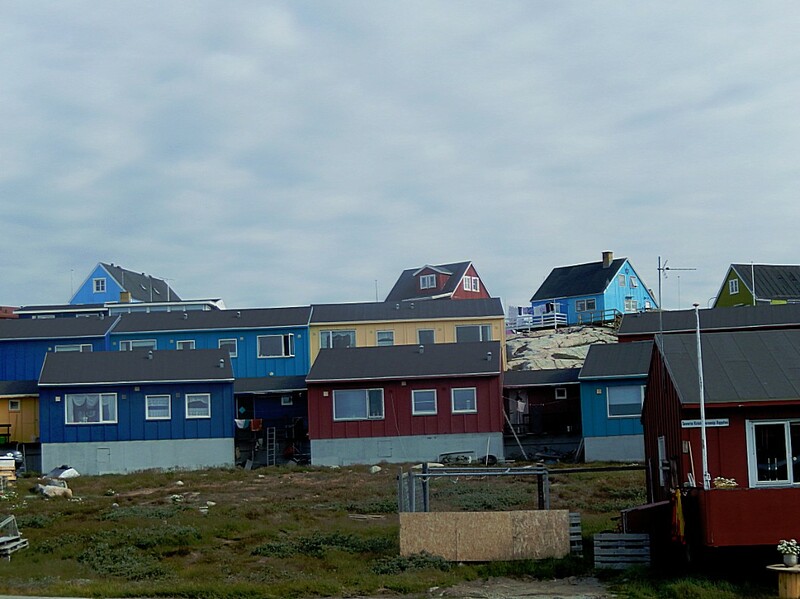 The small colorful cabins in front are sled dog cabins. 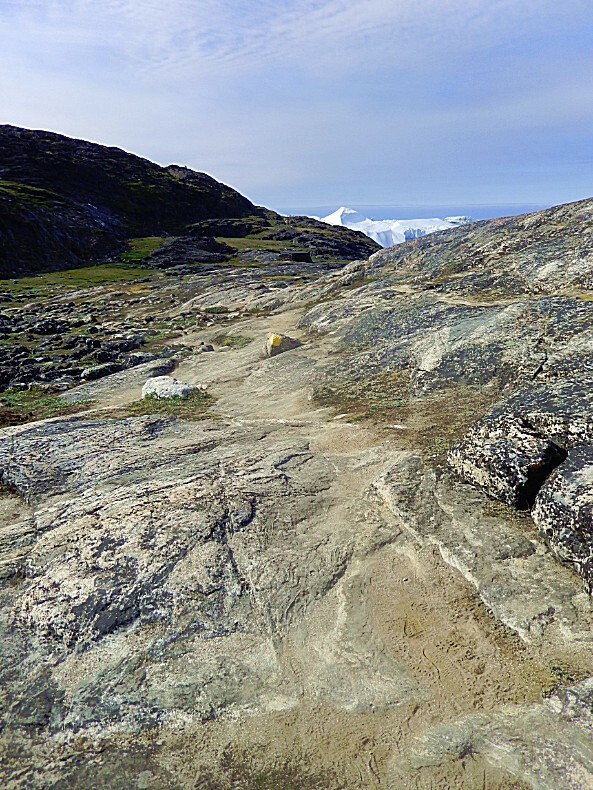 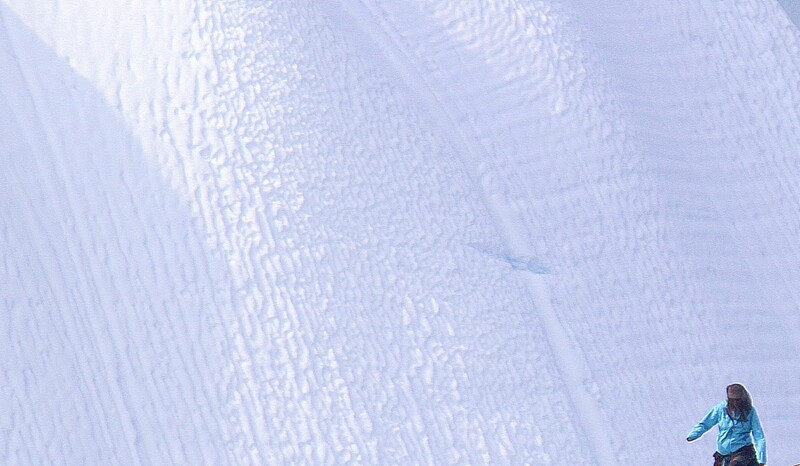 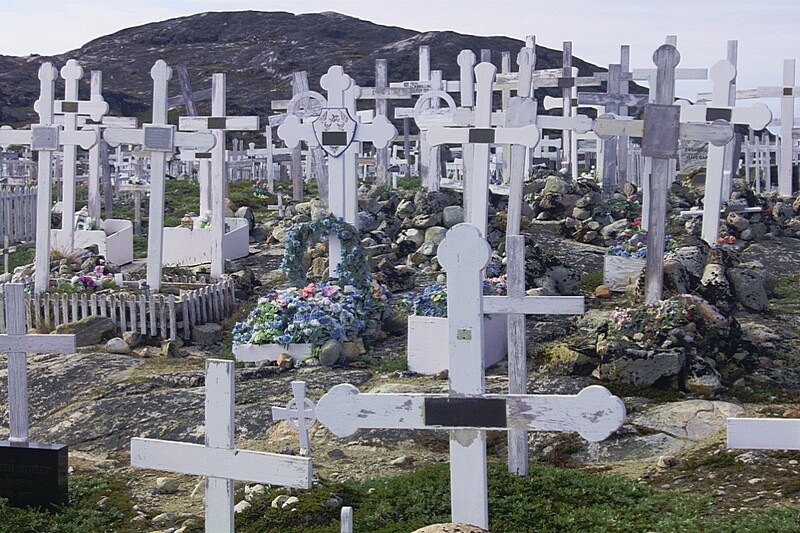 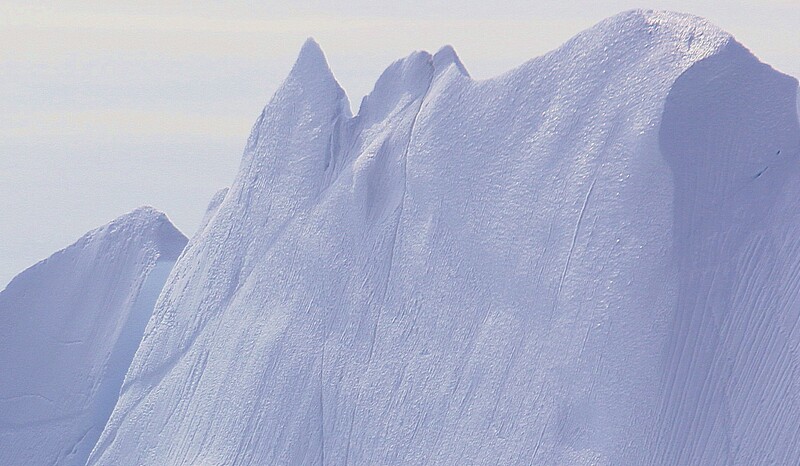 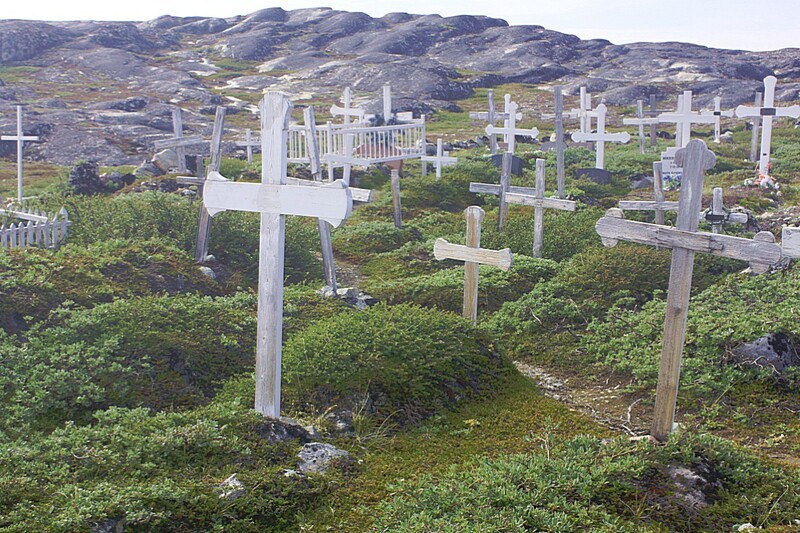 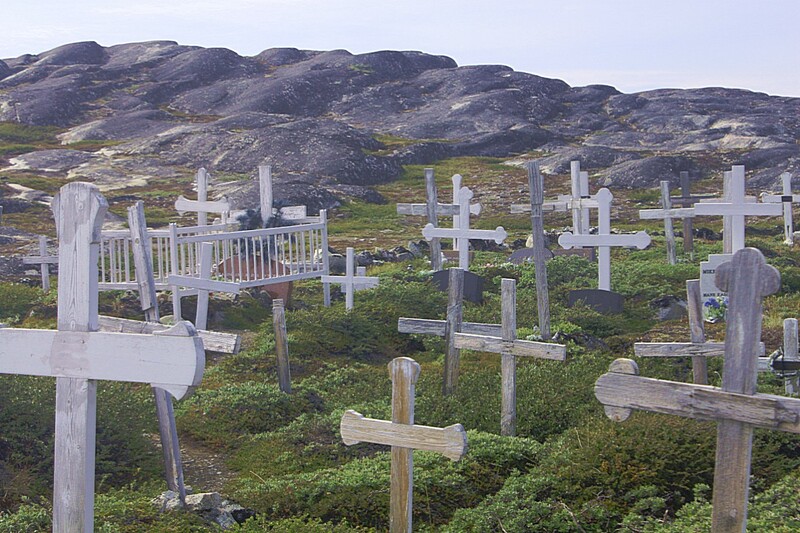 In Greenland the law says that you cannot keep sled dogs south of the polar circle and north of the polar circle it is prohibited to keep sled dogs in residential areas. 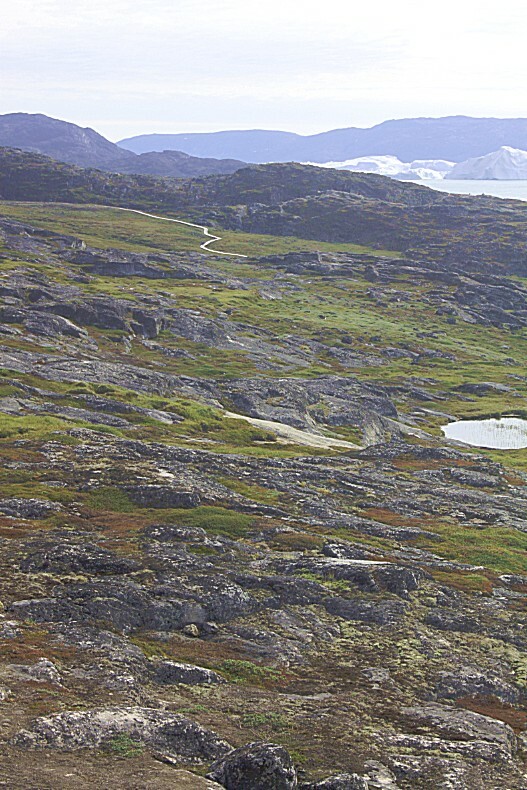 Sled dogs look cute and appear to be like the dogs we have as pets in Europe, but they are not. 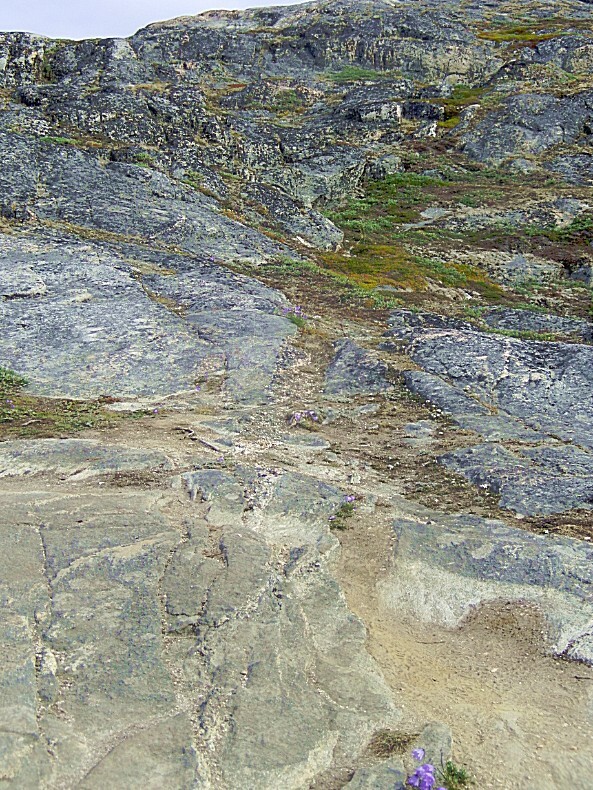 They are not wild animals either, but they do have wild tendencies that can’t be surpressed. 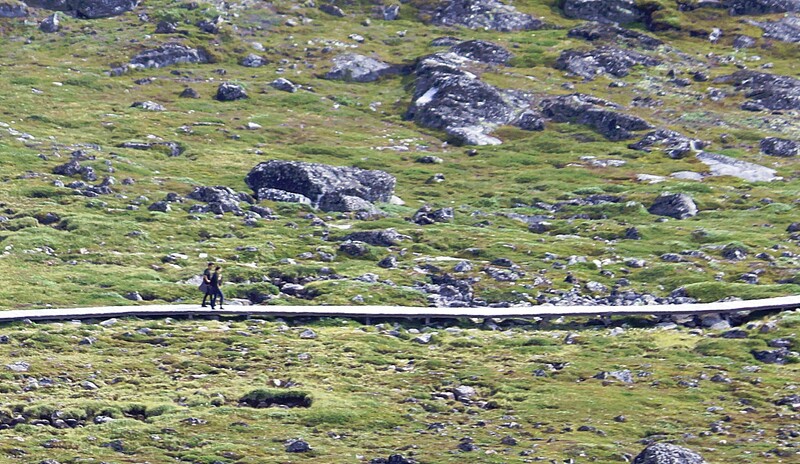 This means you shoud not get close to them without a trainer as your guide. 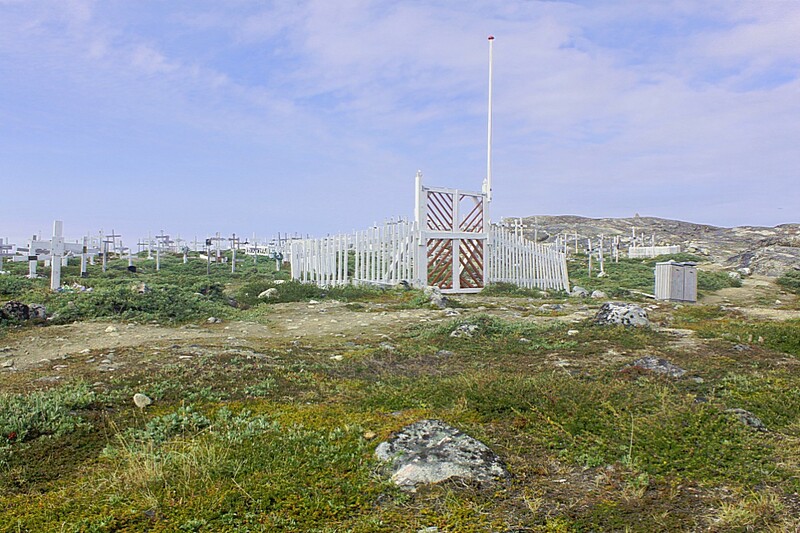 The dogs are kept in special dog areas during summer, where they are shackled to a long chain which gives them some space to move and get close to other neighbouring dogs. 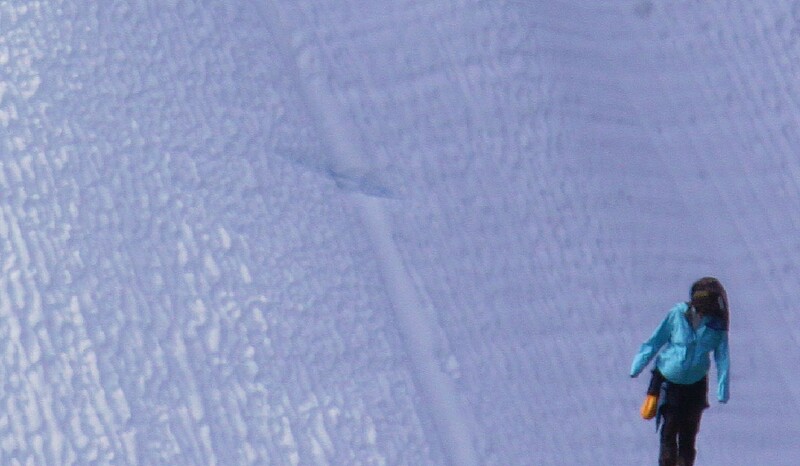 Close but not too close. They have a dog house and dog keepers provide them with enough food. 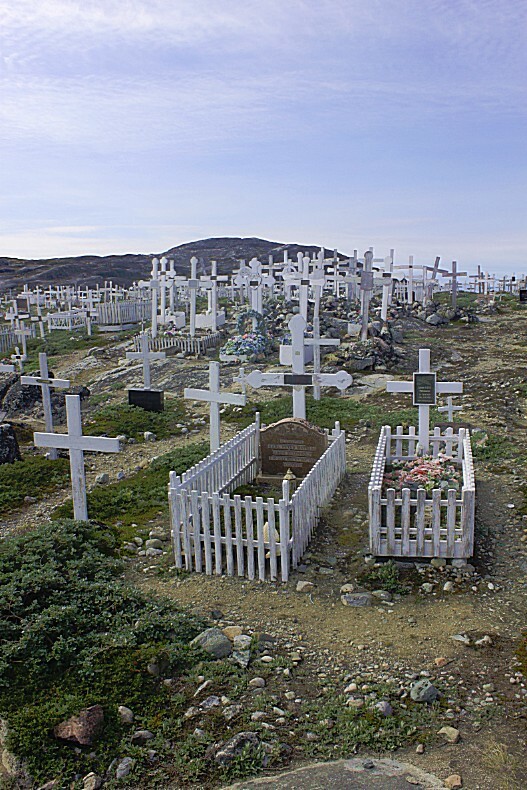 The reason why they were removed from the residential areas were some gruesome child deaths, caused by the dogs. 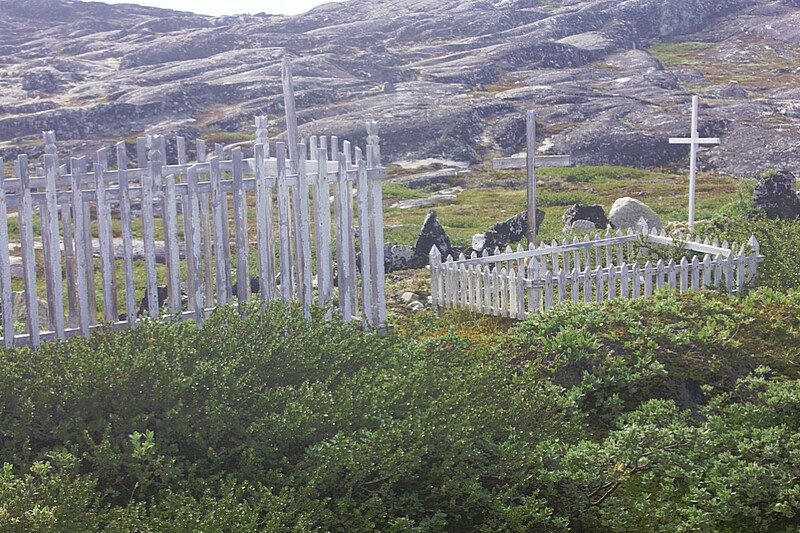 Playgrounds at schools had to be protected with wooden fences agaist the dogs and on graveyards, graves had to be protected by wooden fences too, because the dogs would delve for bones. 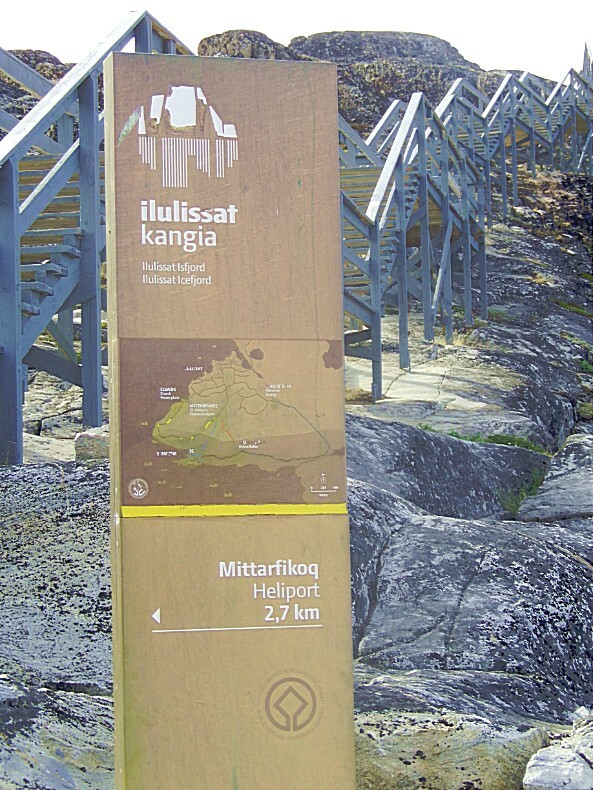 Far beneath, the wooden World Heritage trail also led to the GL Heliport. 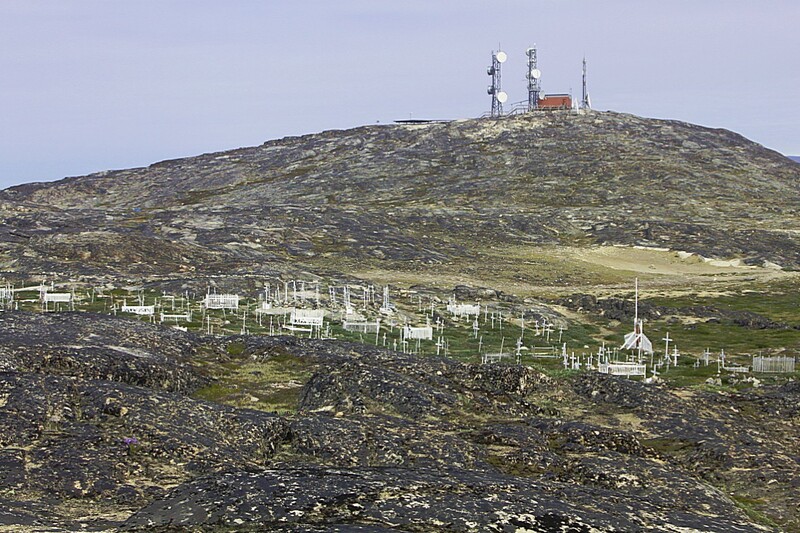 In the shadow of the hill where the communication station was build, was an old cemetery (7 on the elevation diagram) (there was a new cemetry on the other side of the town near the Airport). 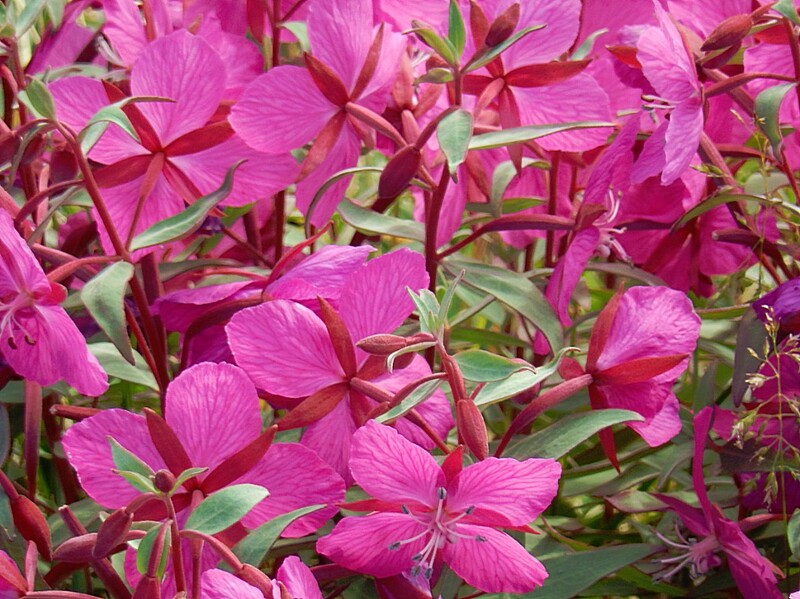 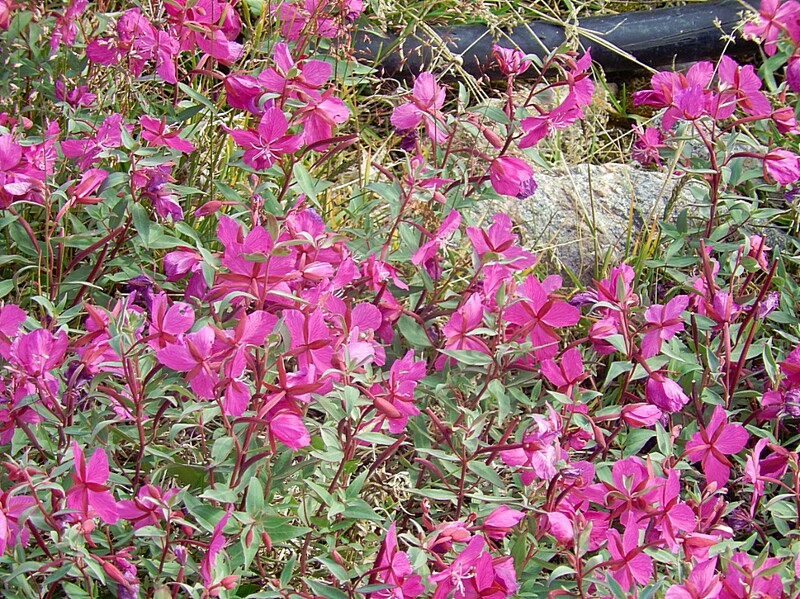 The dwarf fireweed or river beauty willowherb blooms in July and August and can reach a length of 15 to 40 centimetres. 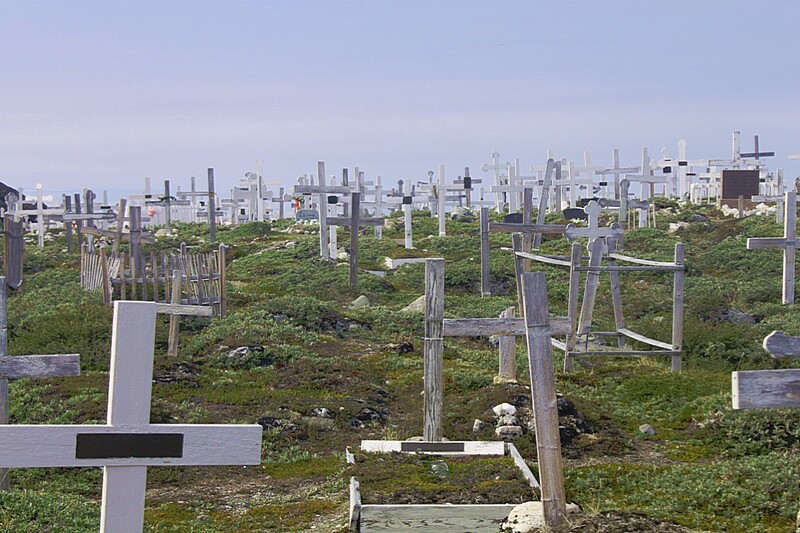 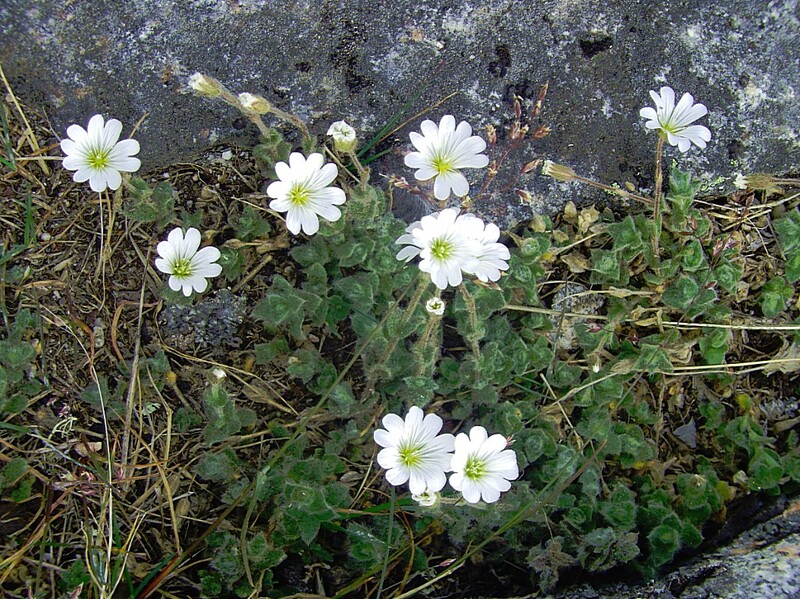 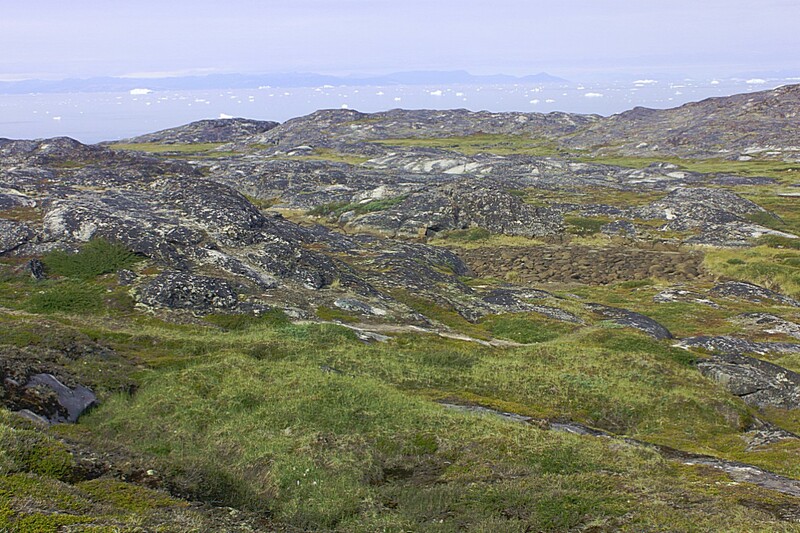 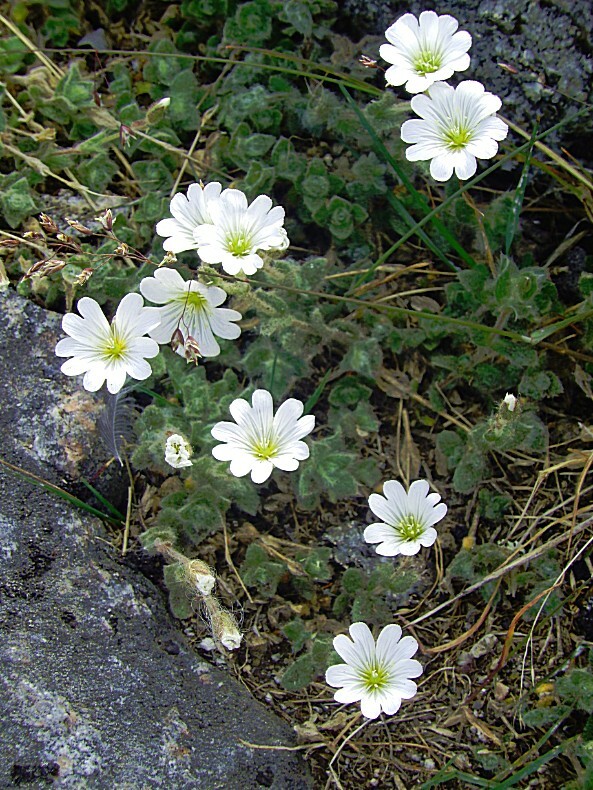 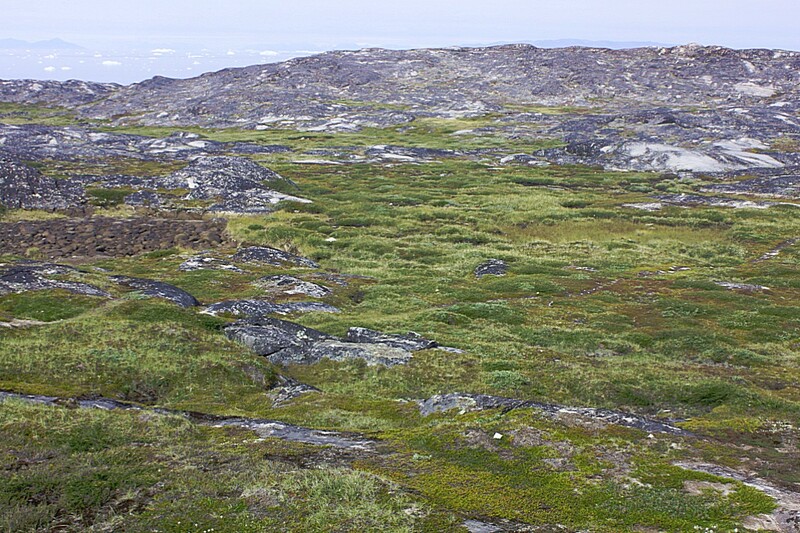 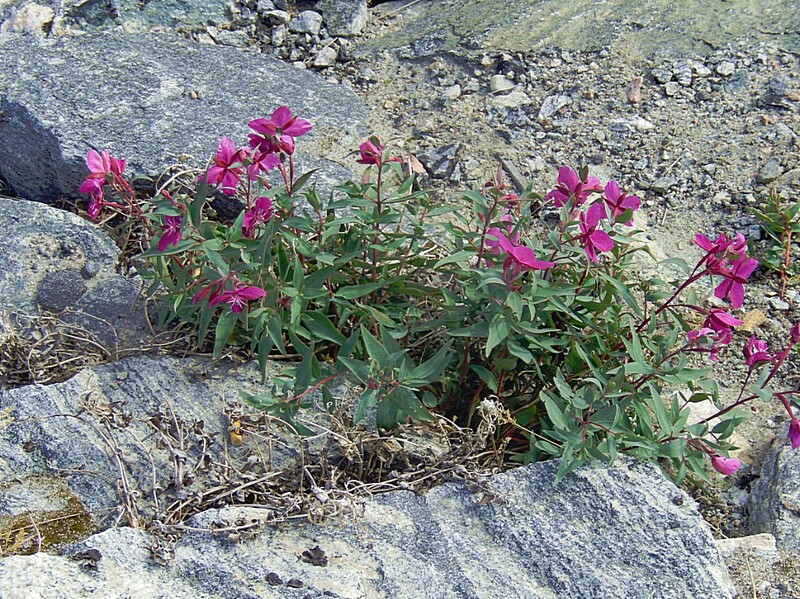 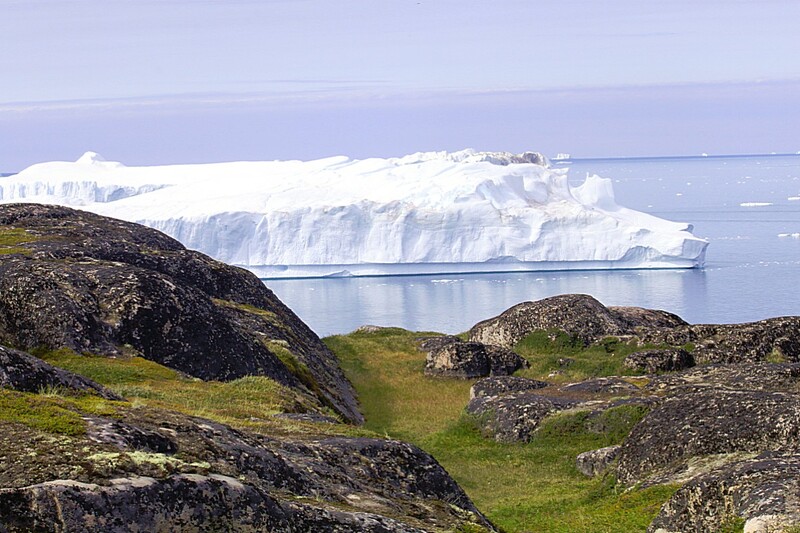 This arctic plant provides valuable nutrition for the Inuit, who eat the leaves raw, boiled with fat, or steeped in water for tea, the flowers and fruits raw, and as a salad with meals of seal and walrus blubber. 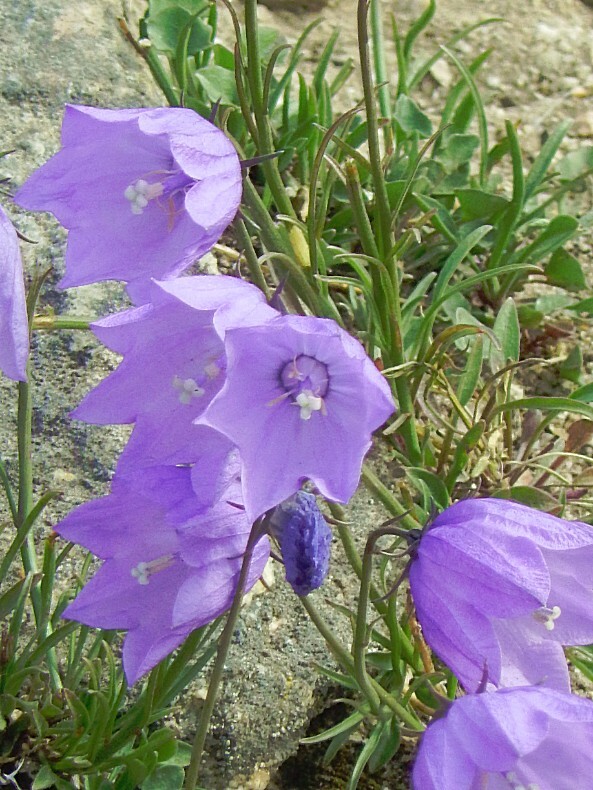 Every part of this plant is edible, tasting much like spinach, and is also known in the Canadian tundra as River Beauty. 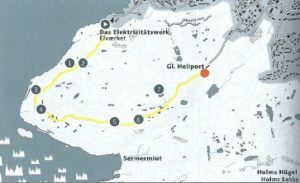 Then The Wandelgek had reached the end of the Yellow trail at the Heliport.